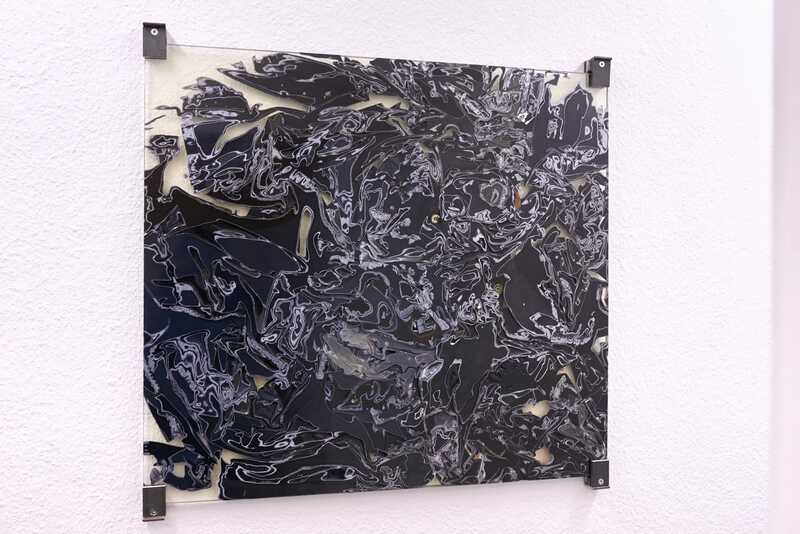 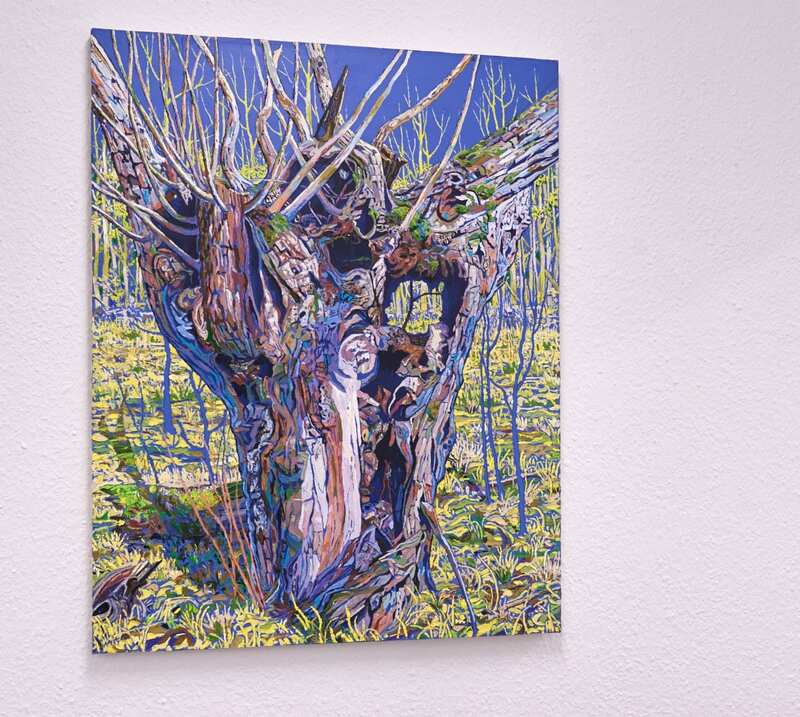 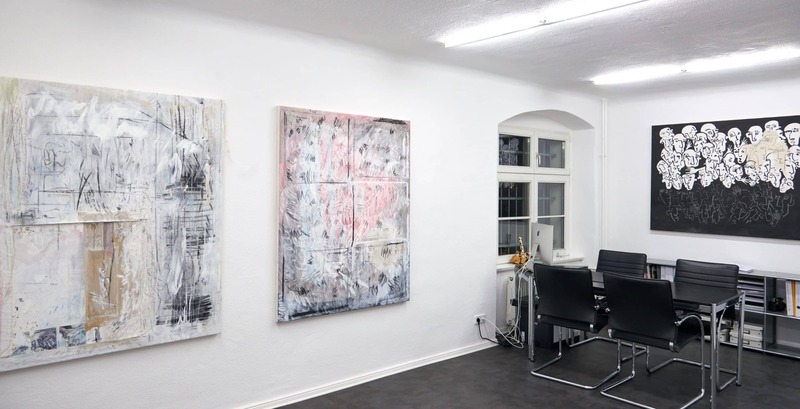 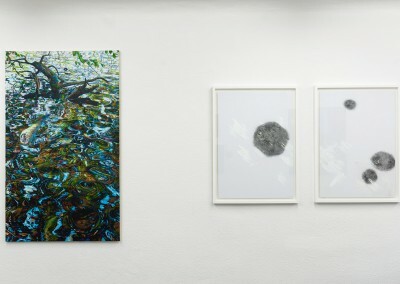 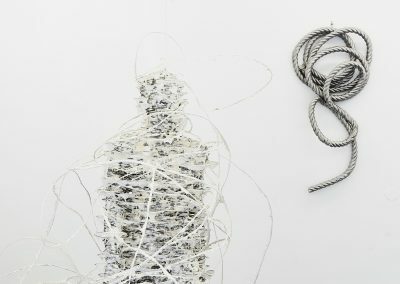 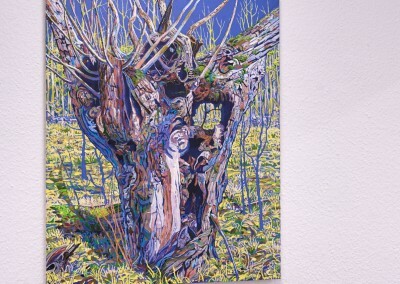 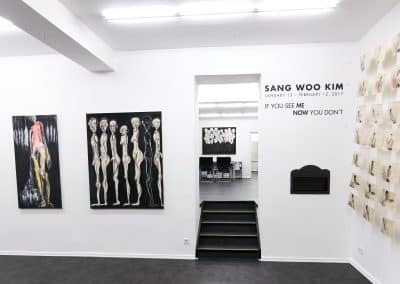 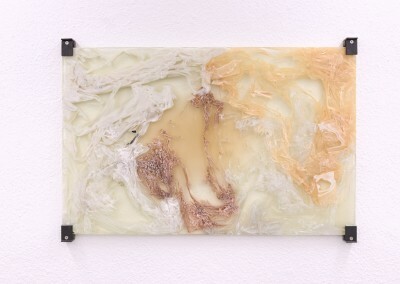 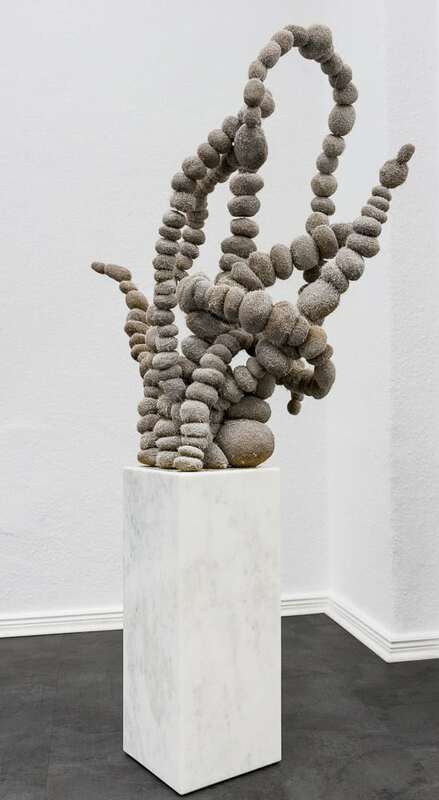 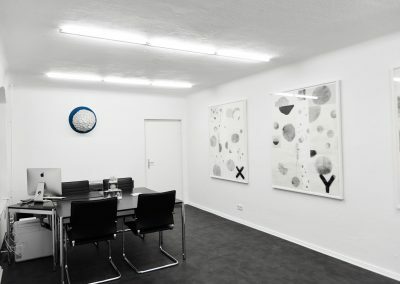 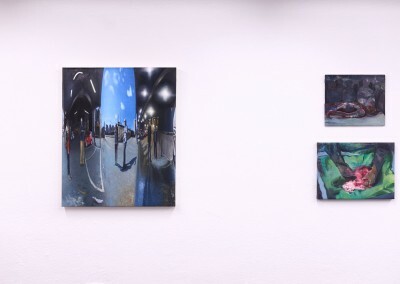 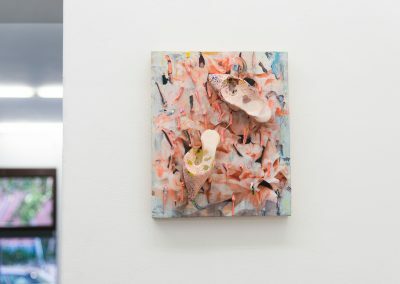 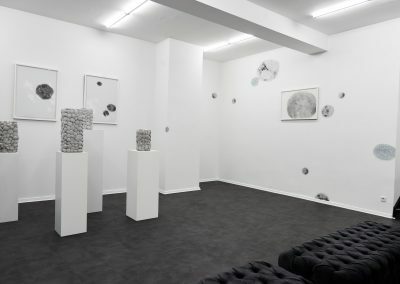 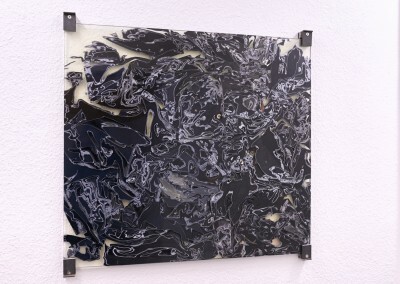 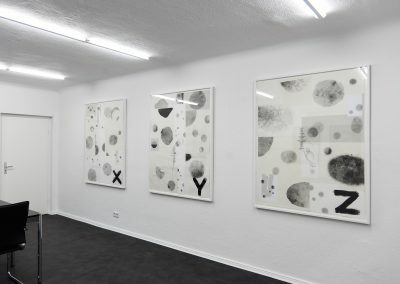 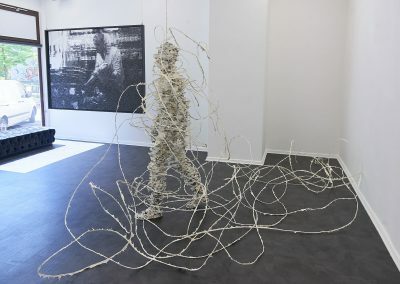 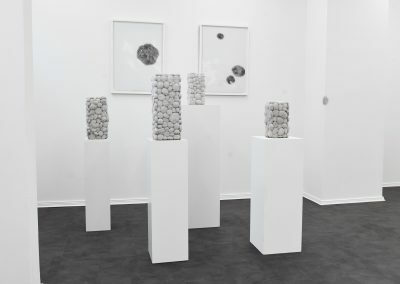 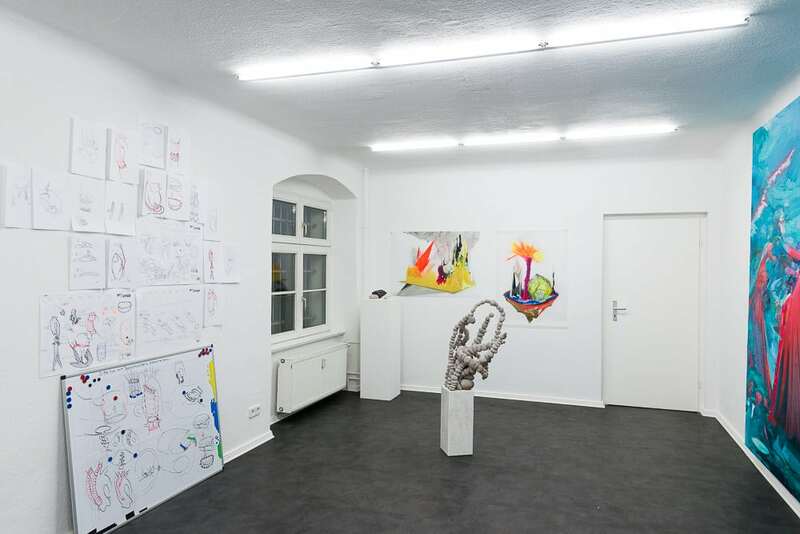 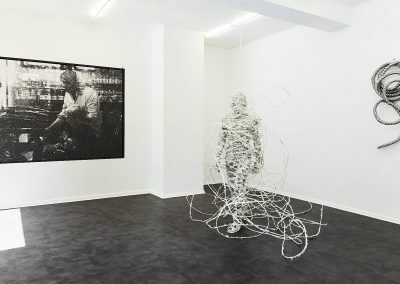 Vernissage: Friday, APRIL 27, 6 – 9 p.m.
Magic Beans is pleased to present Seungmo Park´s first solo exhibition in Berlin. 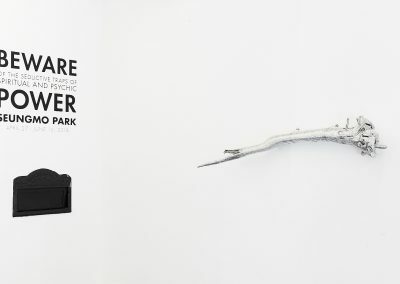 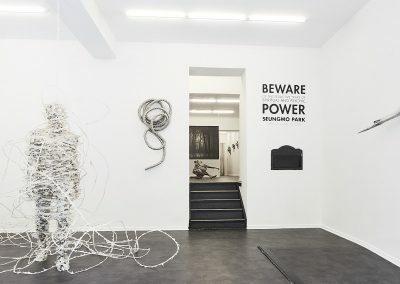 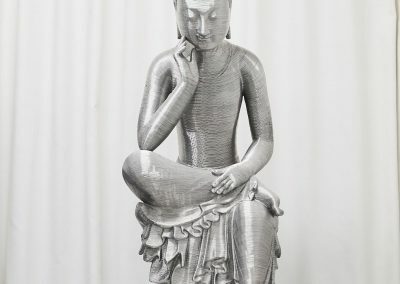 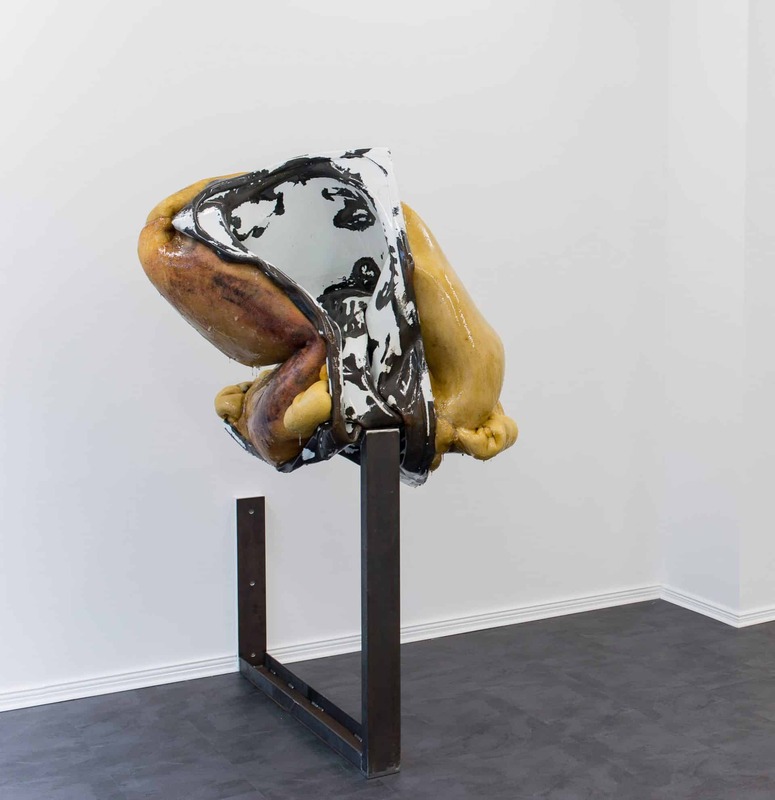 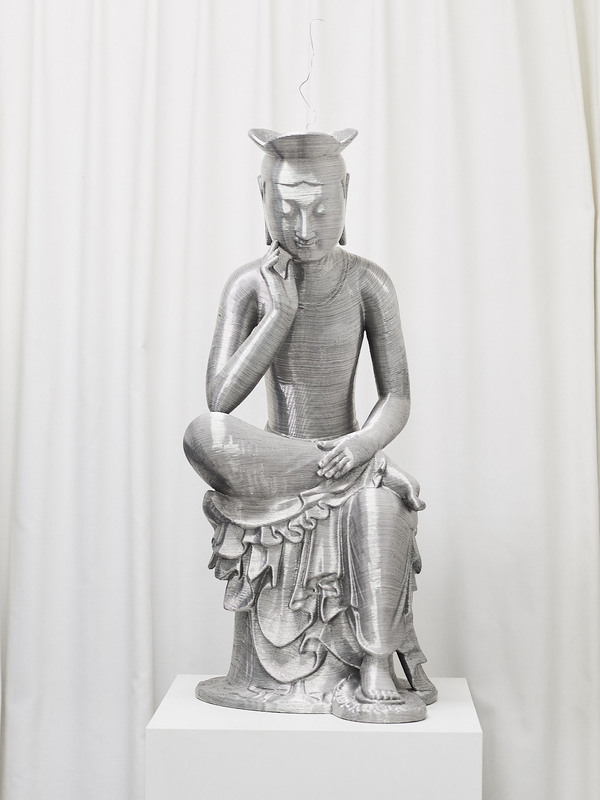 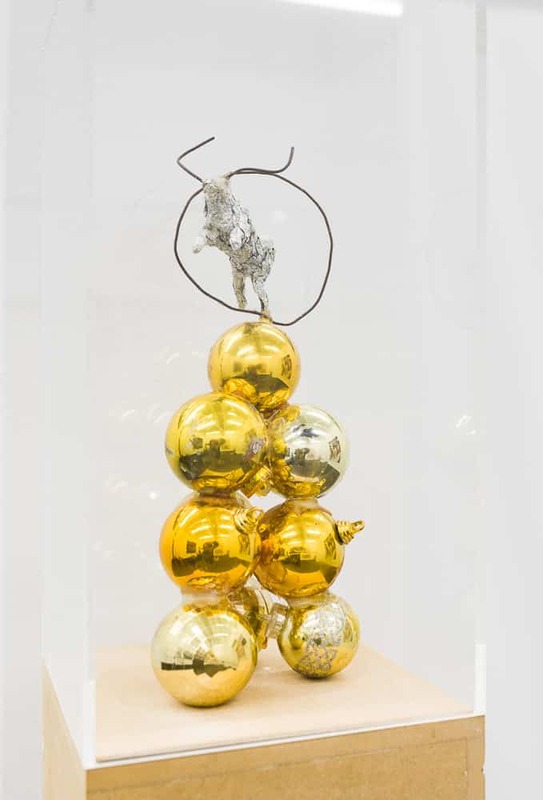 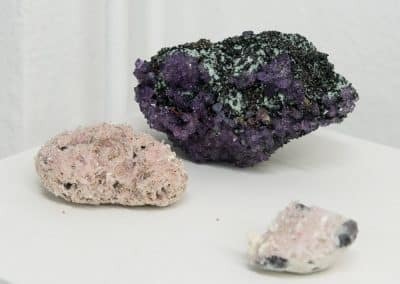 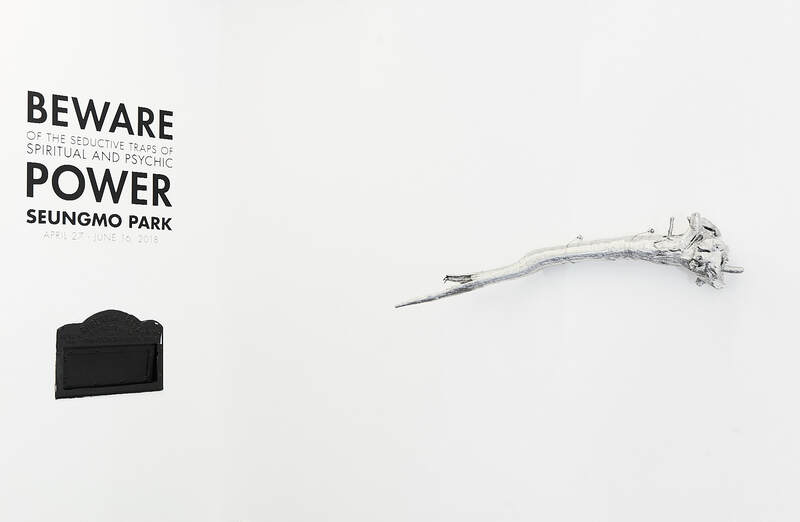 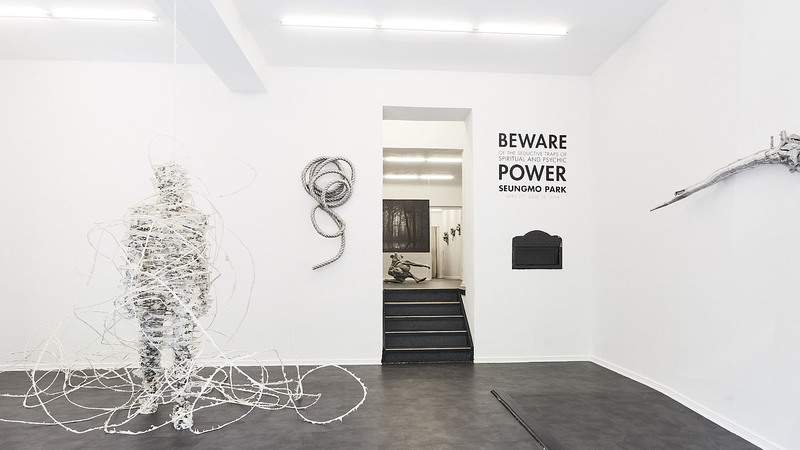 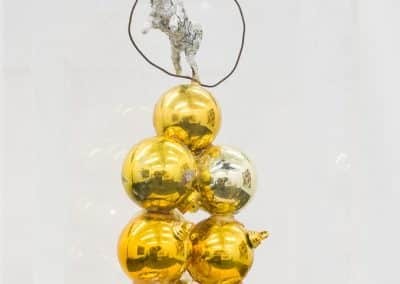 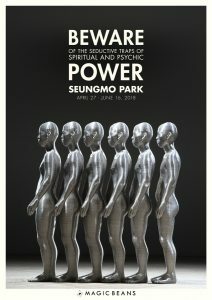 Titled Beware of the Seductive Traps of Spiritual and Psychic Power, the exhibition will be composed of works from several of Park´s diverse series as well as a new sculpture. 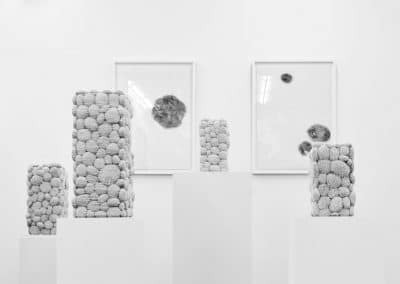 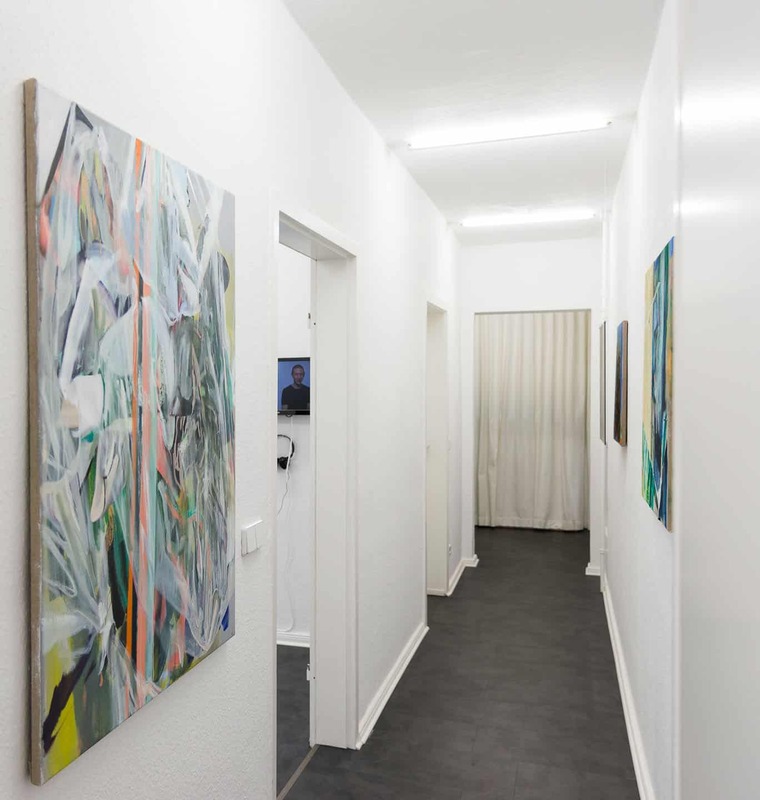 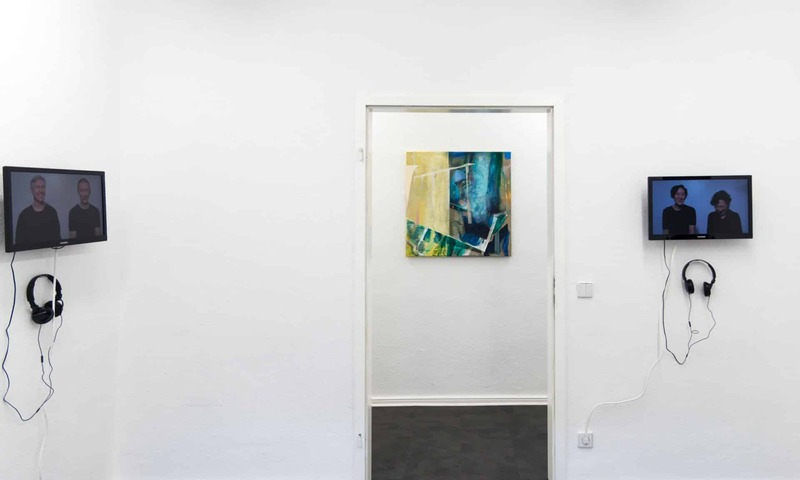 Together, the works present the artist´s engagement with the evanescent properties of seeing and sensing, presenting artworks whose very appearance evinces the transitory nature of perception. 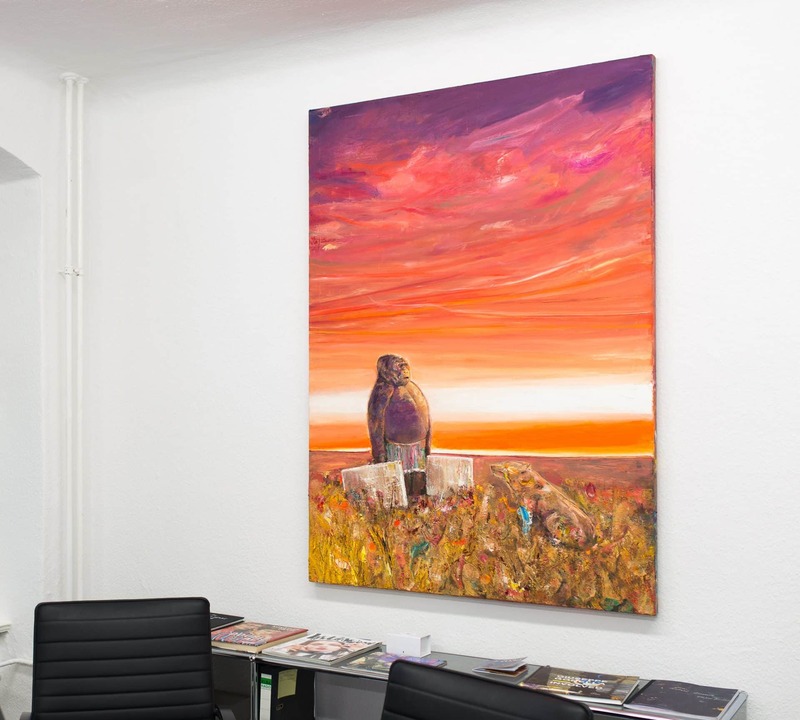 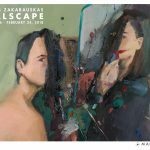 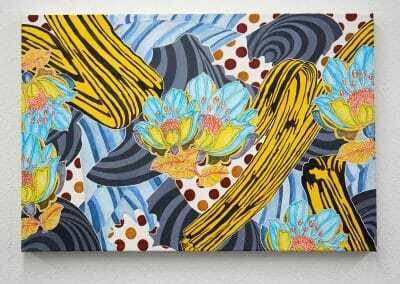 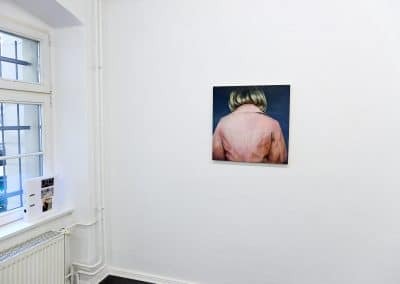 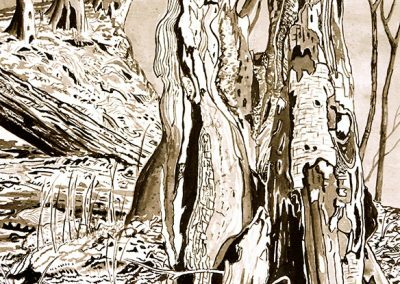 Vernissage: Friday, MARCH 2, 6 – 9 p.m.
Magic Beans Gallery is pleased to present the solo exhibition, WALLSCAPE, by the Lithuanian artist Andrius Zakarauskas. 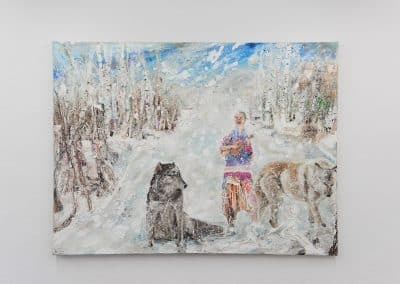 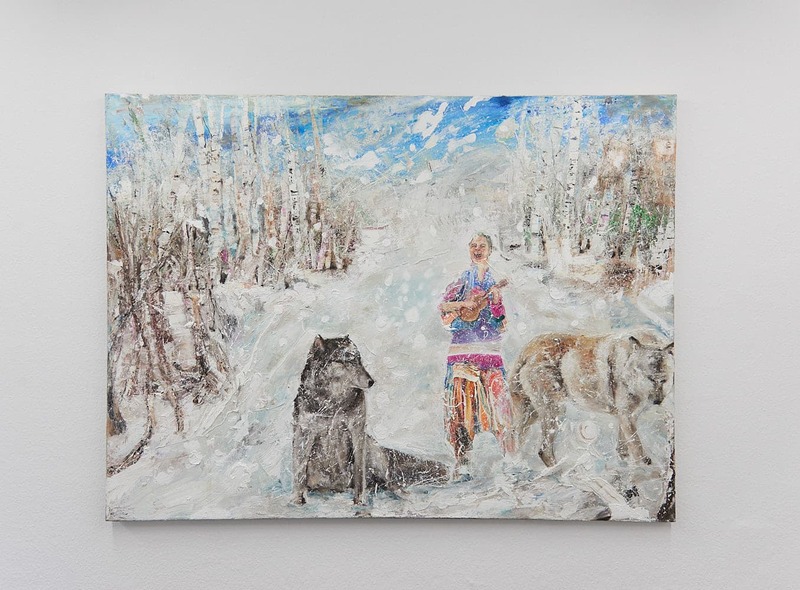 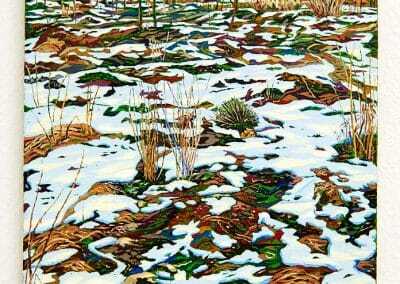 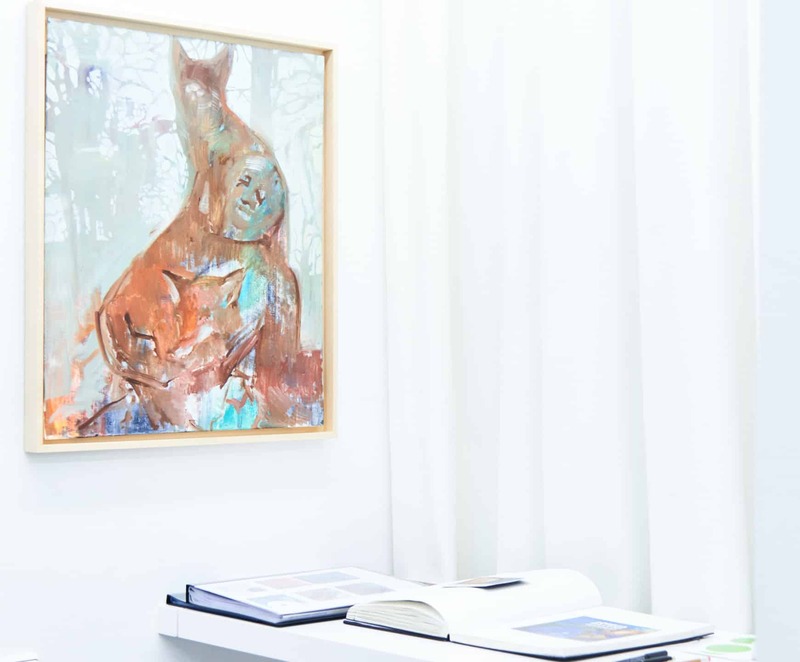 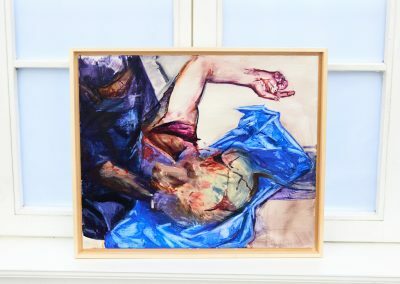 A particular tension is characteristic of Zakarauskas´s work: although his painting is representational and figurative, what exactly is being portrayed is not concrete or clearly defined. 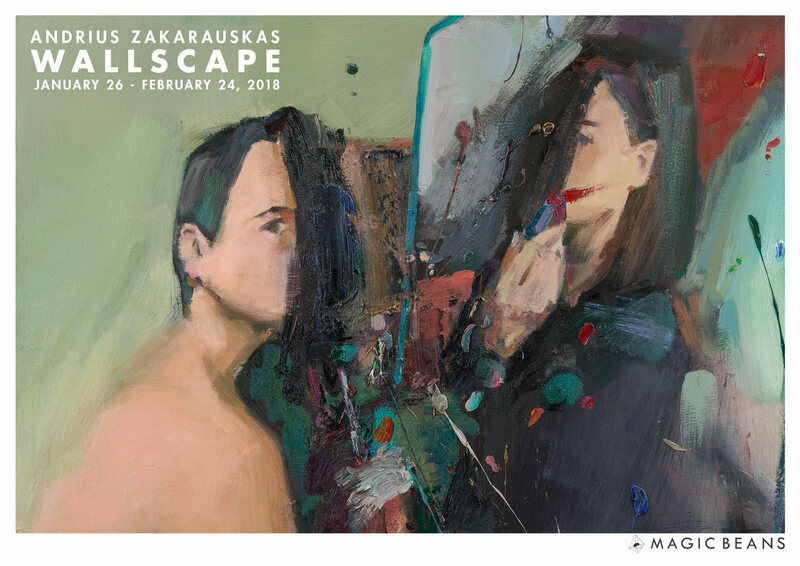 The majority of Zakarauskas´s paintings usually feature self-portraits of the artist with his characteristic posture and even clothing style. 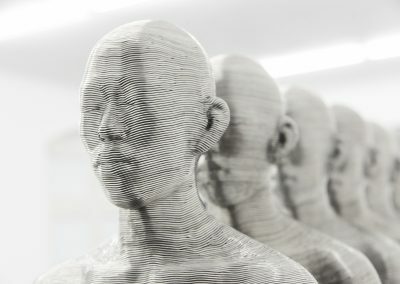 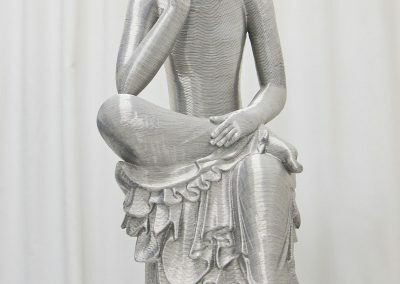 Yet the figures are faceless, including even the artist´s muse. 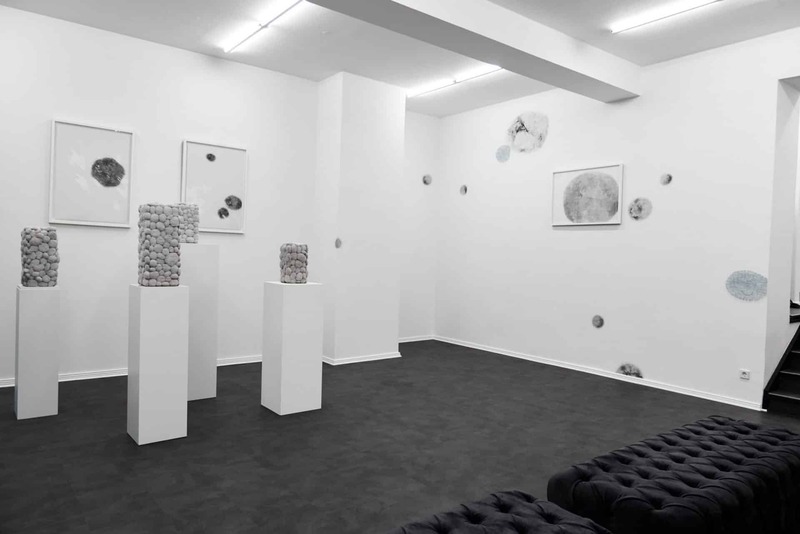 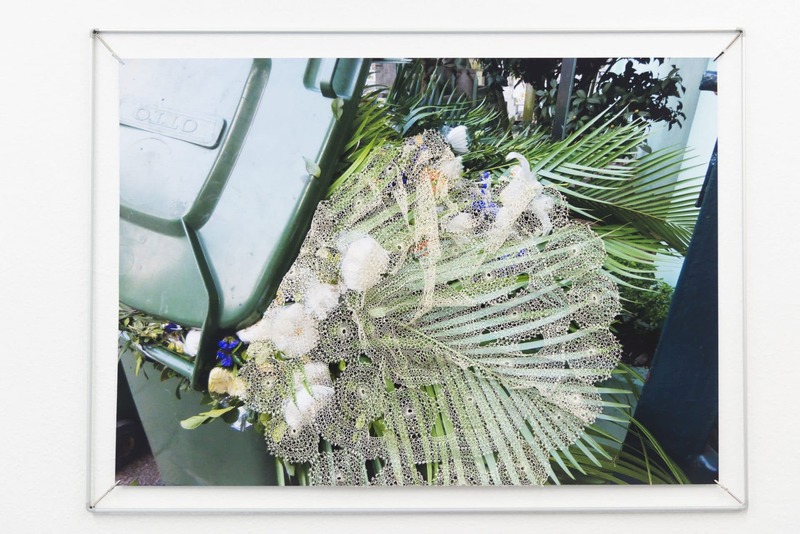 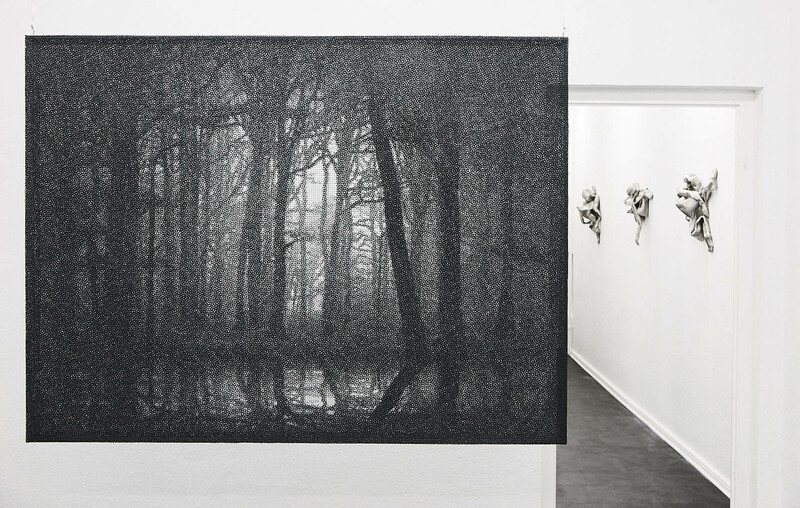 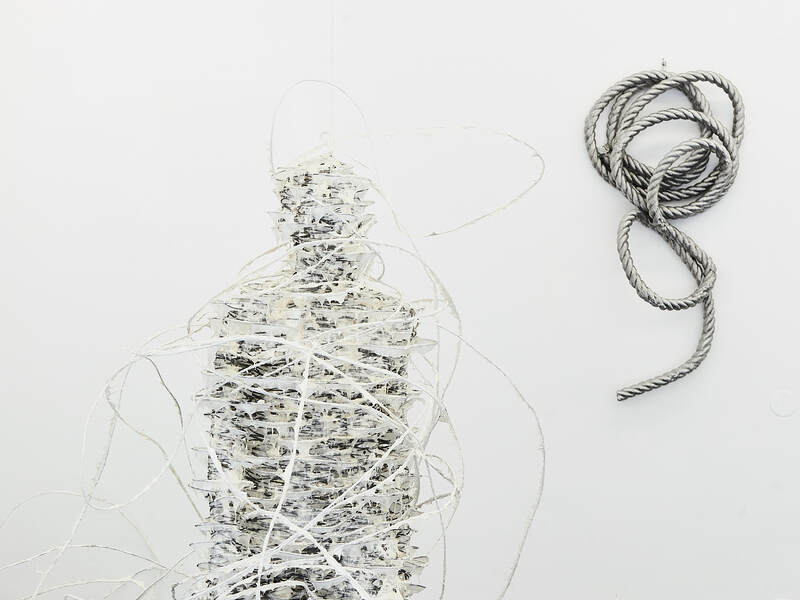 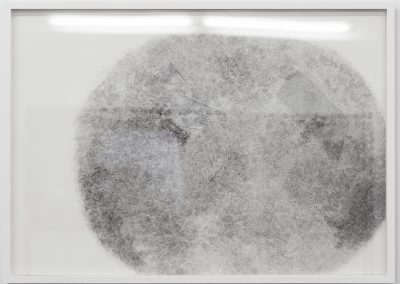 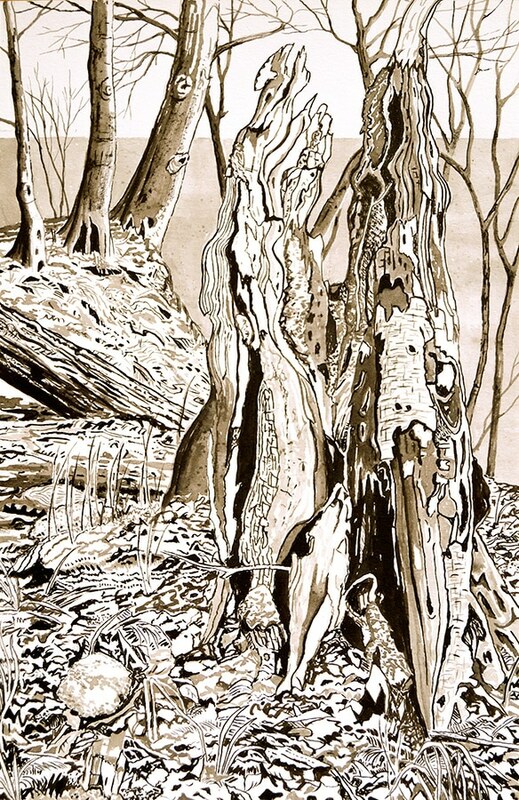 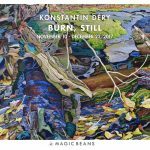 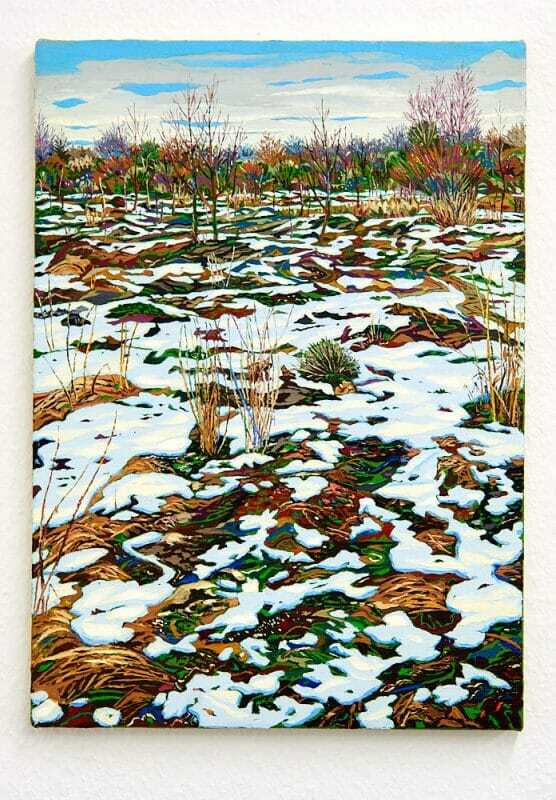 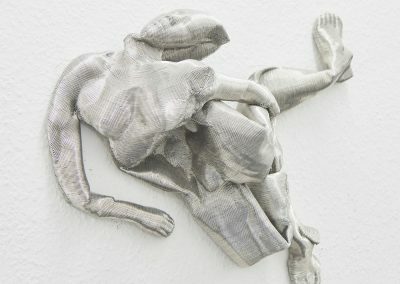 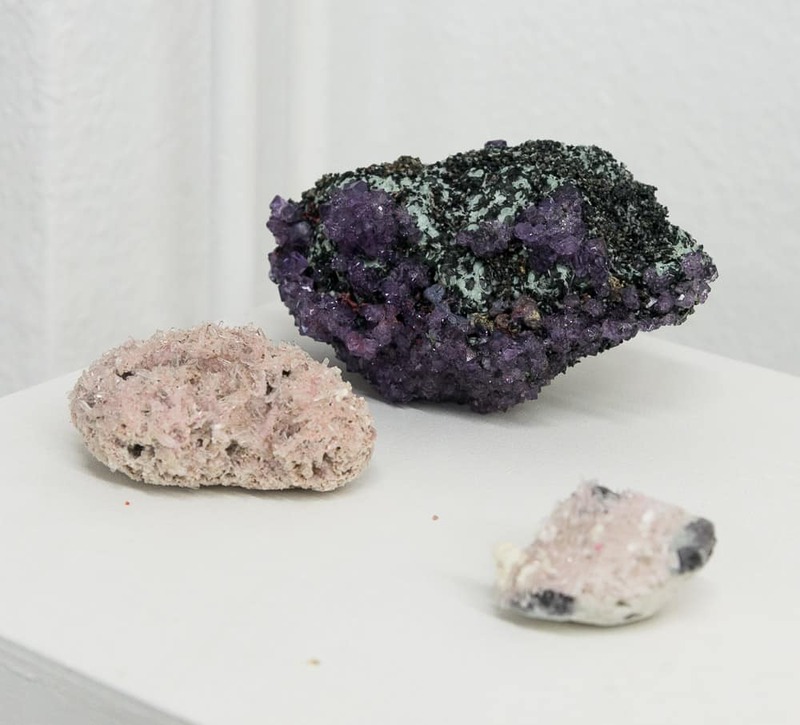 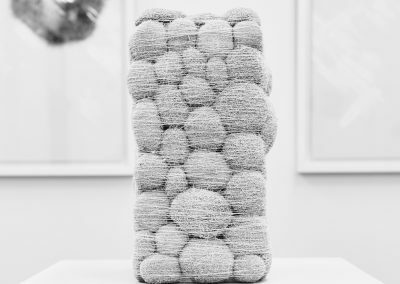 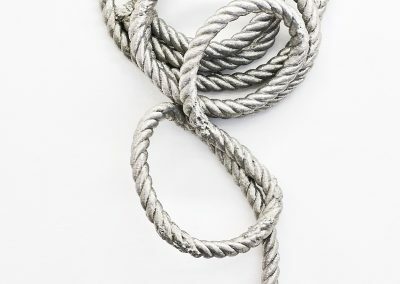 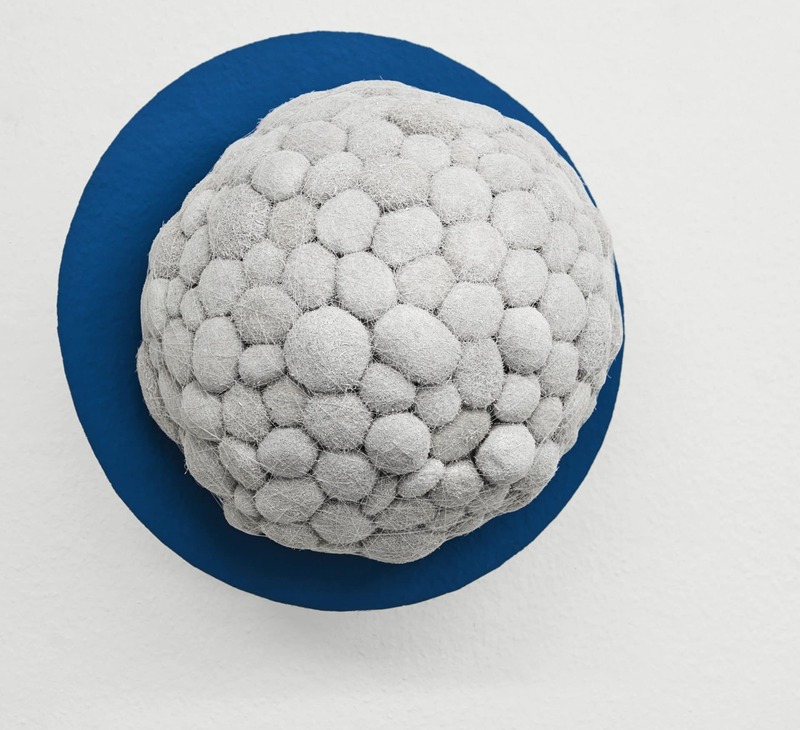 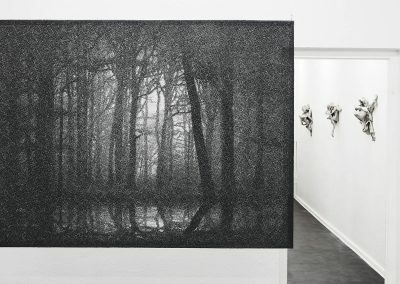 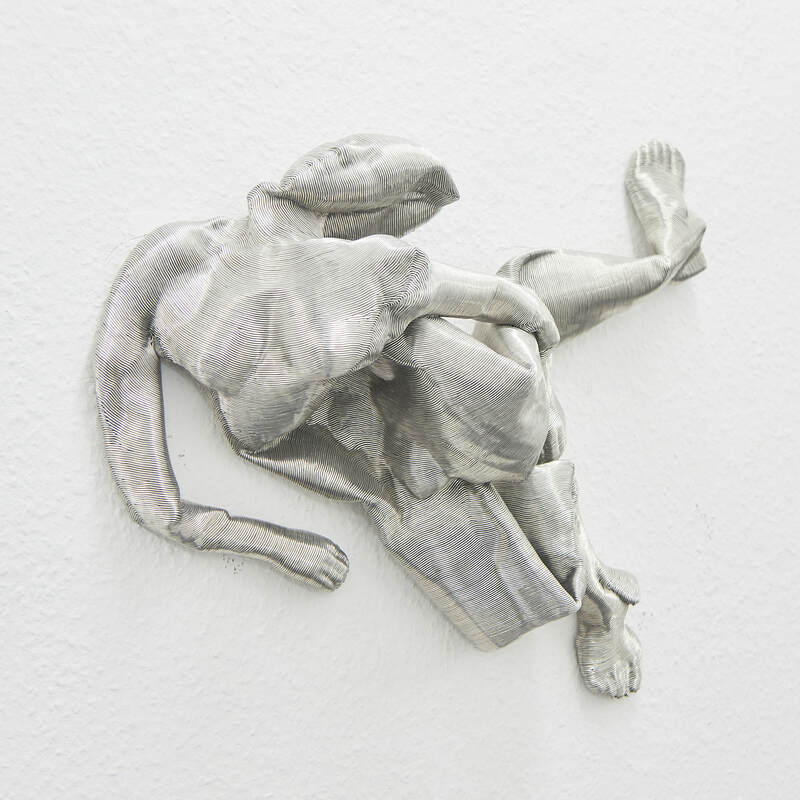 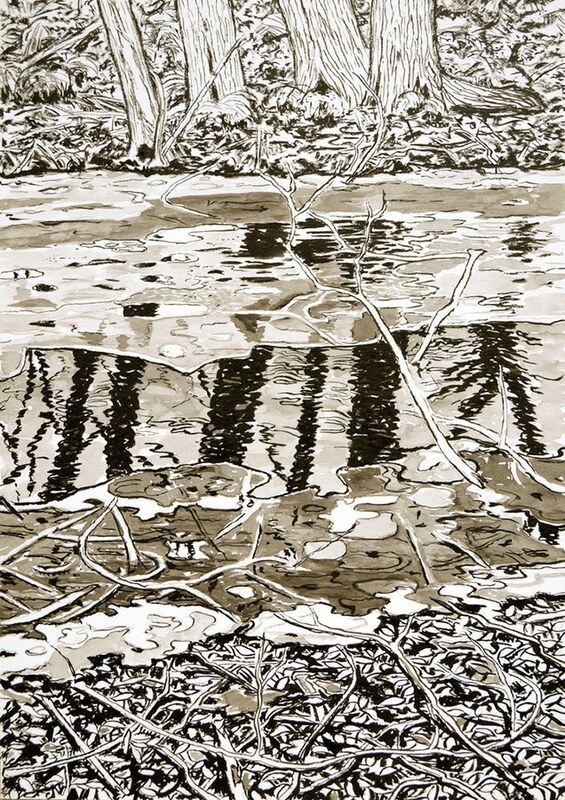 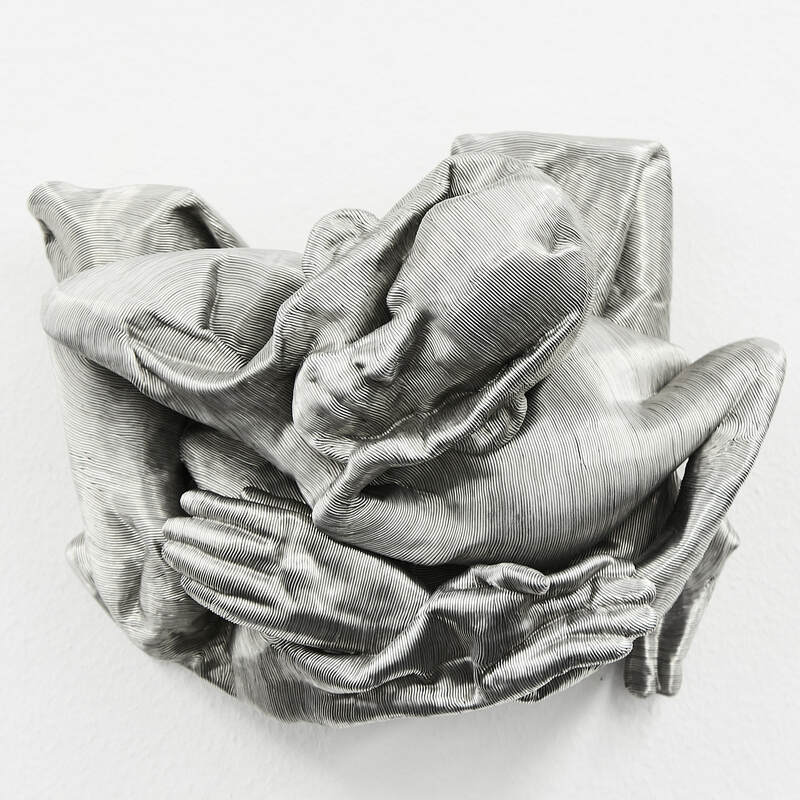 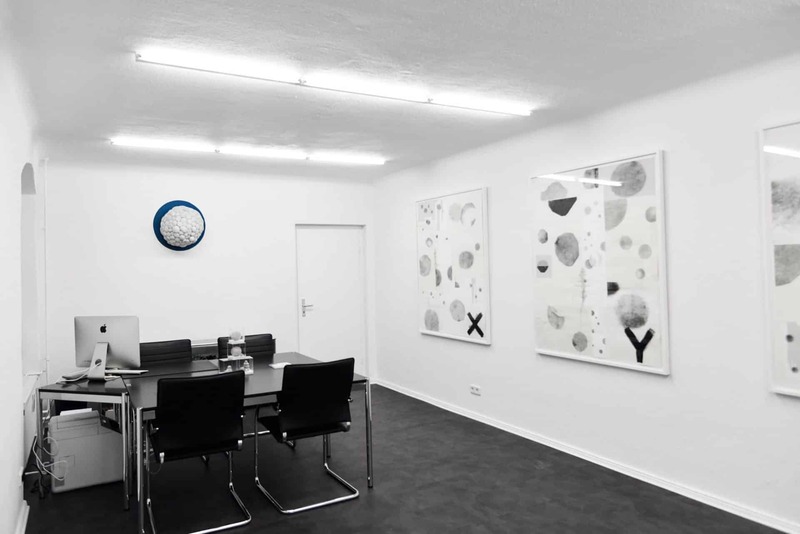 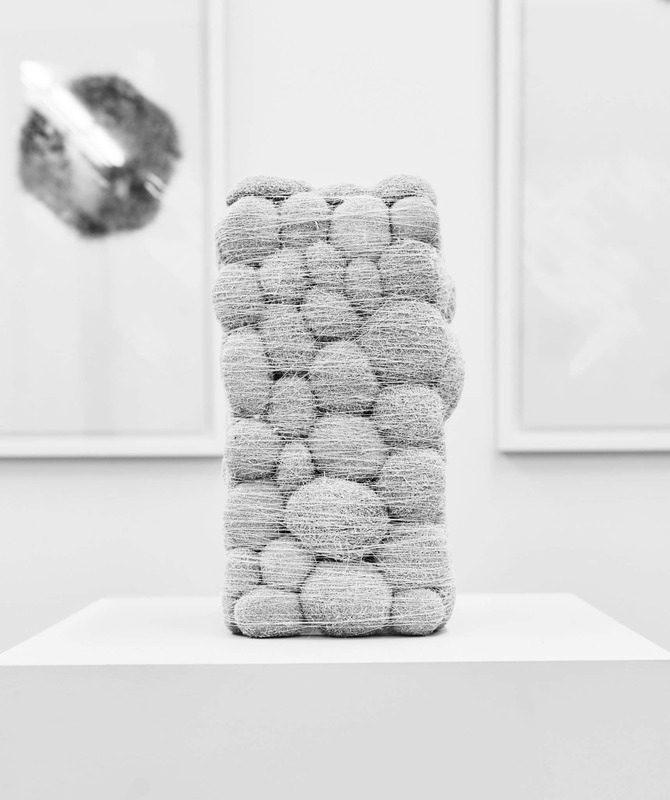 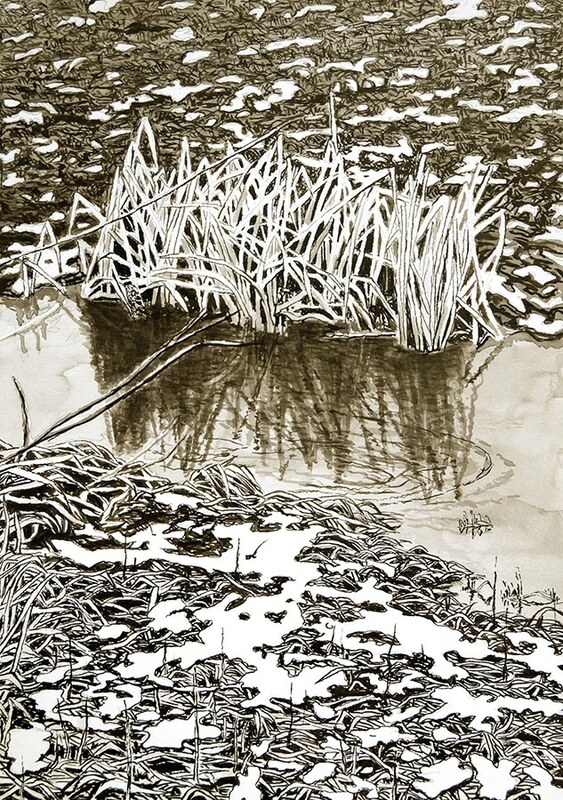 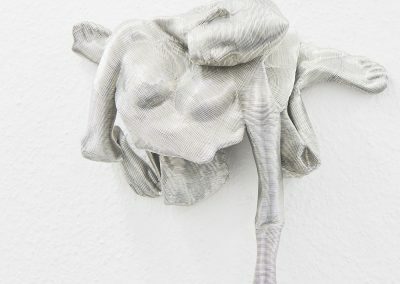 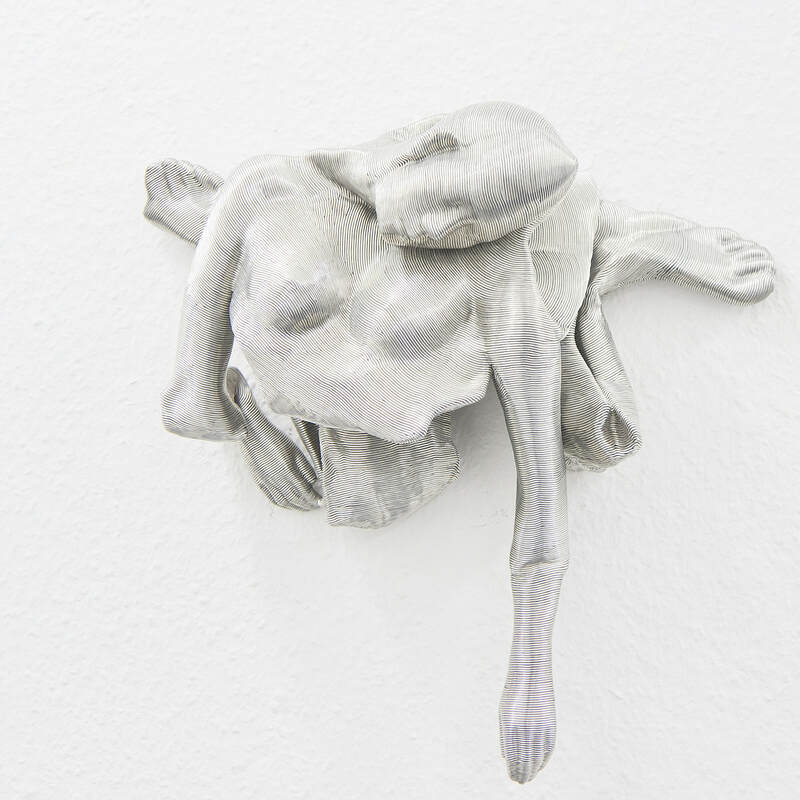 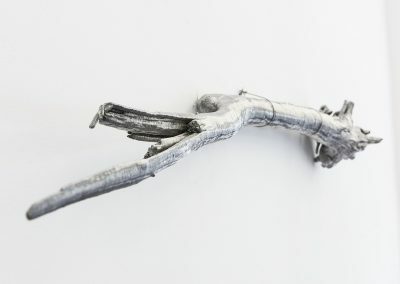 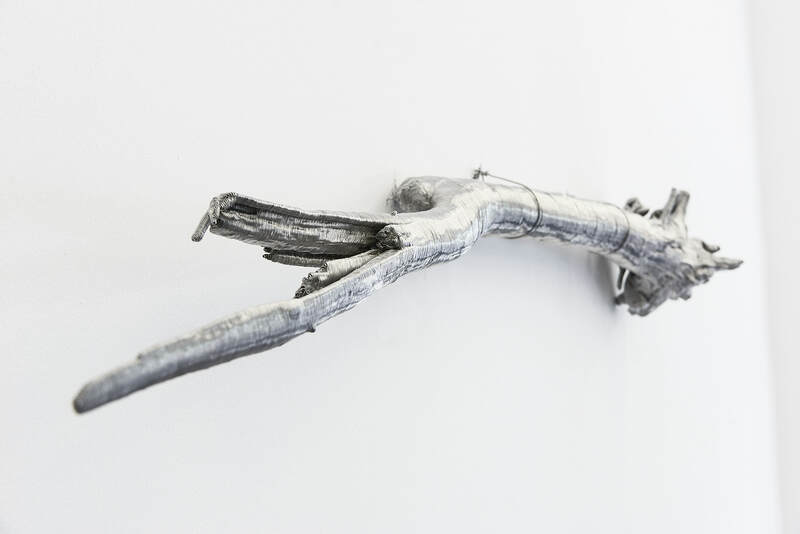 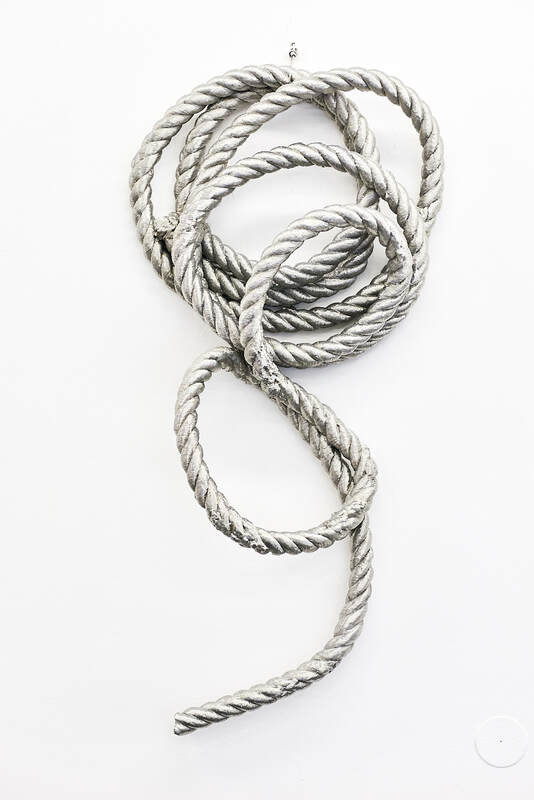 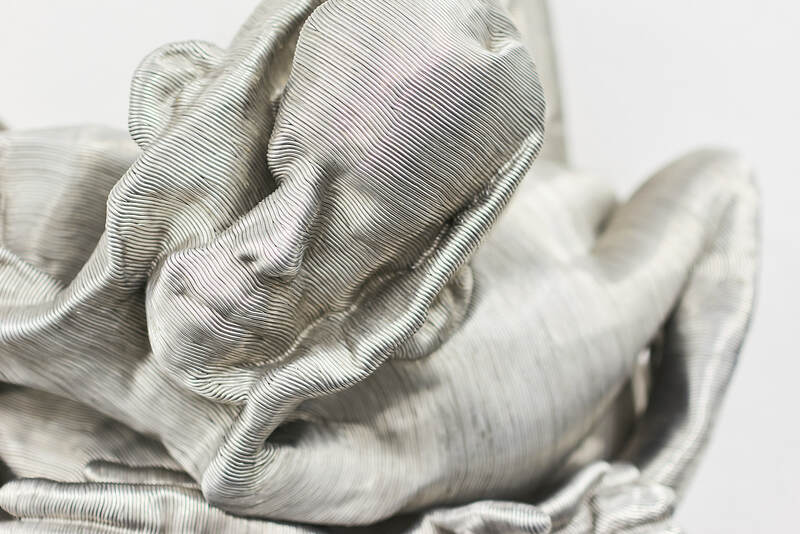 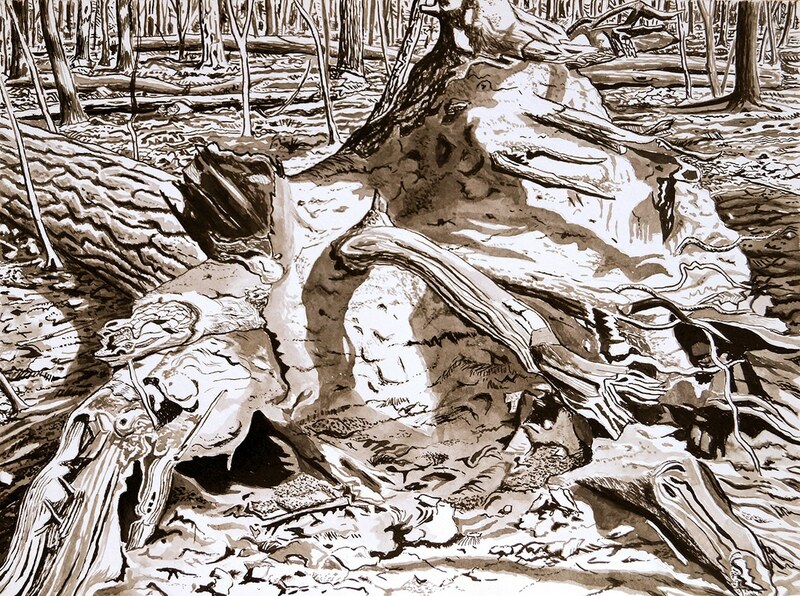 Magic Beans Gallery is pleased to present Konstantin Déry´s solo exhibition “Burn, Still”. 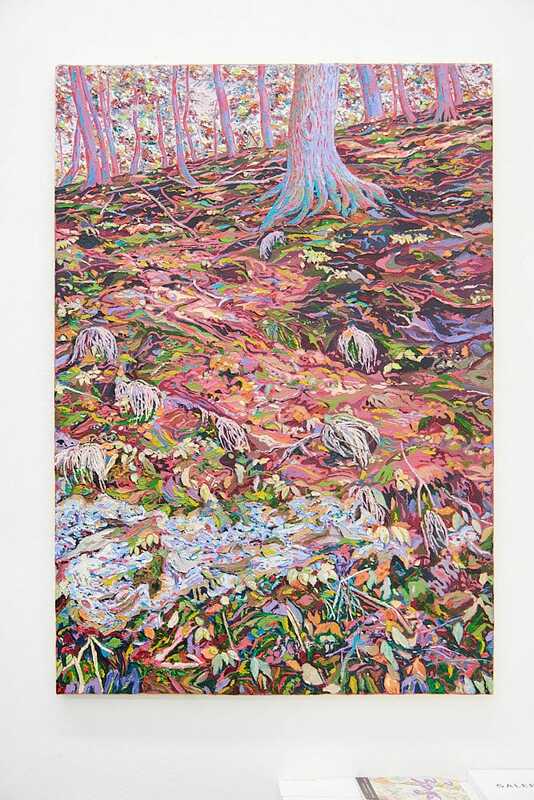 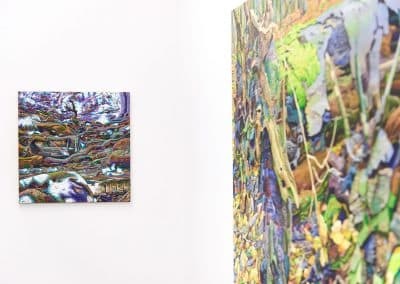 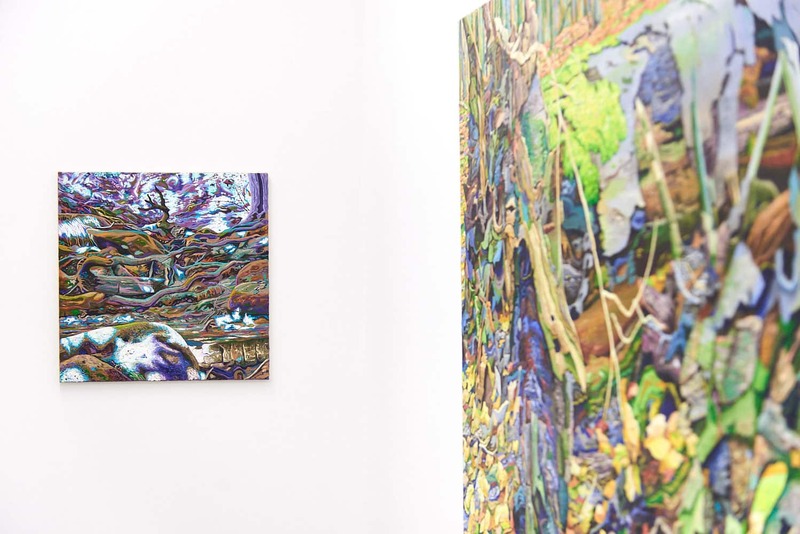 A slow work process leads to Konstantin Déry´s paintings, and with their intricate motifs taken from nature, the viewer is invited to take them in slowly. 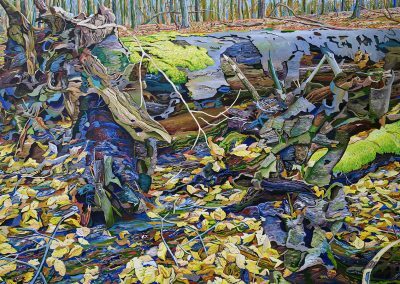 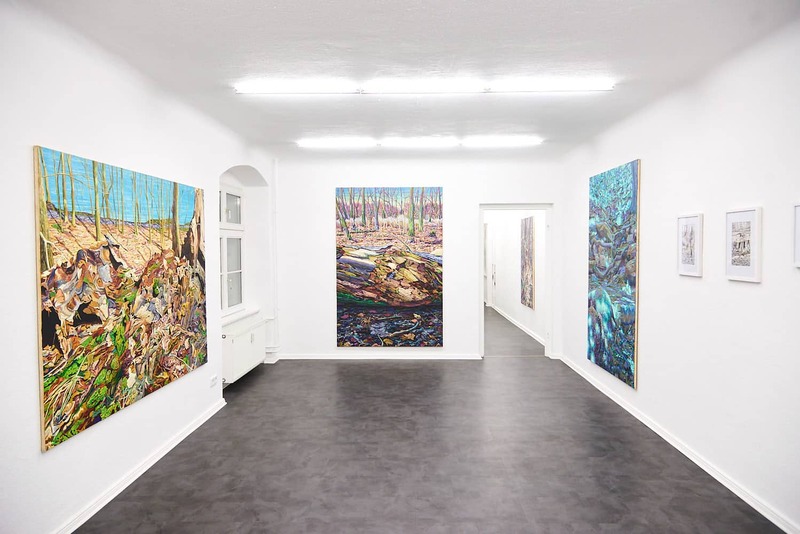 By applying the paint with palette knives and small wooden picks, he creates rough surfaces that further increase the intensity evoked by the strong colour harmonies and structural diversity of texture that characterize his paintings. 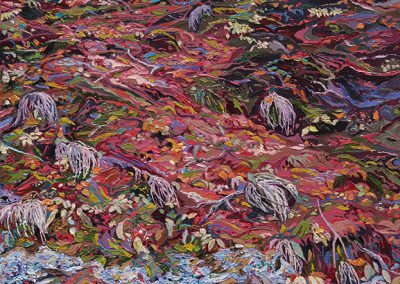 An idiosyncratic liveliness, which also inhabits the uncontrolled flora and the formations of decay, meets the viewer´s eye. 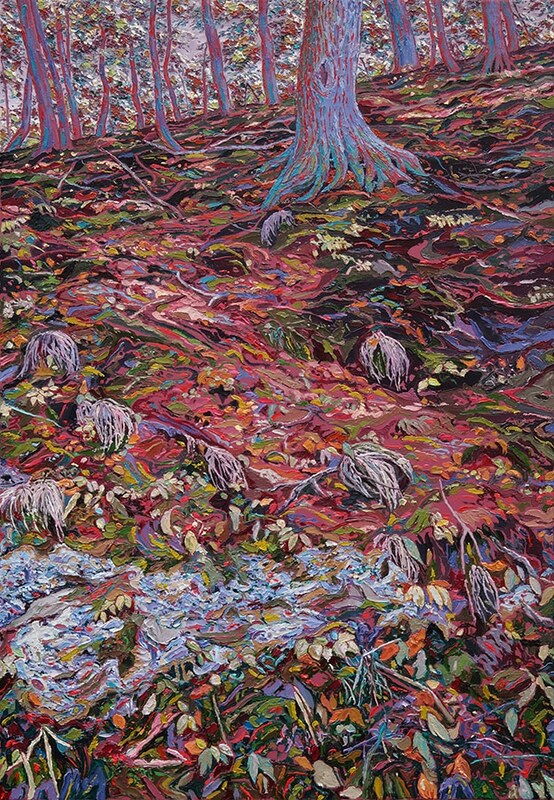 It inspires a sensation in the joy of seeing, of visually experiencing, as a symbol of being alive. 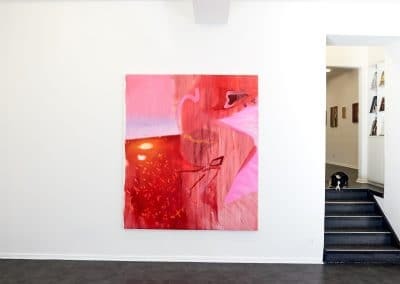 Viewed up close, the images in Déry´s paintings can dissolve into dynamic abstract structures, only to become all the more sensual, charged with a very inner dynamic, when seen from a certain distance. 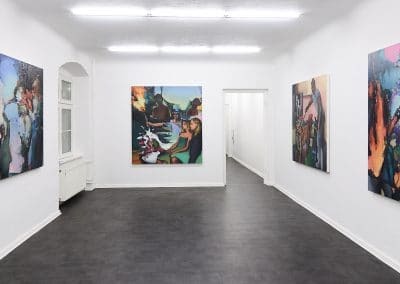 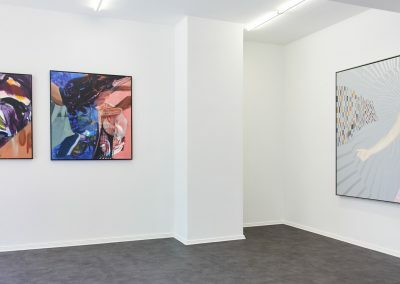 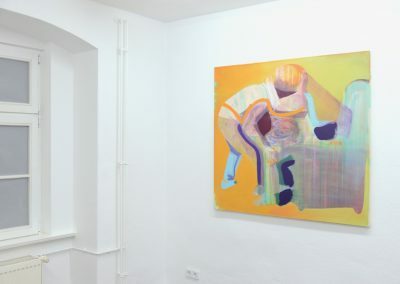 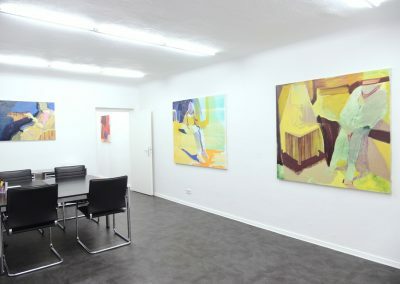 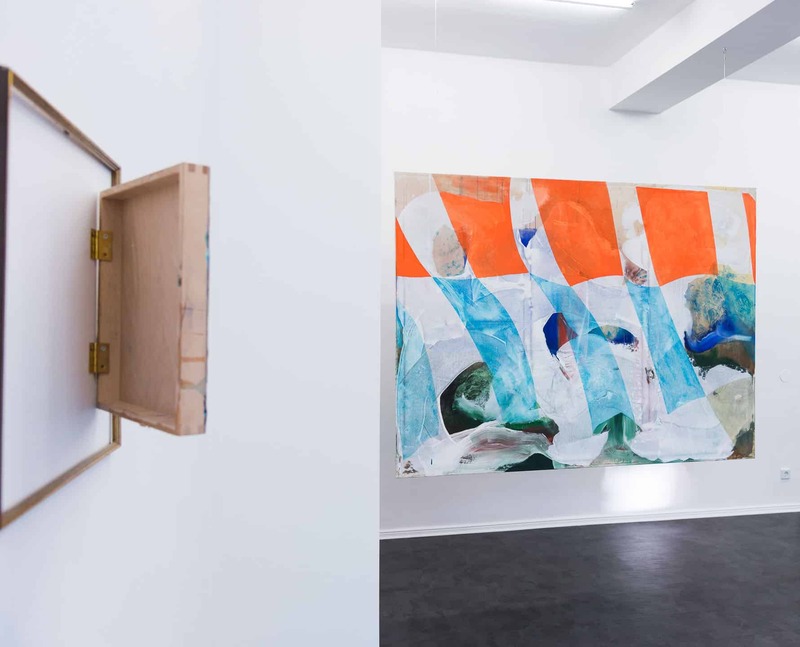 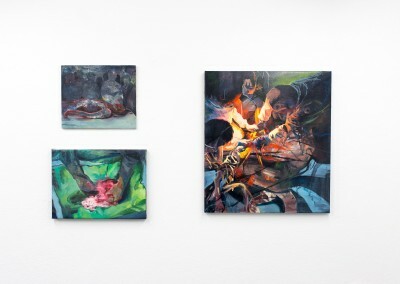 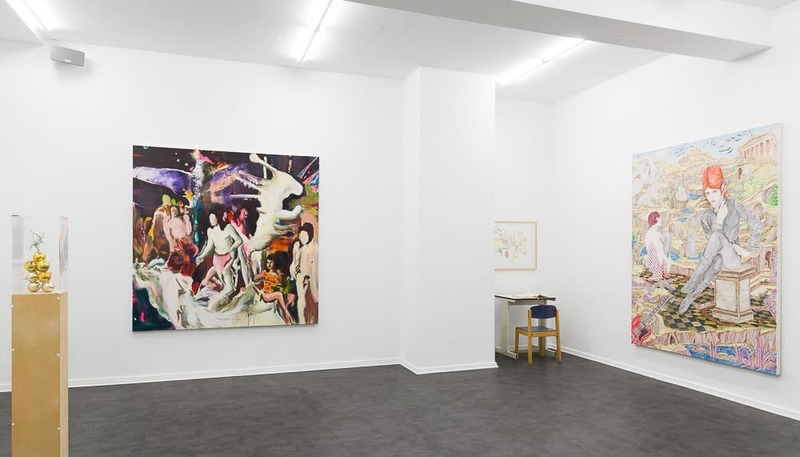 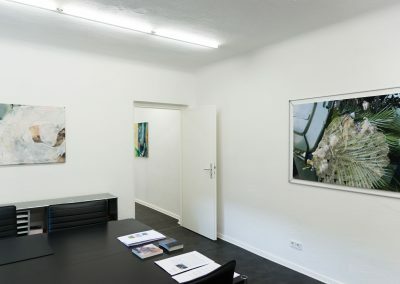 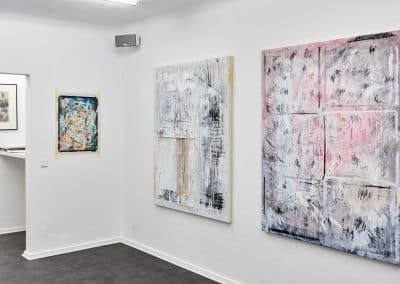 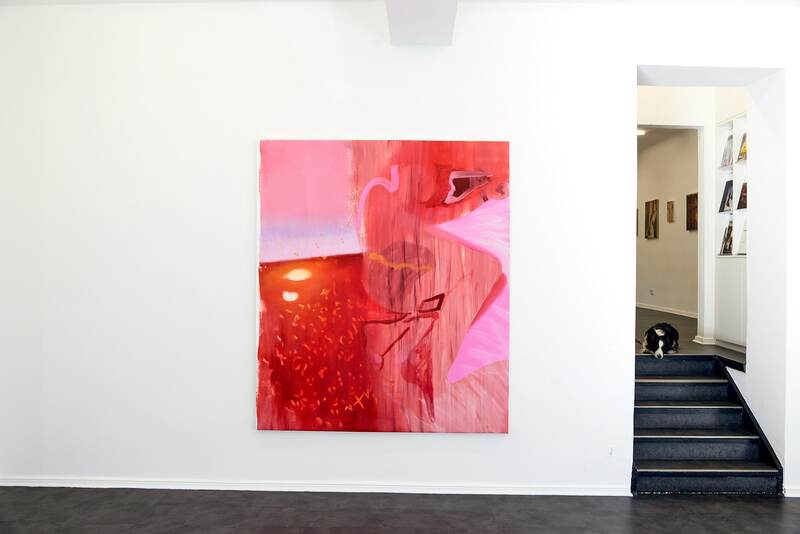 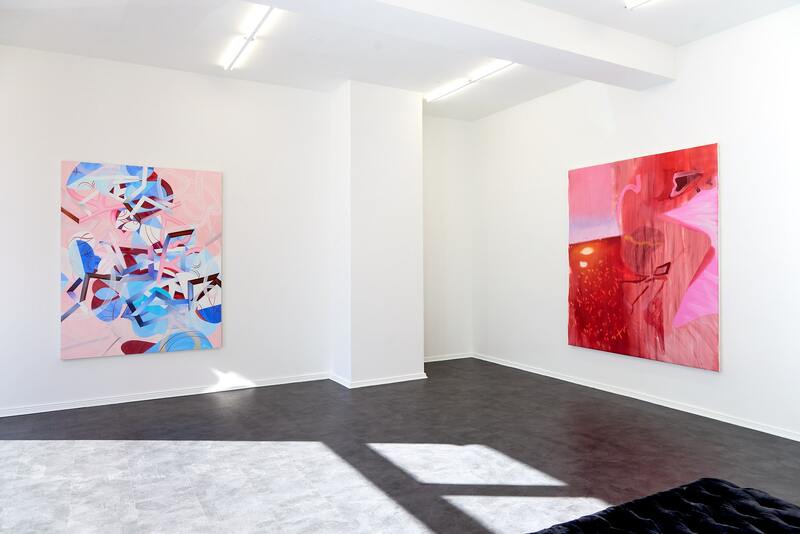 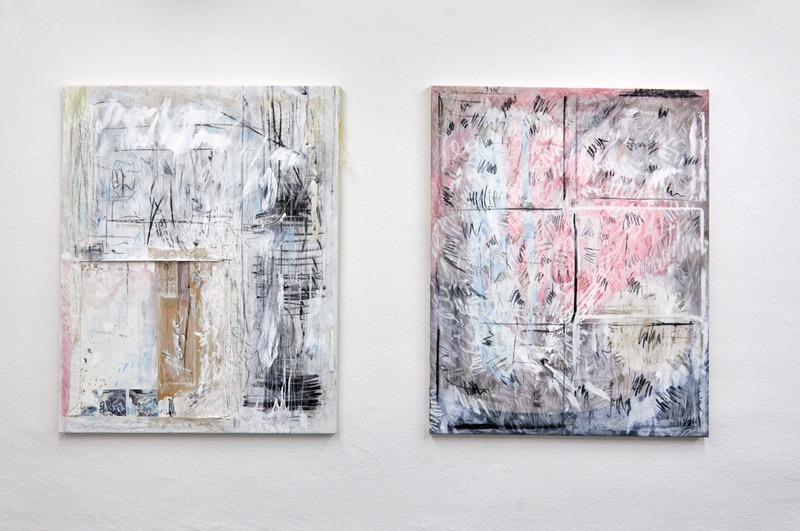 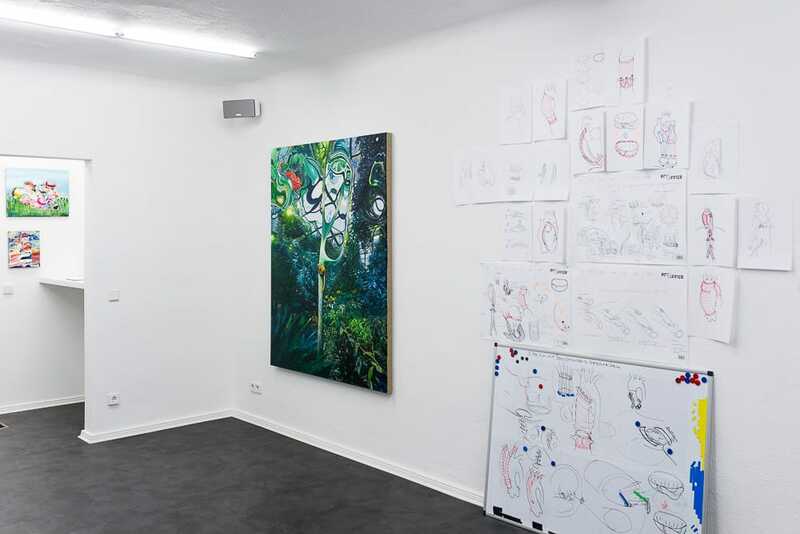 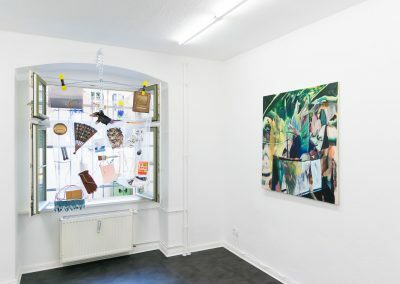 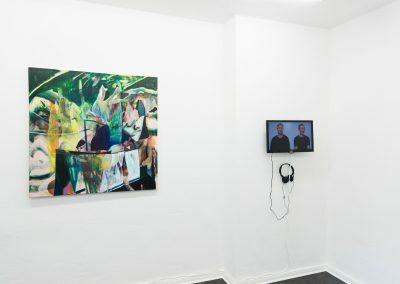 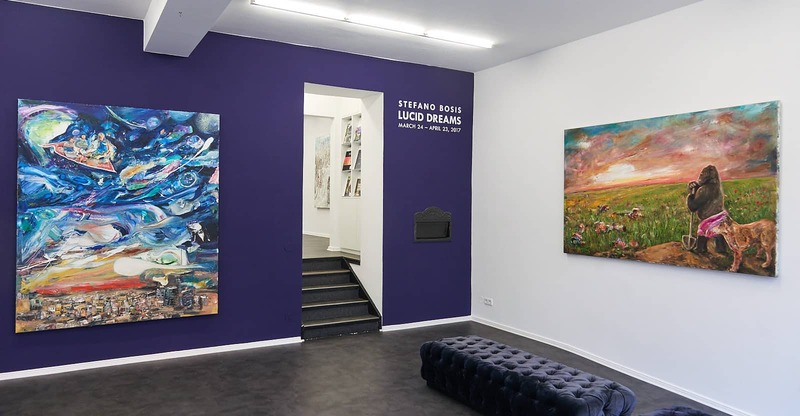 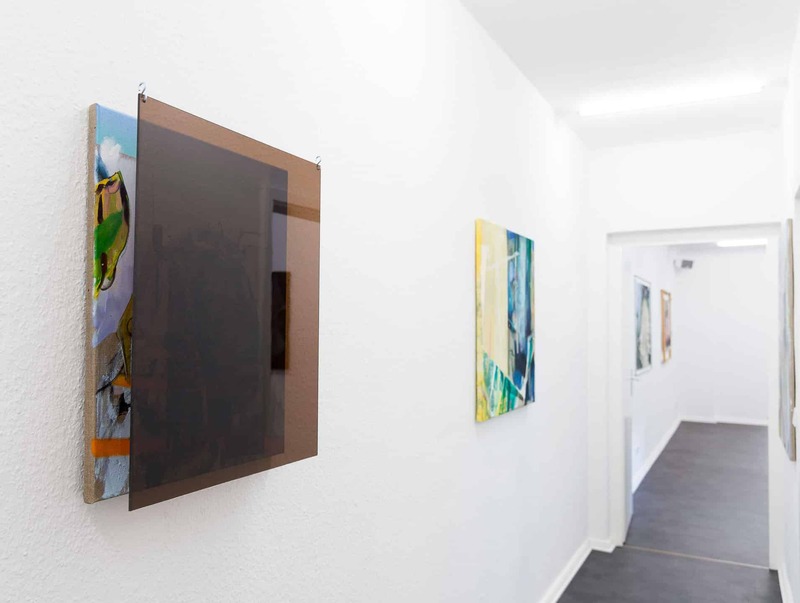 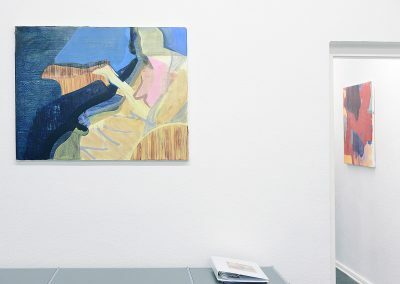 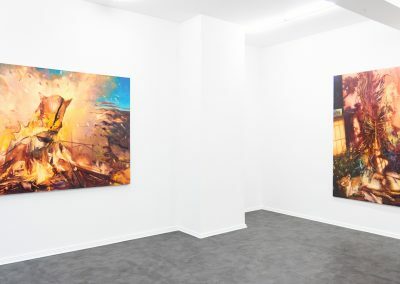 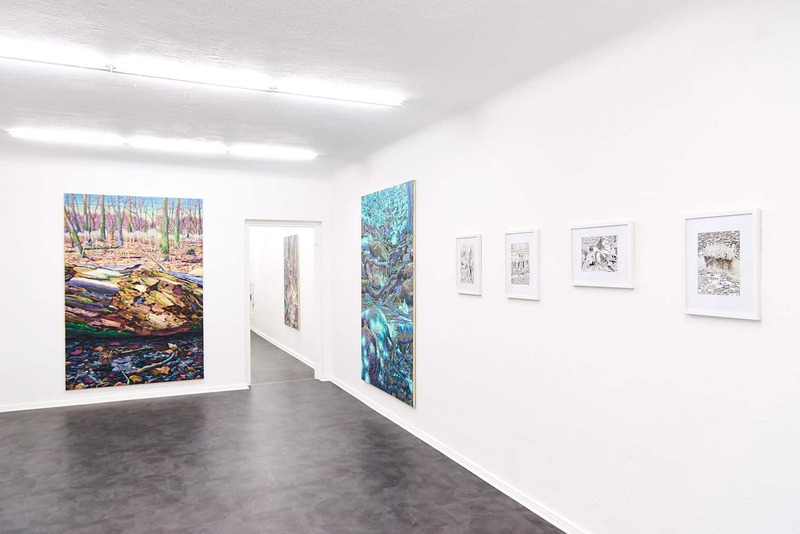 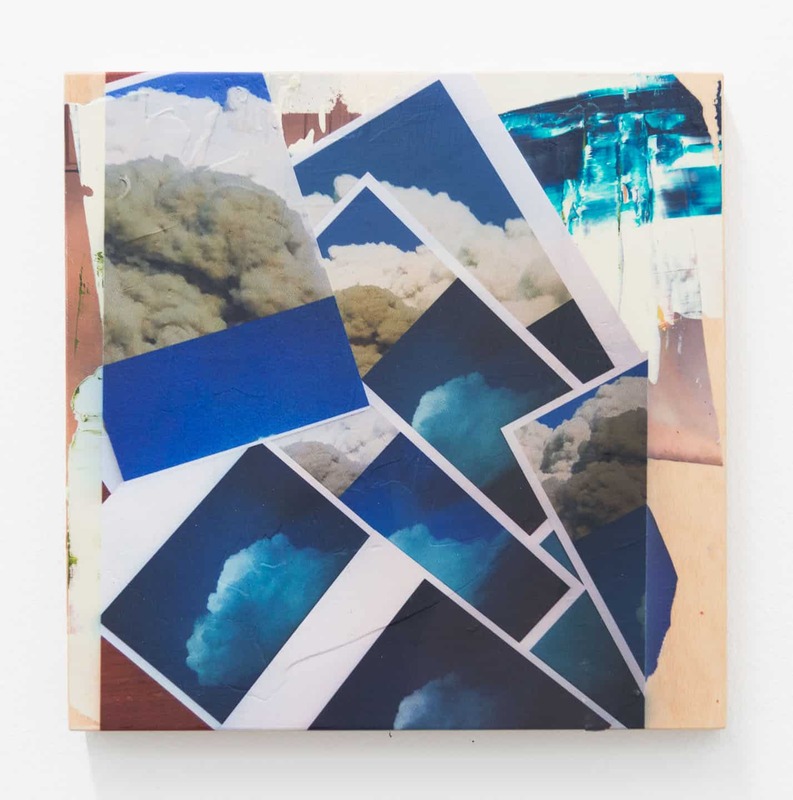 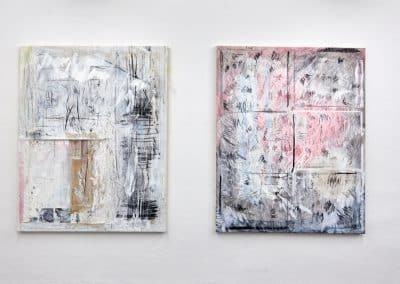 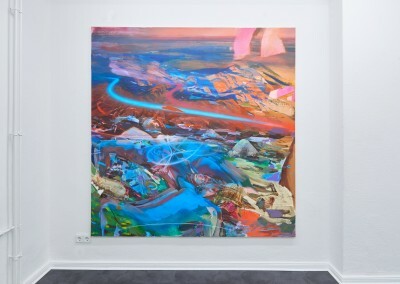 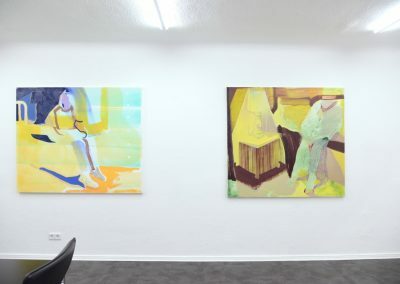 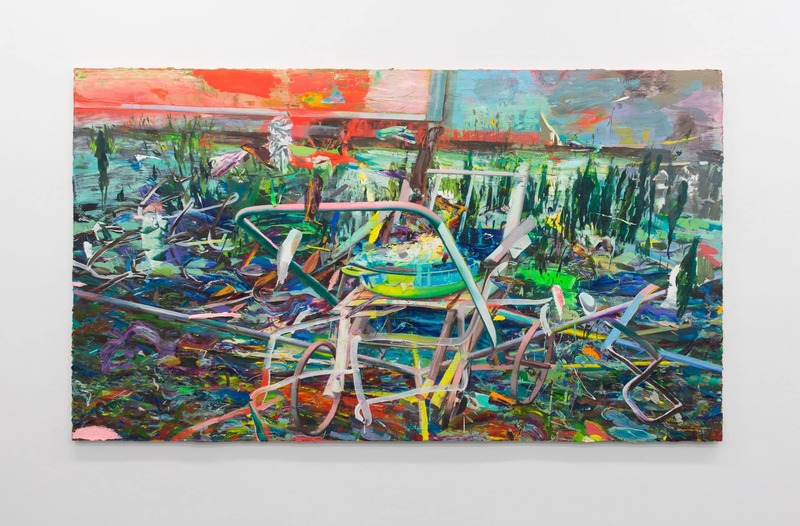 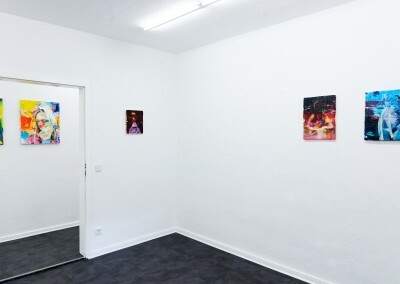 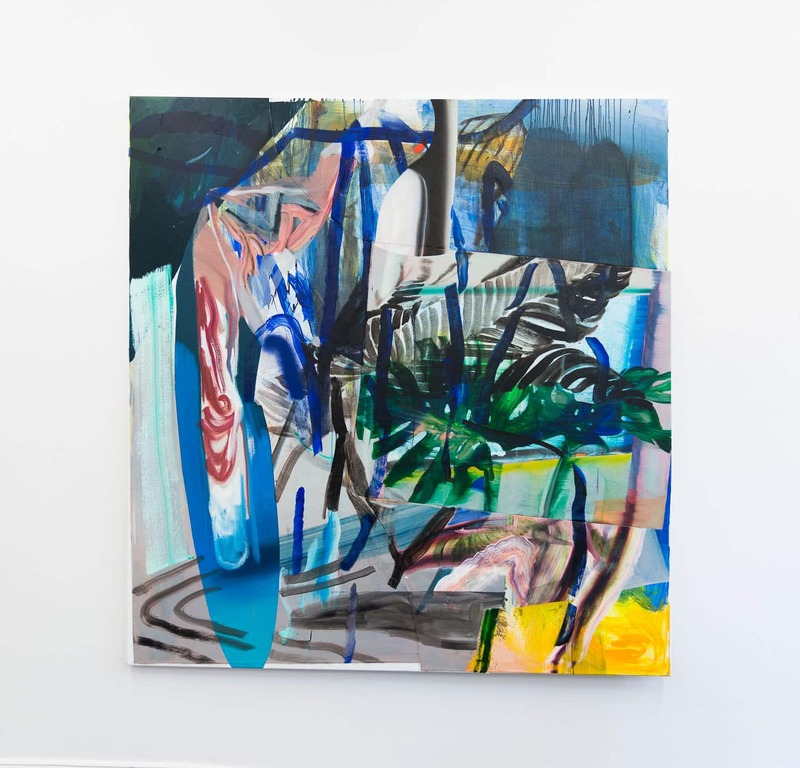 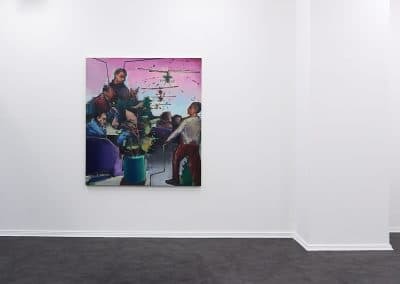 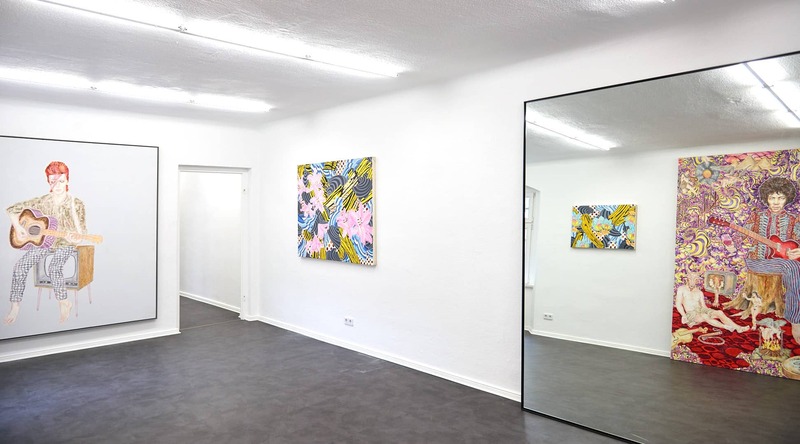 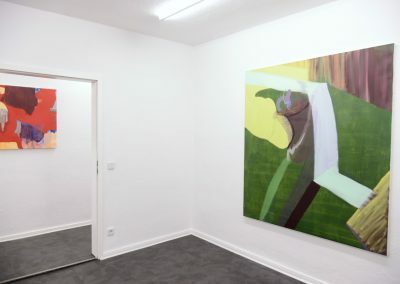 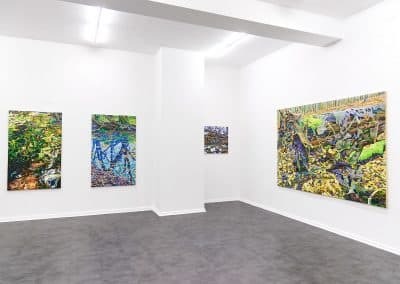 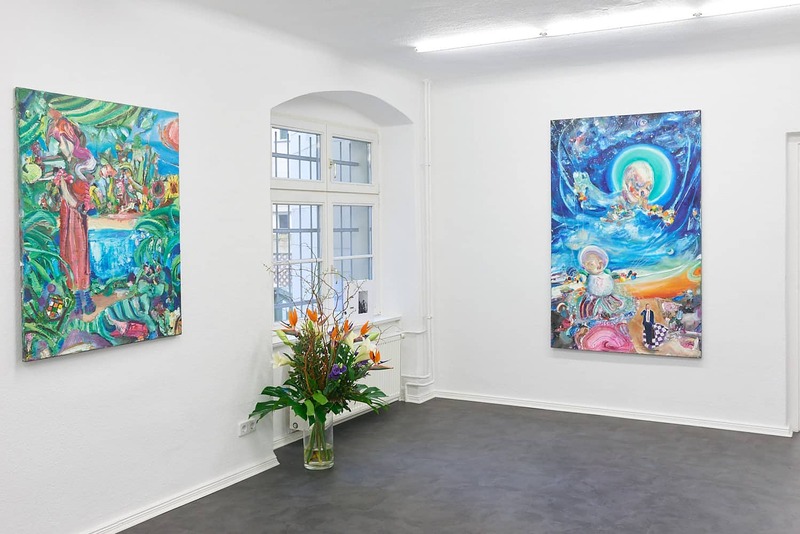 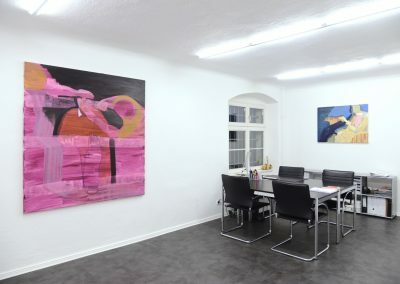 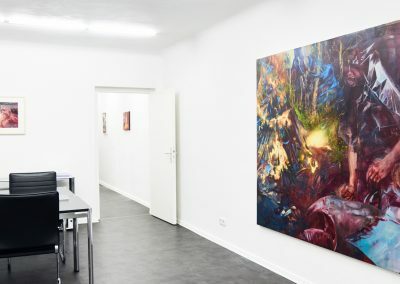 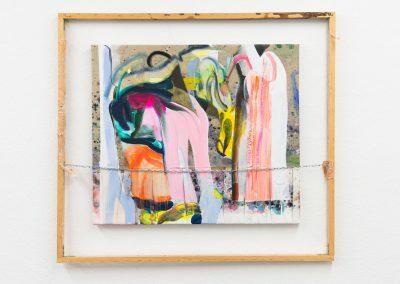 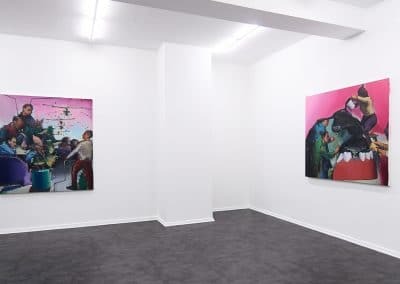 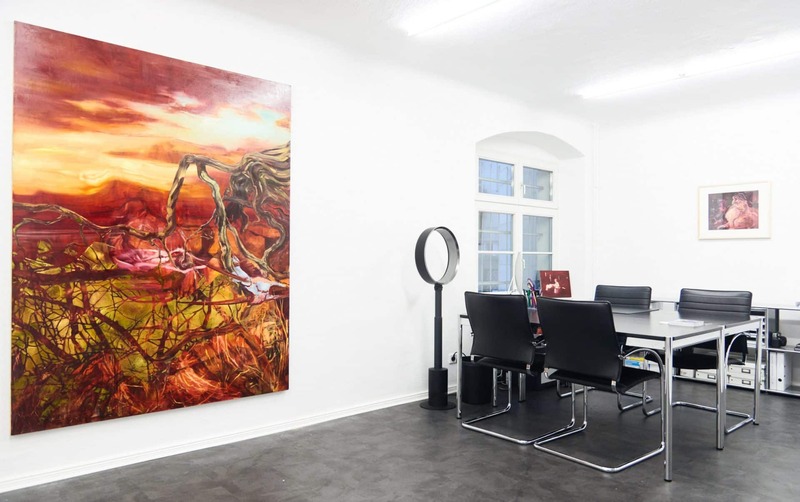 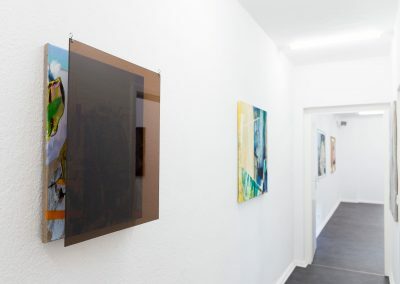 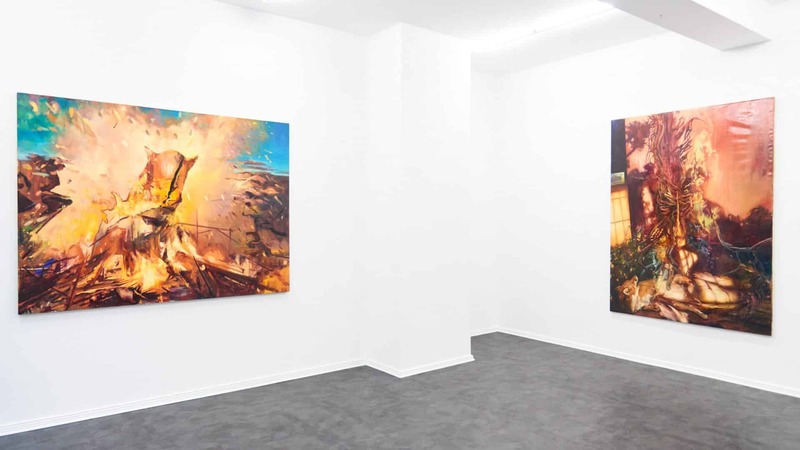 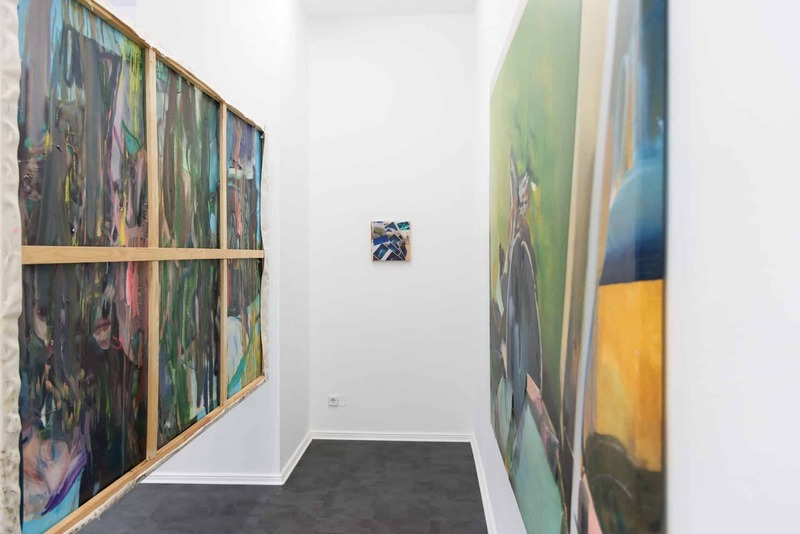 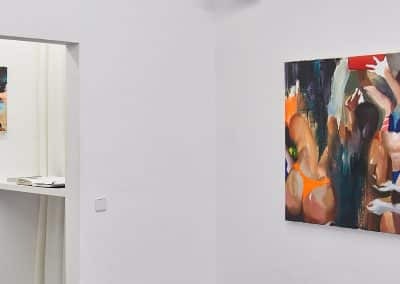 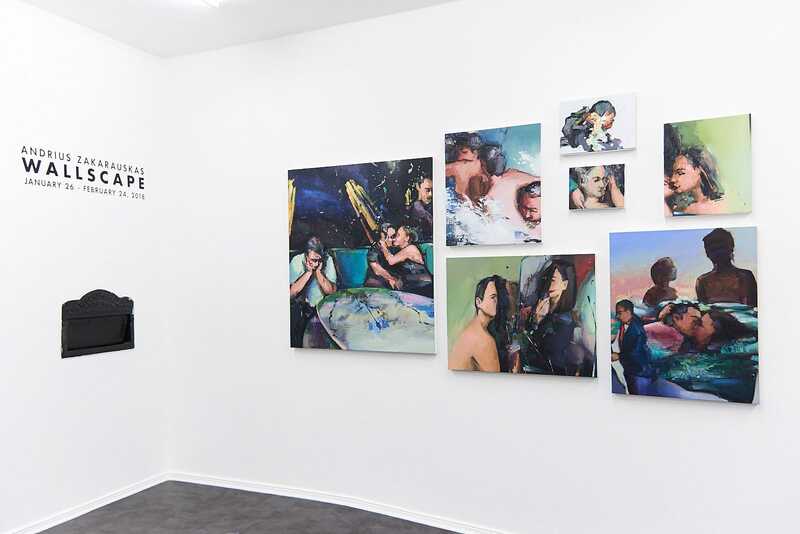 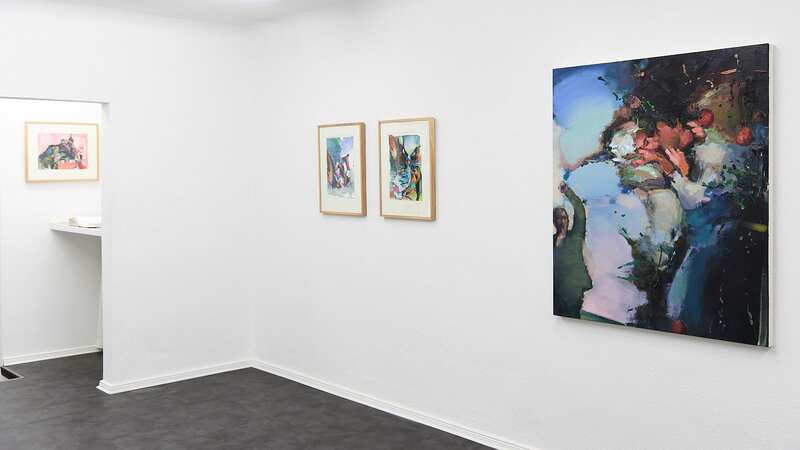 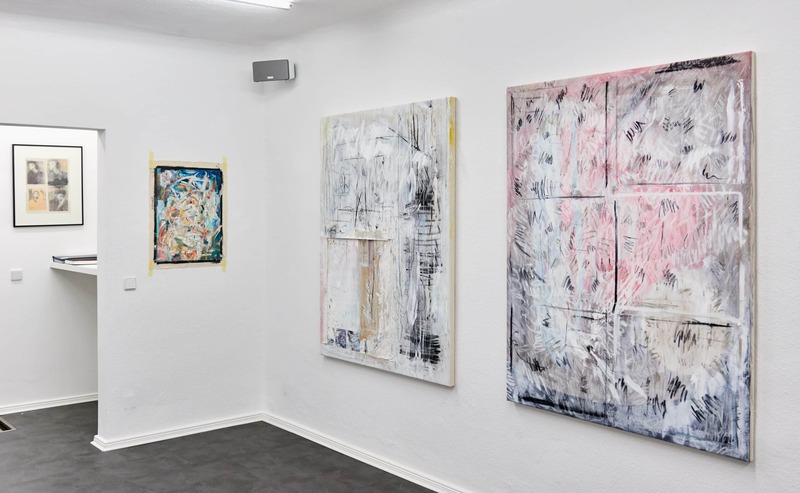 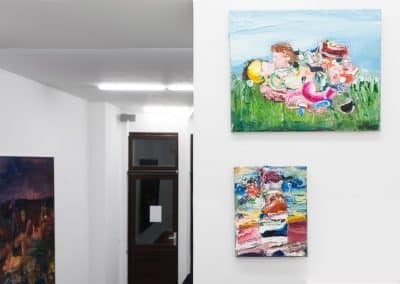 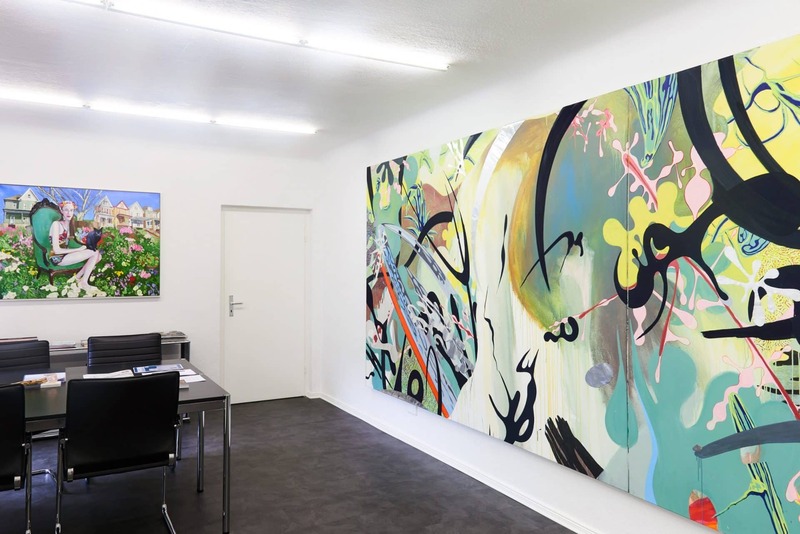 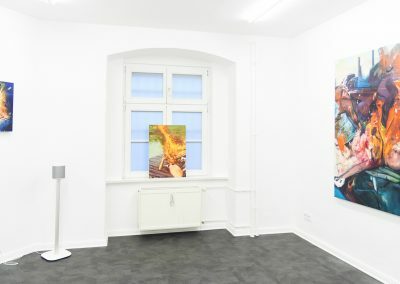 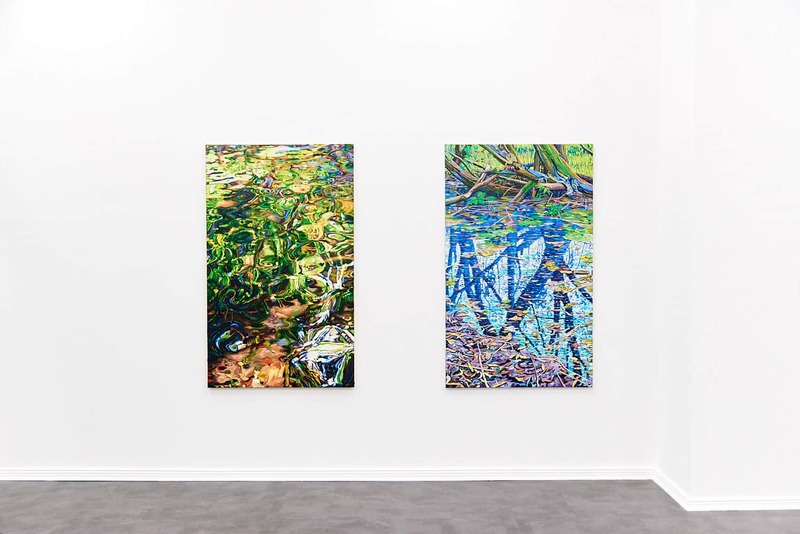 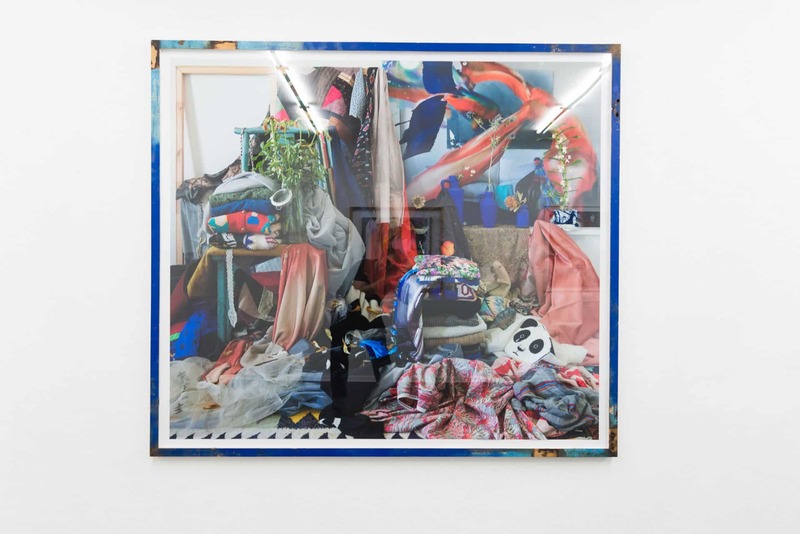 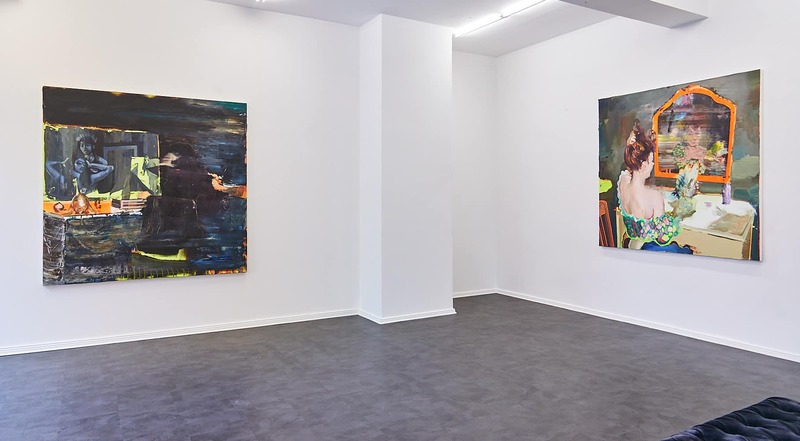 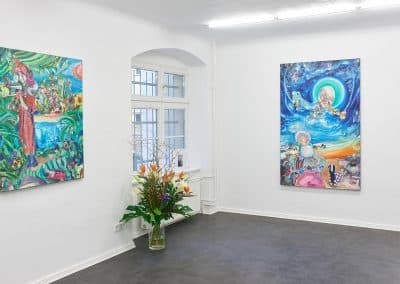 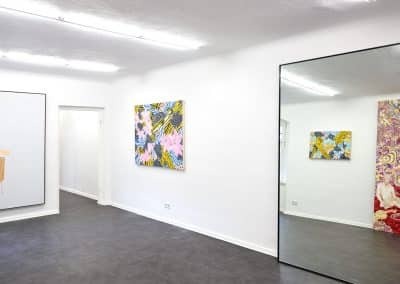 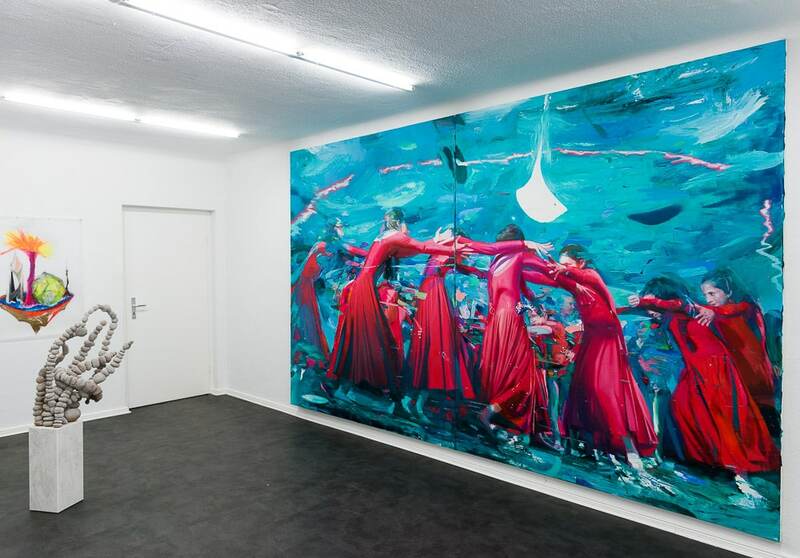 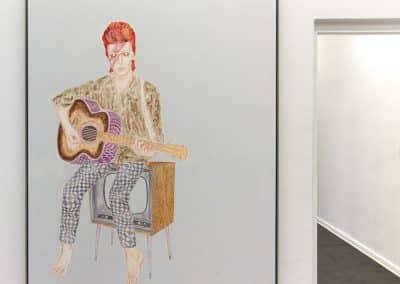 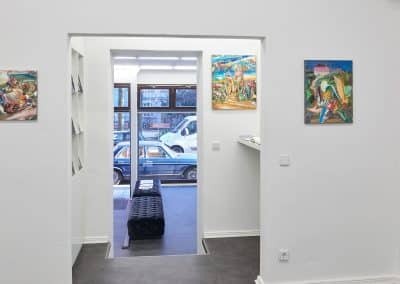 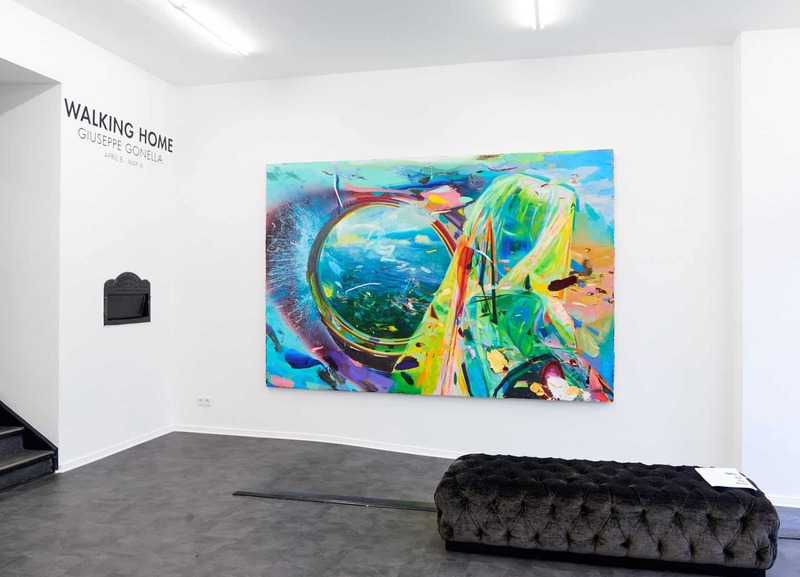 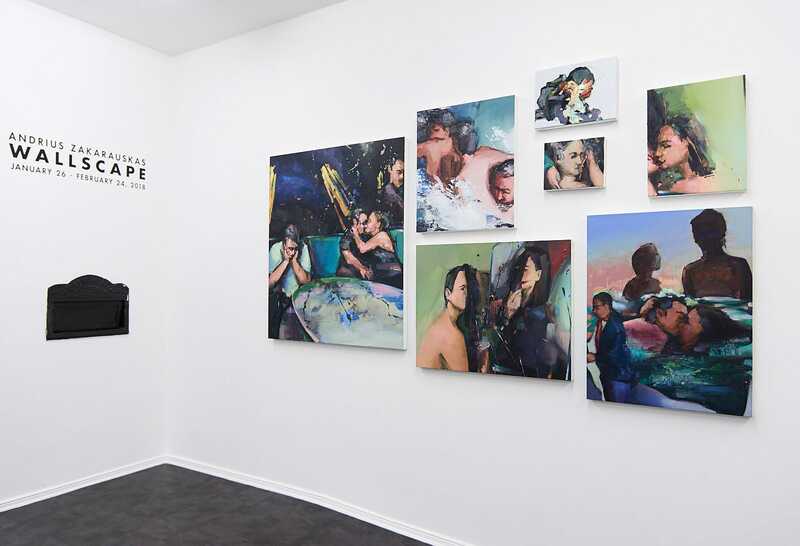 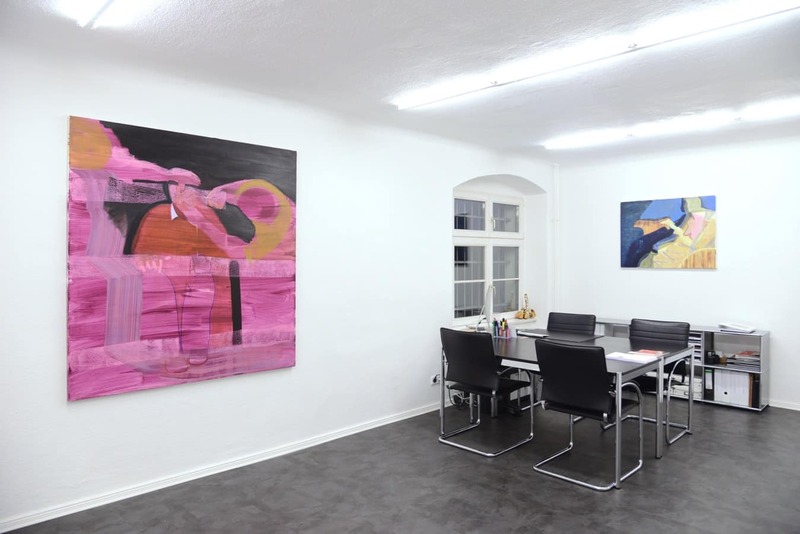 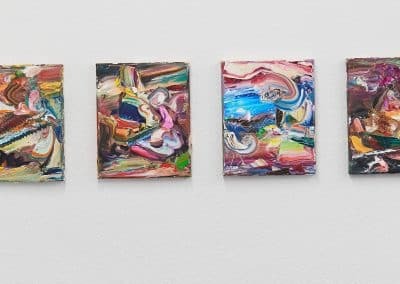 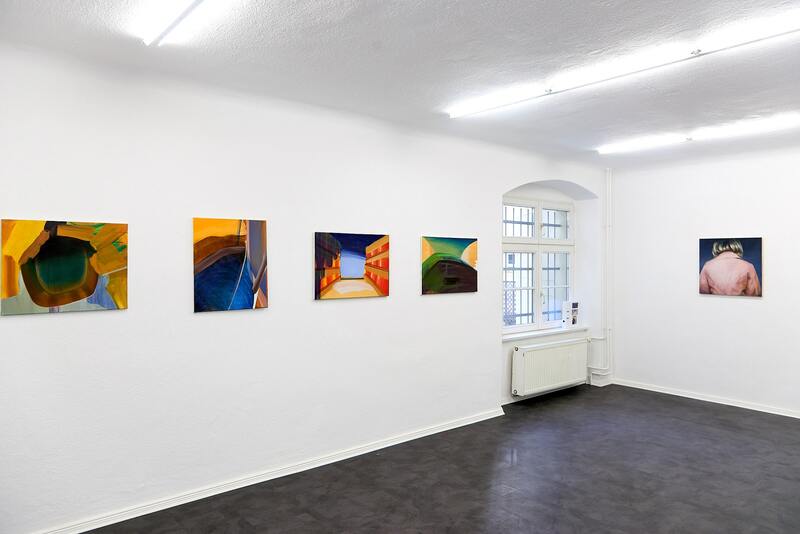 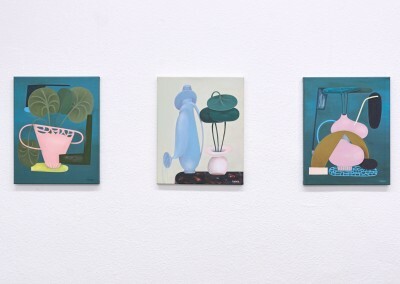 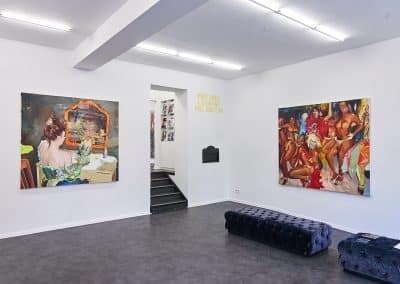 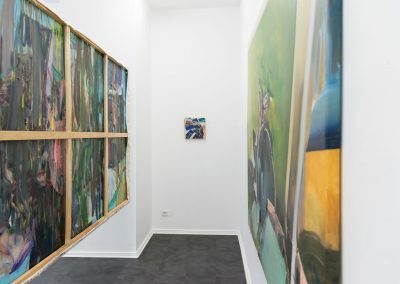 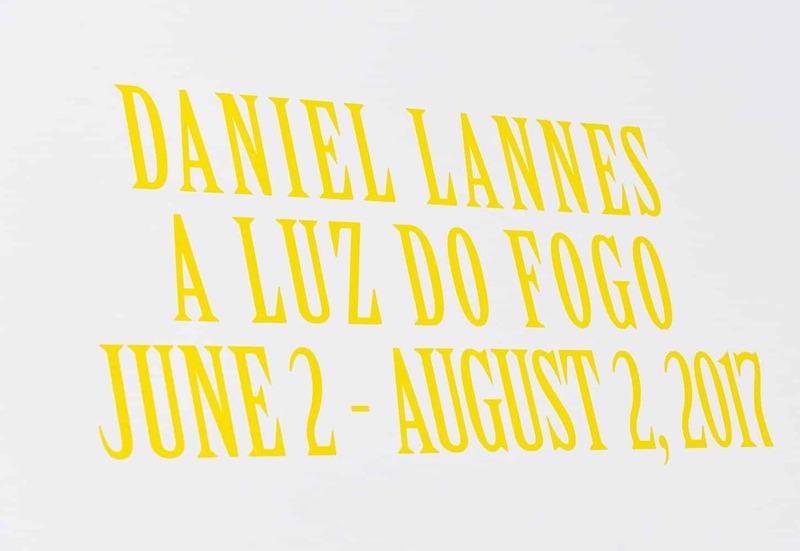 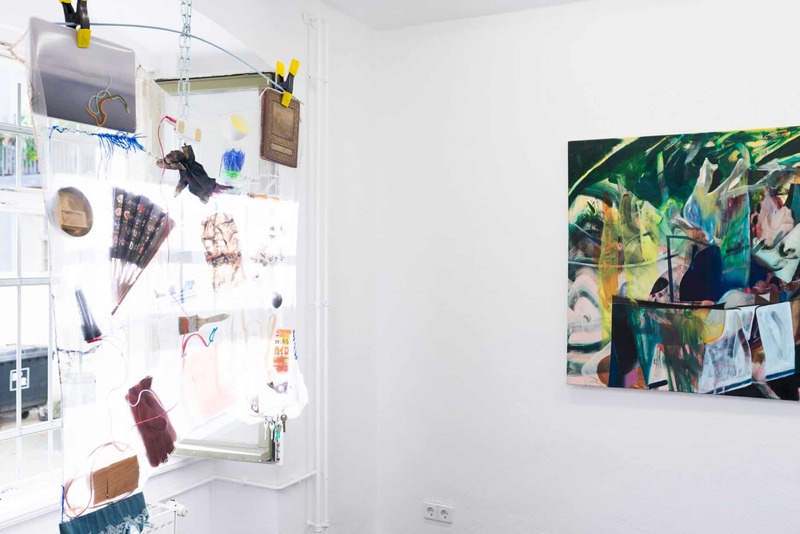 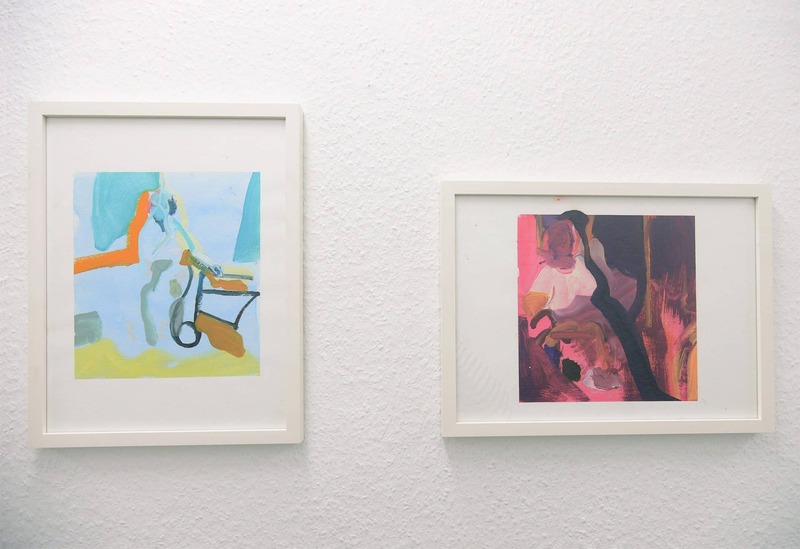 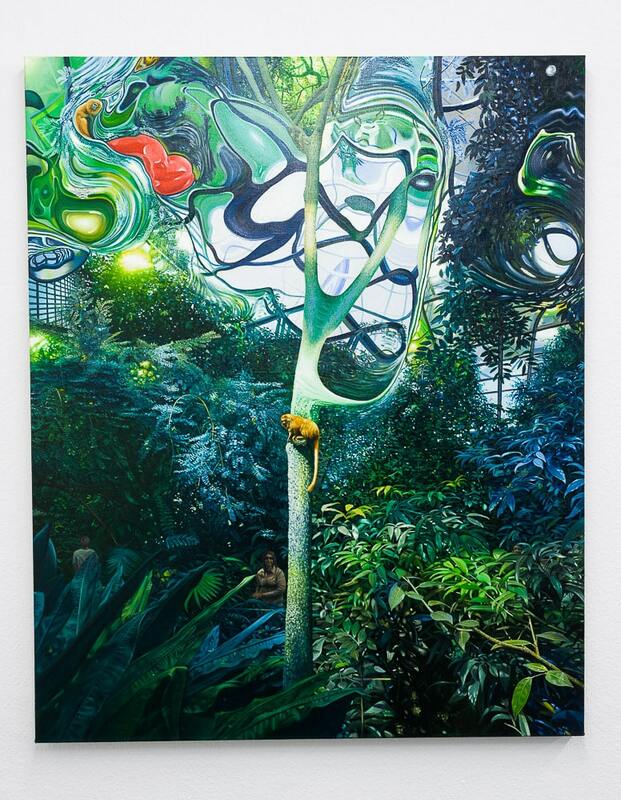 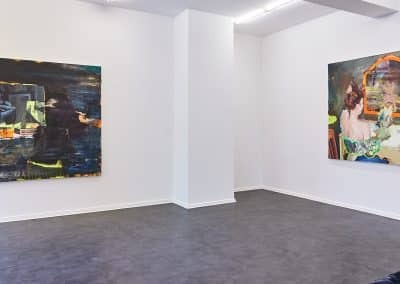 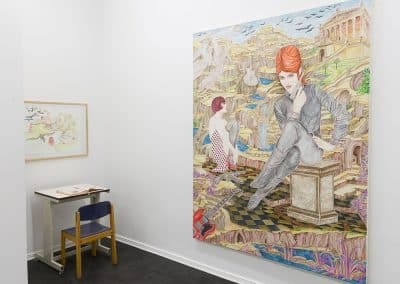 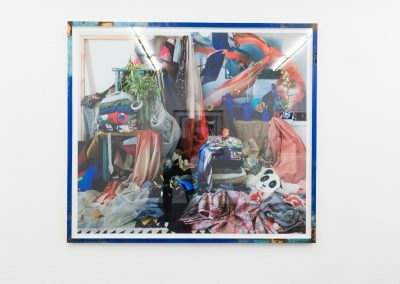 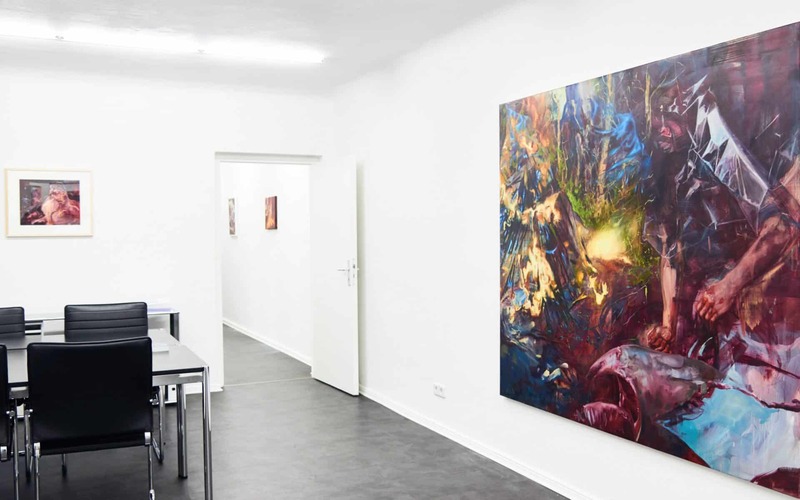 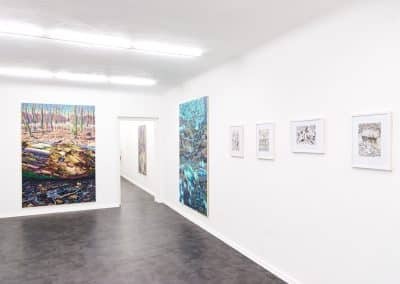 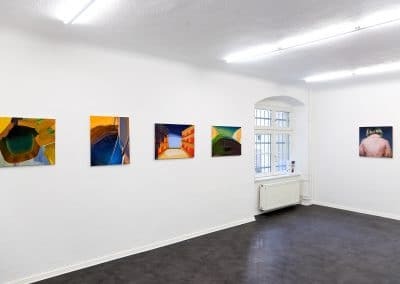 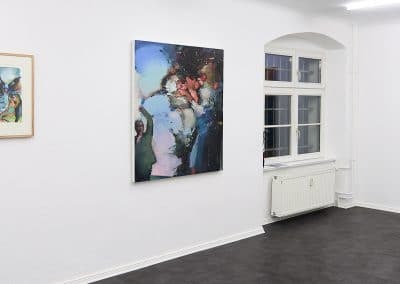 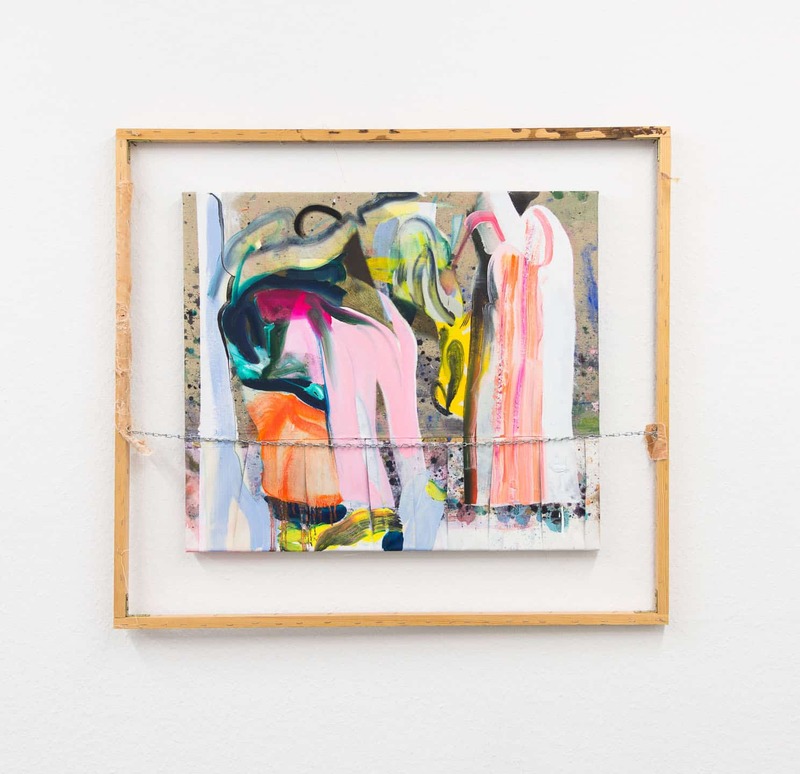 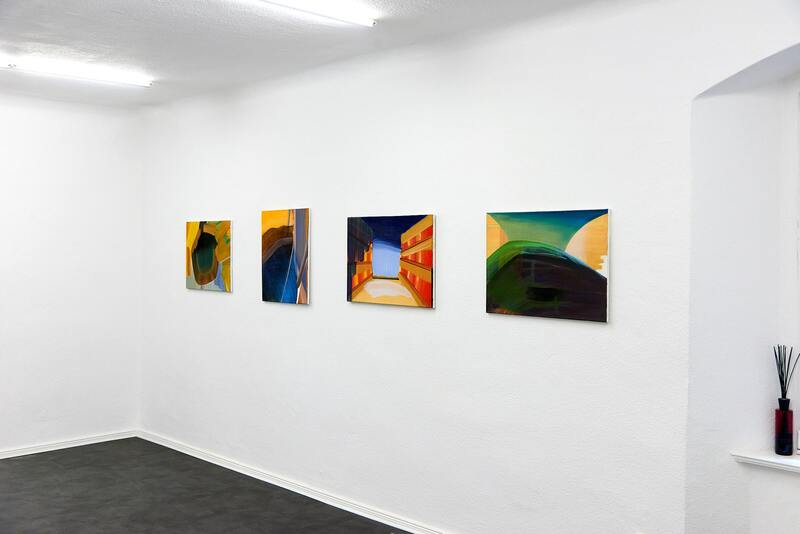 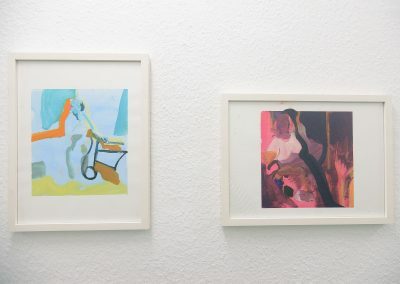 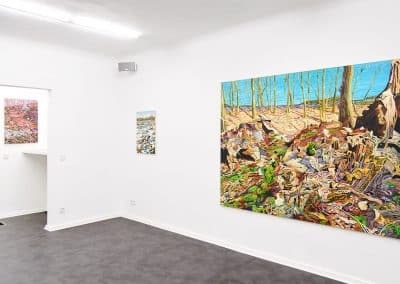 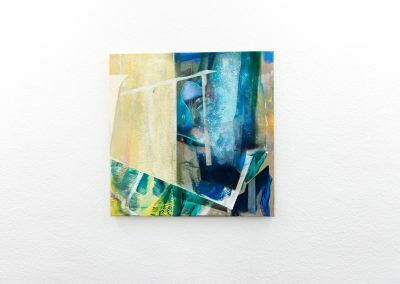 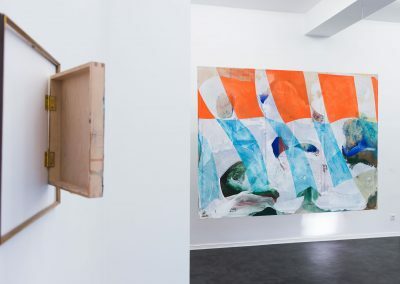 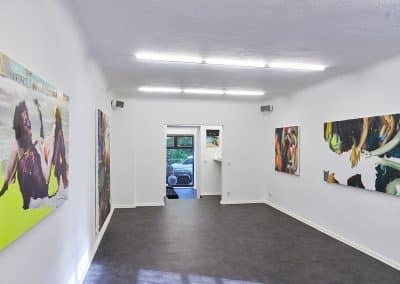 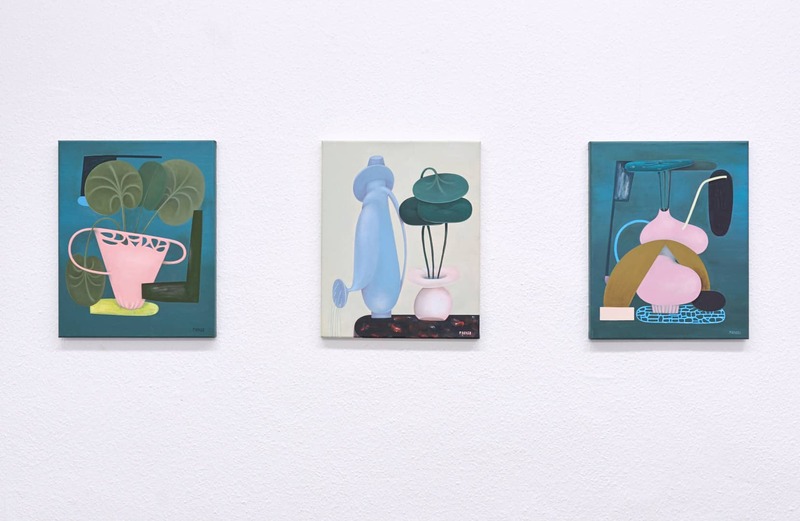 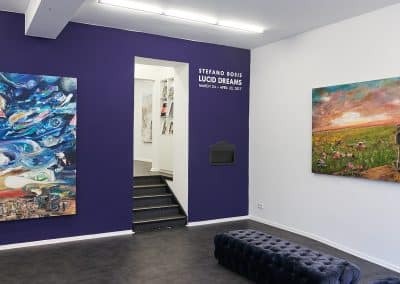 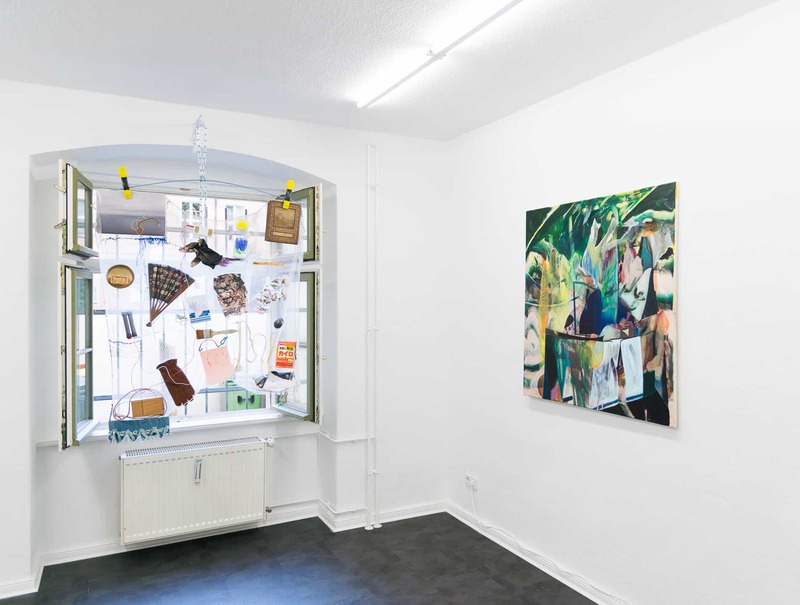 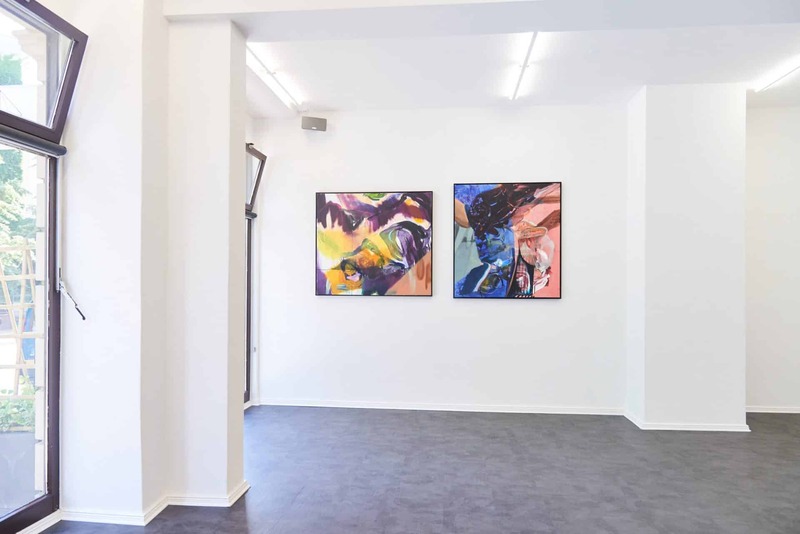 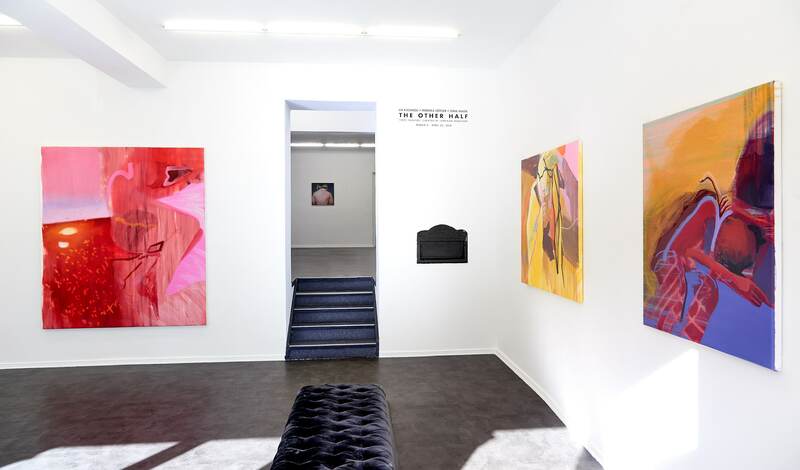 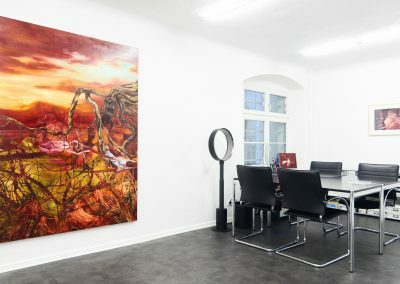 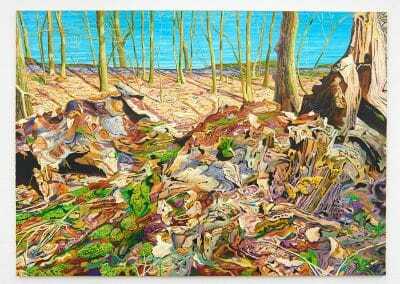 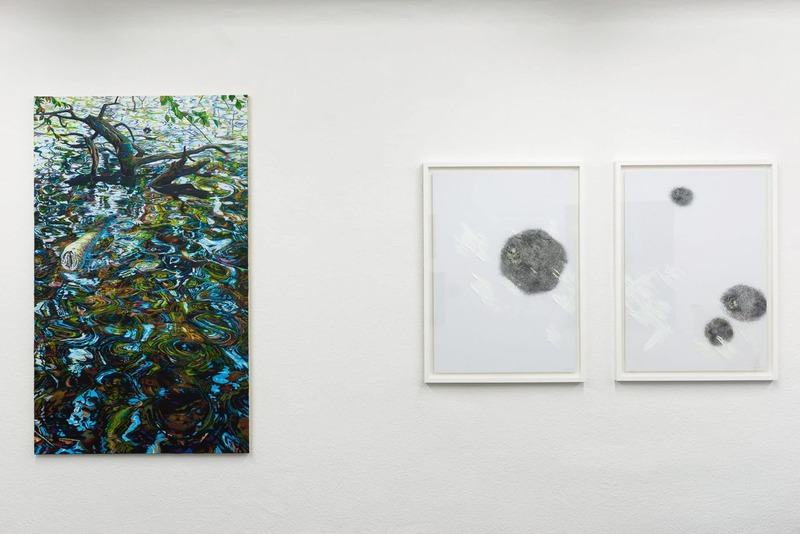 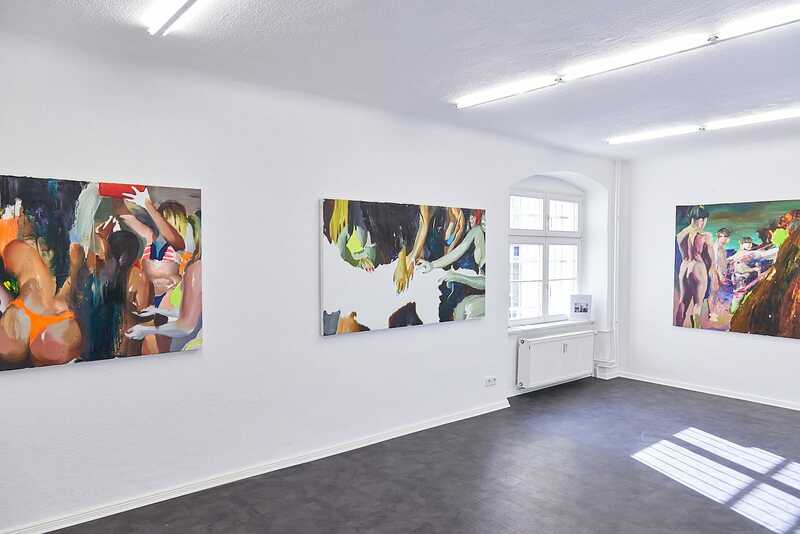 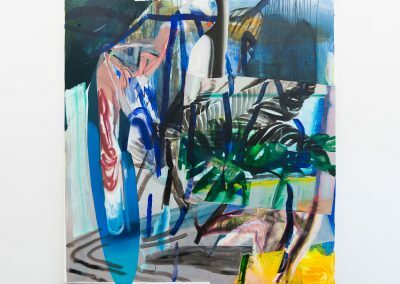 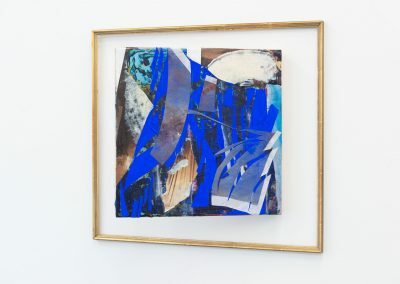 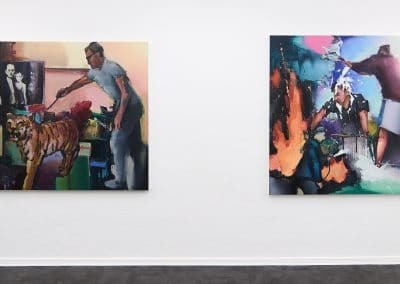 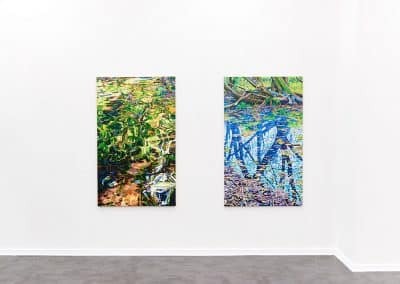 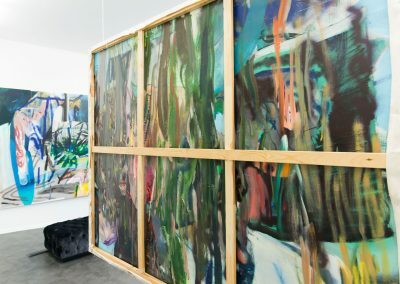 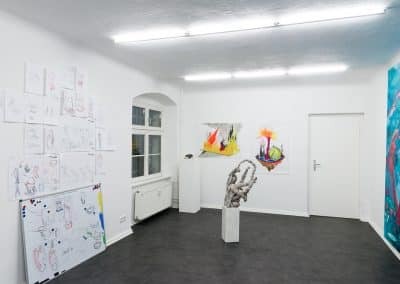 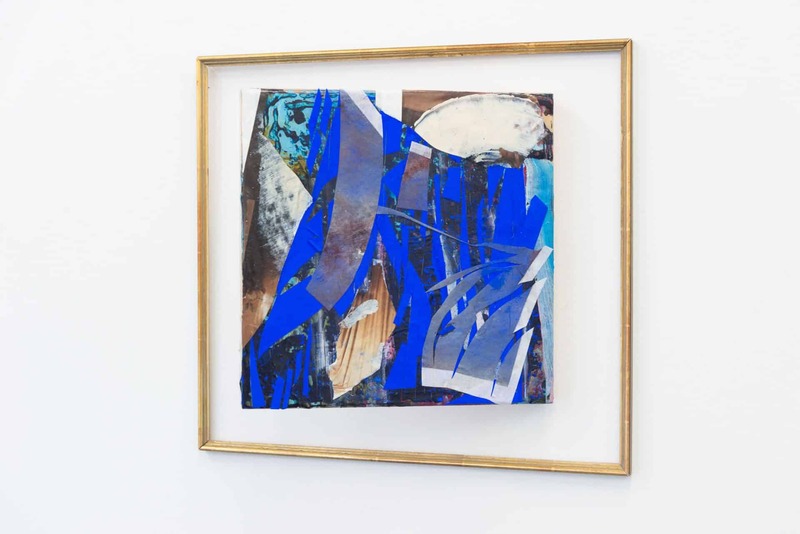 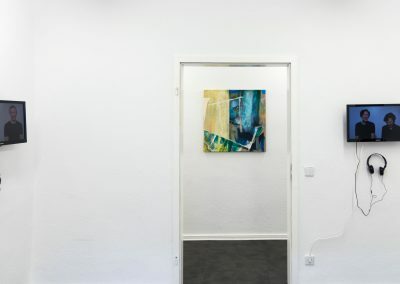 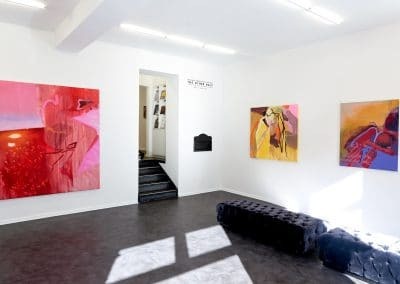 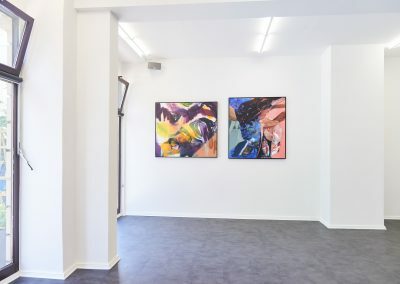 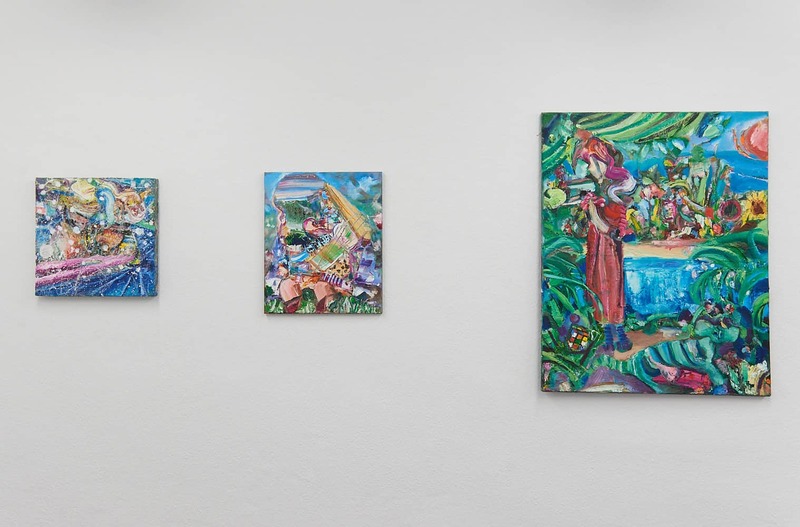 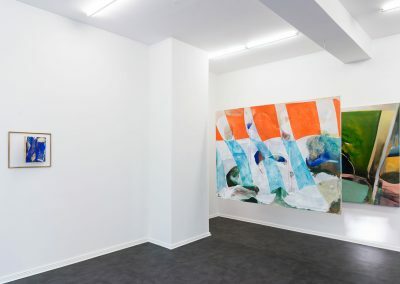 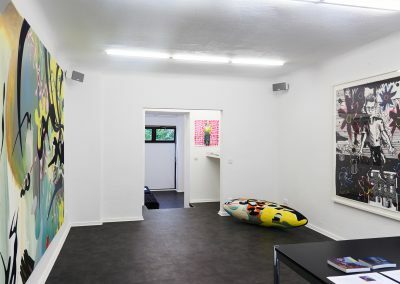 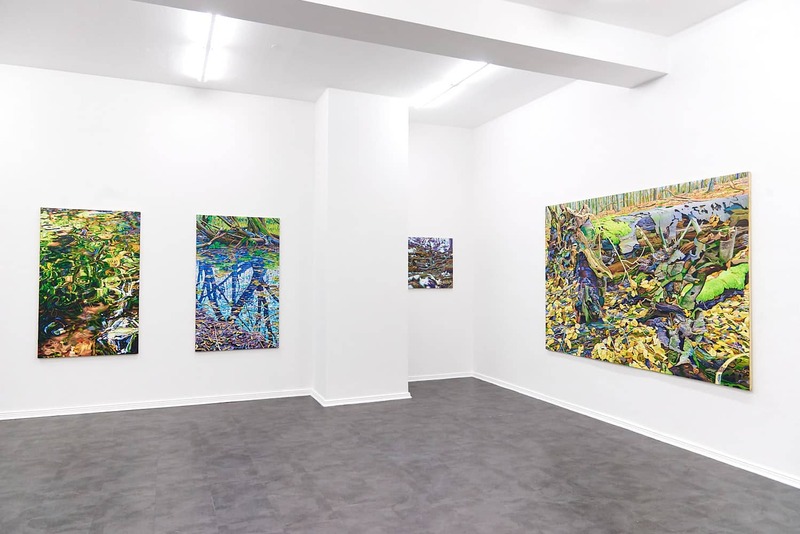 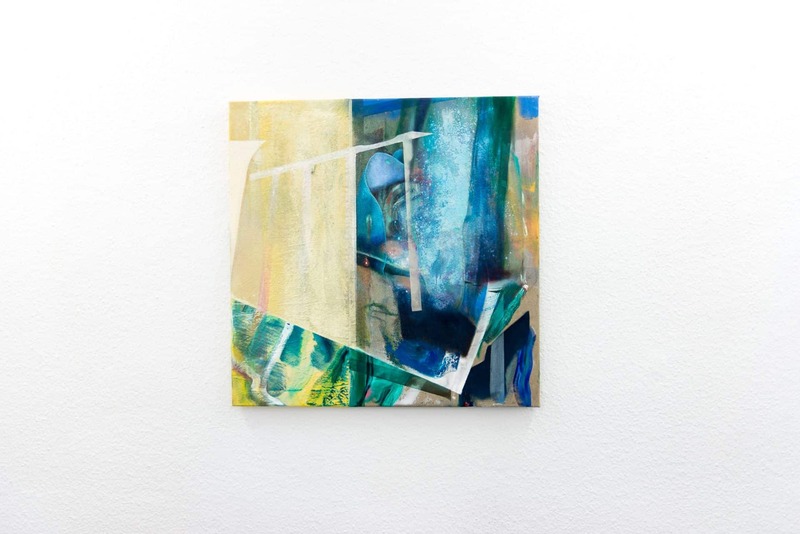 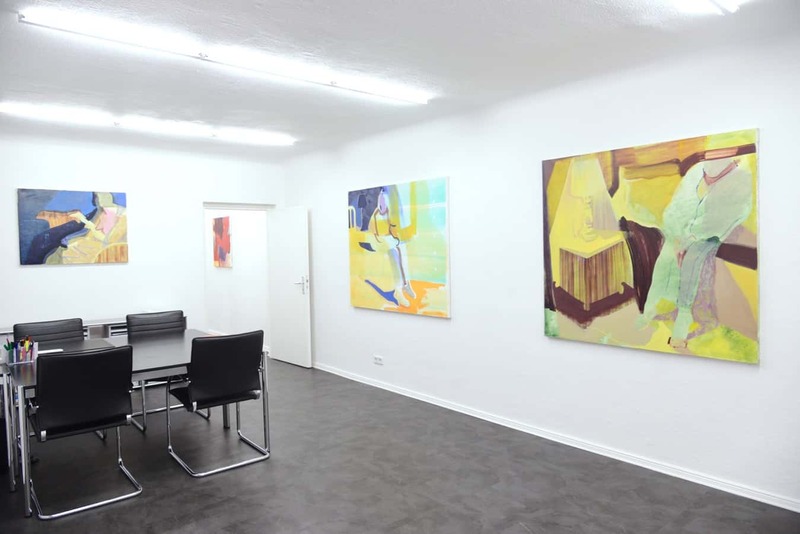 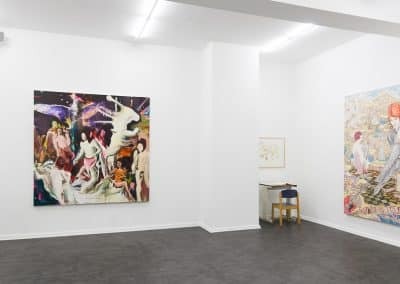 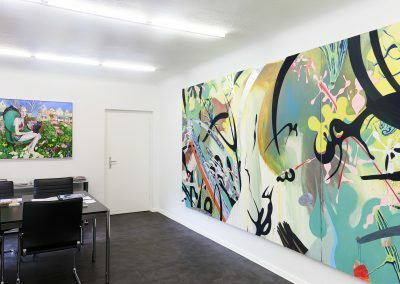 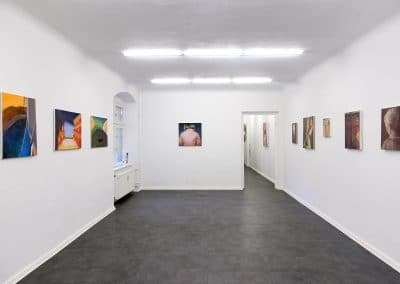 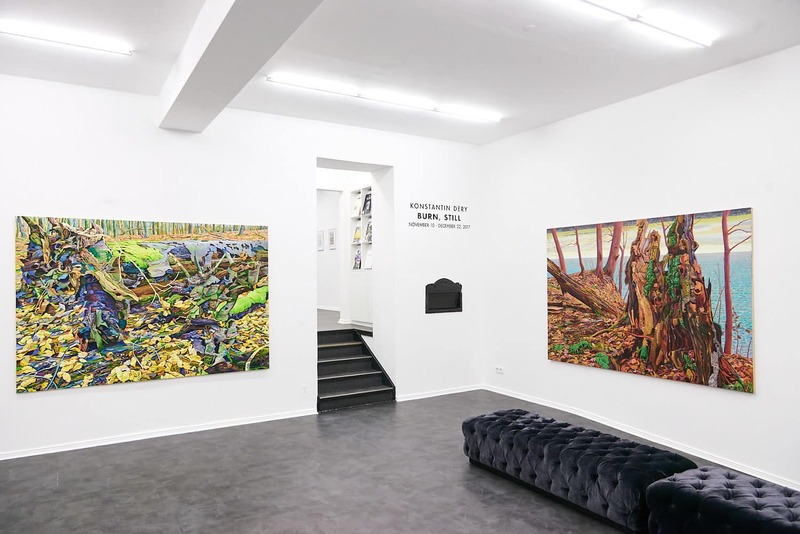 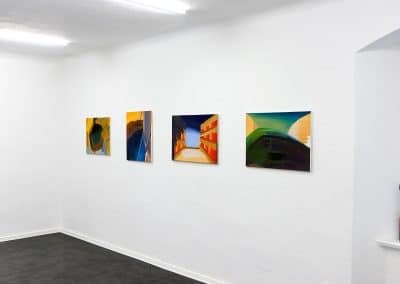 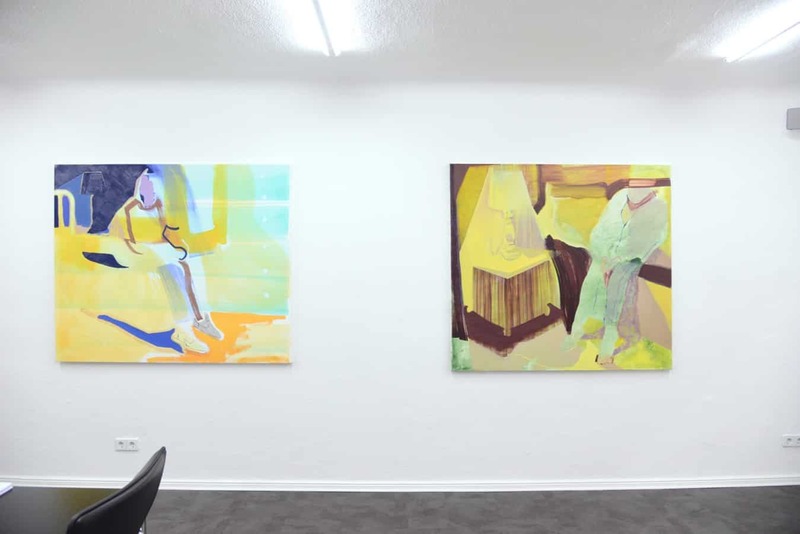 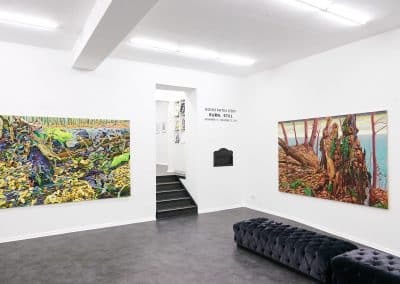 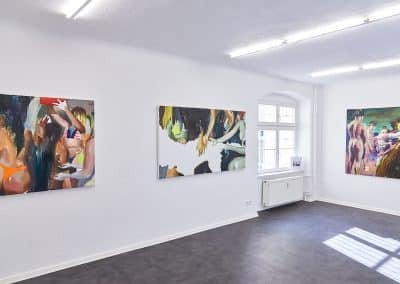 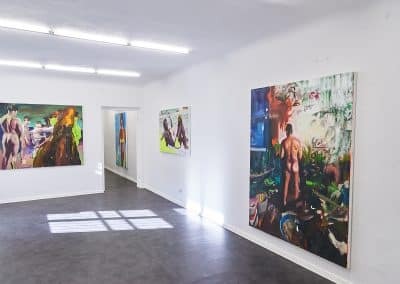 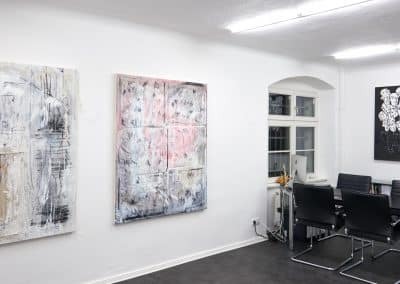 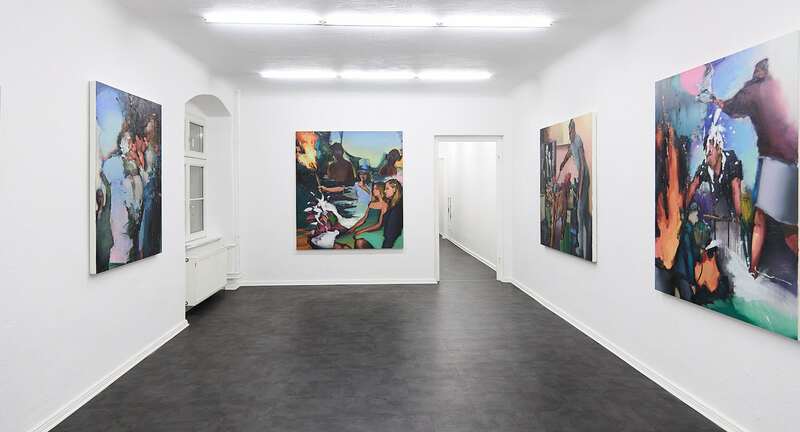 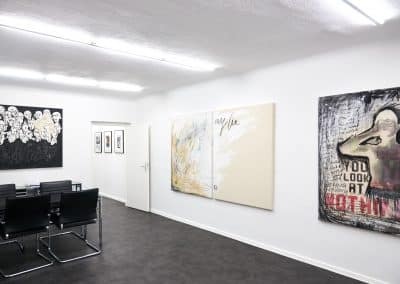 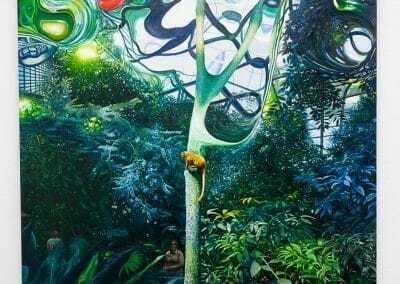 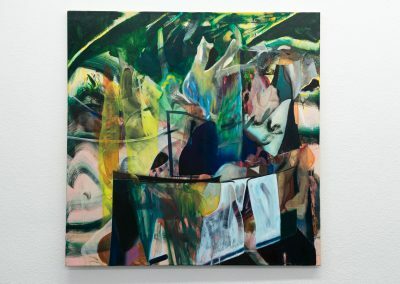 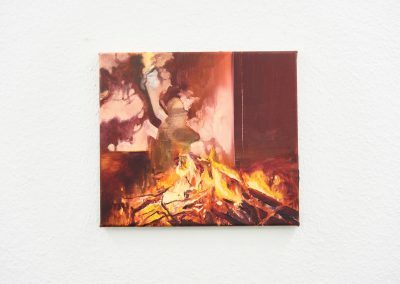 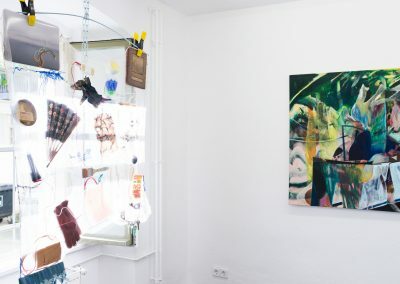 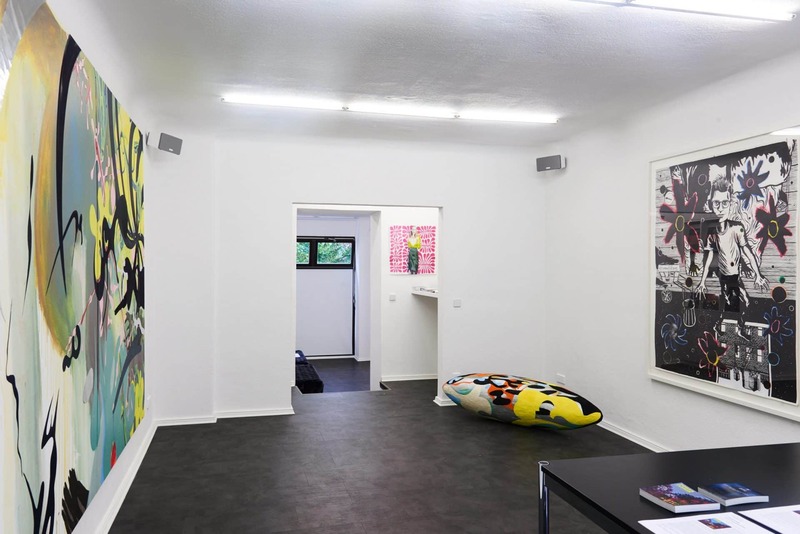 For his first solo show in Berlin, the brazilian painter Daniel Lannes (1981) presents eight canvases in which he explores a universe of alegories and clichés immersed in the atmosphere of colorful-warm locations. 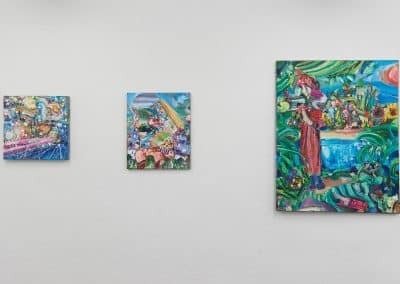 The represented scenes exude lust, irony, a bit of violence, cynical exoticism and power relations, while subtly evokes the cultural and historical background of Rio de Janeiro City, where the artist grew up. 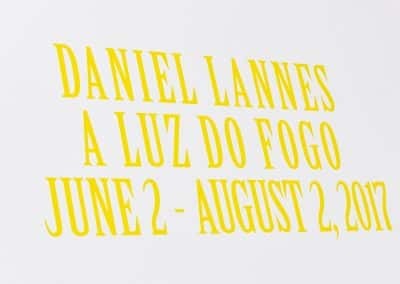 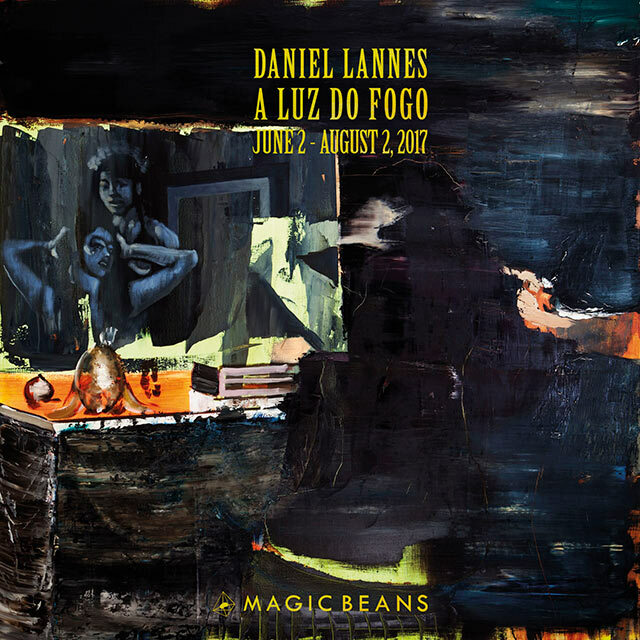 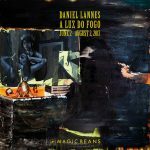 Completing 10 years of artistic practice, Lannes has been pointed out by critics as one of the highlights of his generation in Brazil. 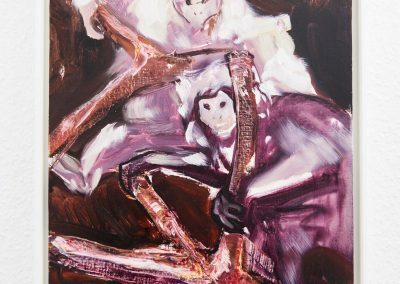 His paintings are inspired by diverse historical references as well as banal images found in old books, magazines and the media in general. 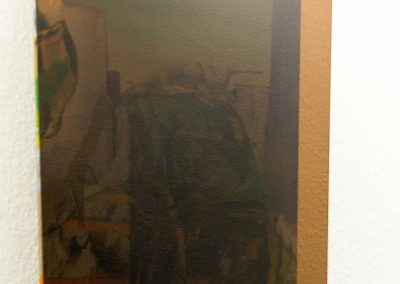 The artist open up a deep discussion on Western painting legacy and its heritage in Brazil – especially the history of Brazilian academic art seeded by the Imperial Fine Arts Academy (Academia Imperial de Belas Artes) founded in 1816 in Rio, capital of the former Colony, by french masters and established there under the orders of King Dom João VI of Portugal. 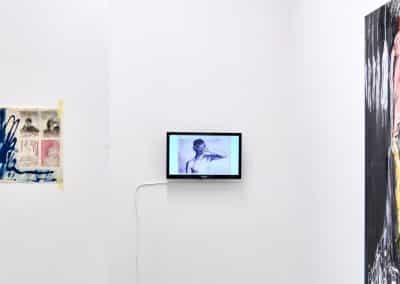 viewer to get access to the past, present and future. 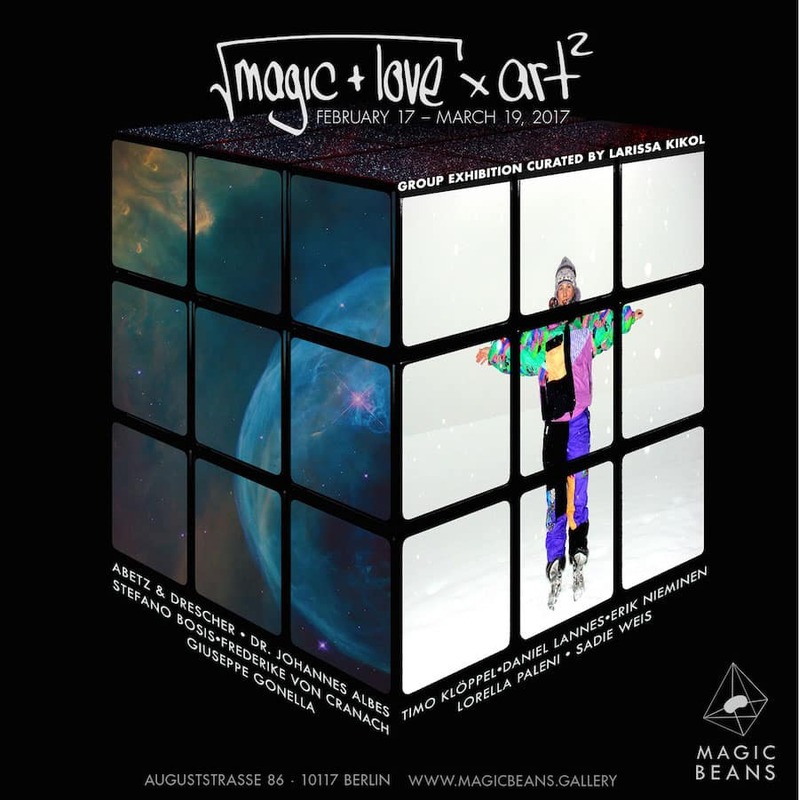 The square root of “magic” plus “love” multiplied by “art squared” is an amusing equation that allows one to contemplate artworks that conjure the unknown. 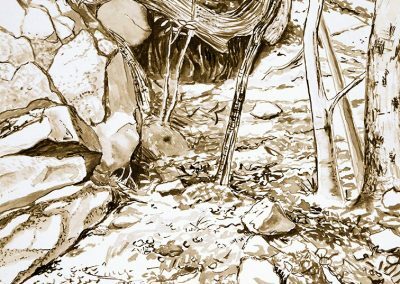 Traditionally magic was, in essence, a transformation — taking something less valuable and making it remarkable. 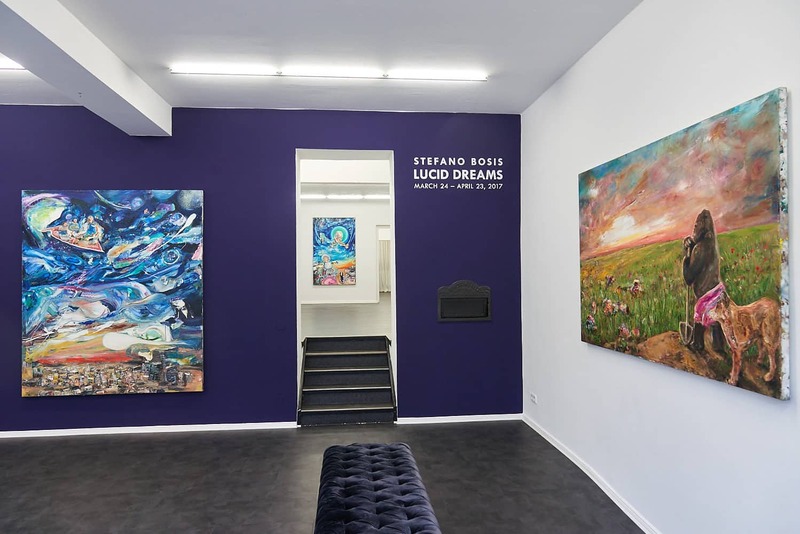 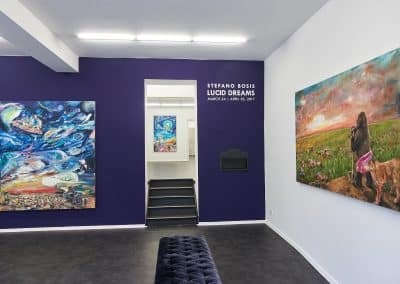 The works in this group exhibition are infused with a cathartic spirit and vision of the universe that is expansive, always in motion and open to mystery. 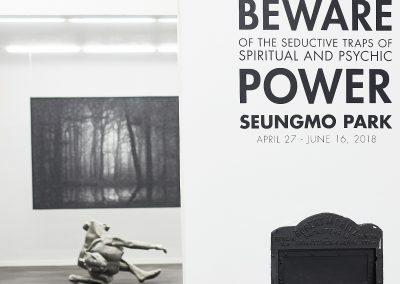 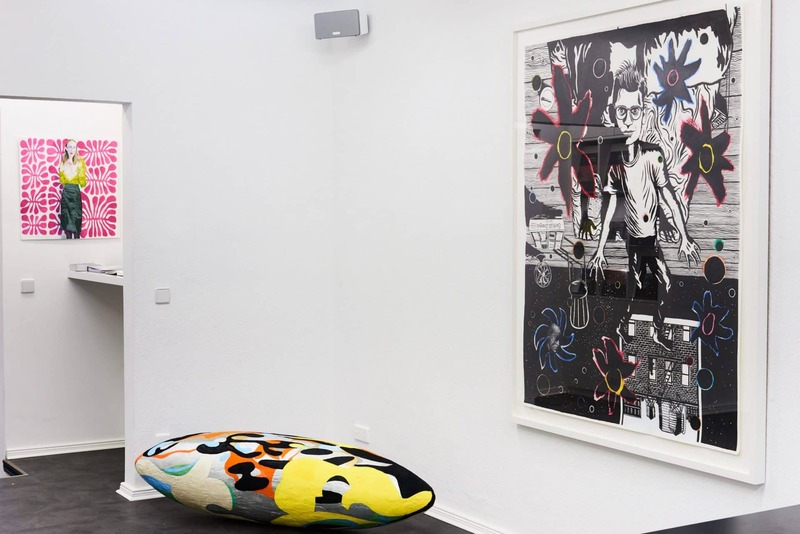 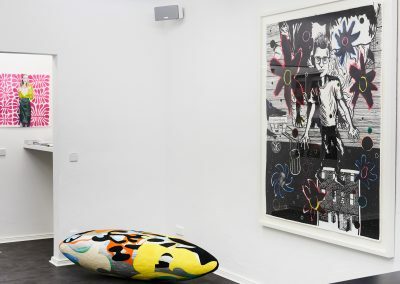 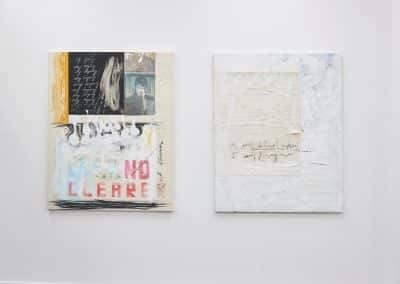 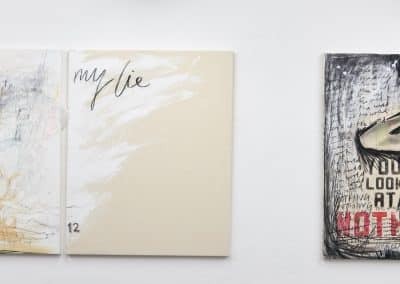 The message embedded in the tongue-in-cheek formula, that is the exhibition’s title, suggests that the artist’s role is to find inspiration in the unusual and to create enigmatic and thought provoking works. 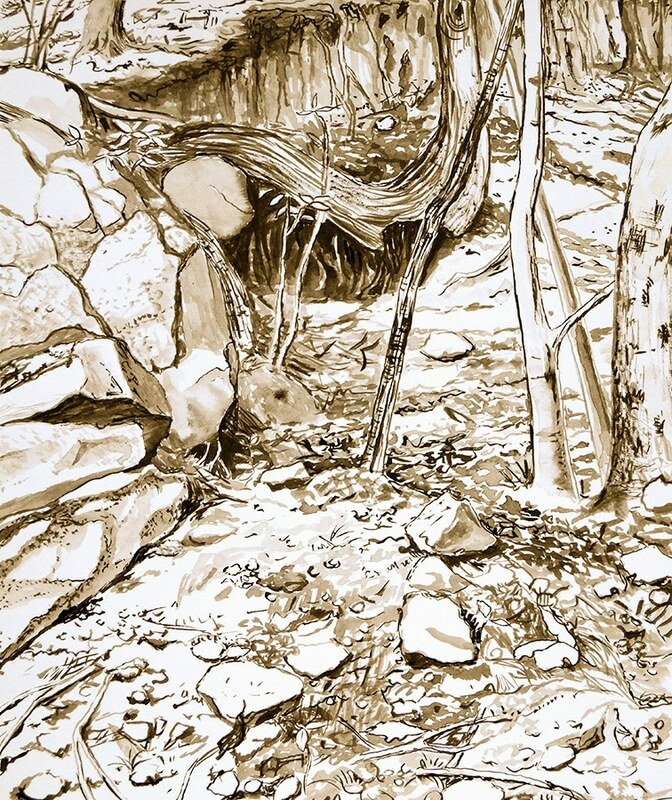 Artists are everyday shamans, their strategy and artistic process is to construct riddles out of the world. 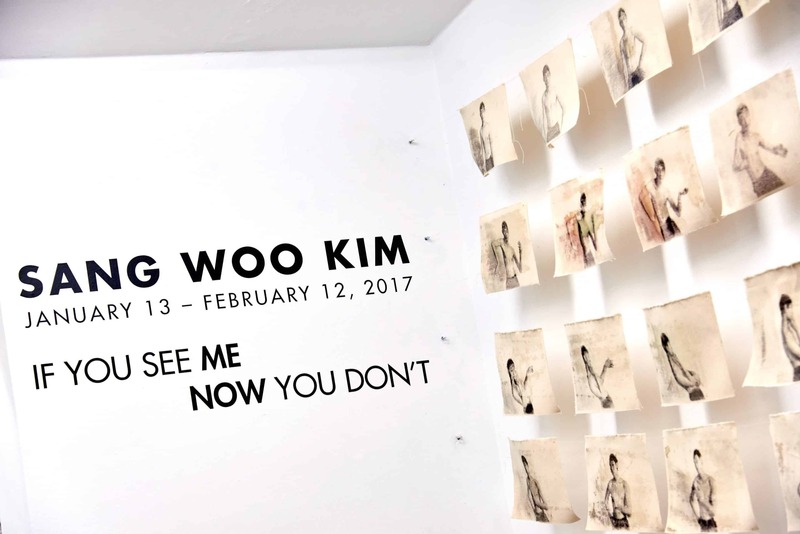 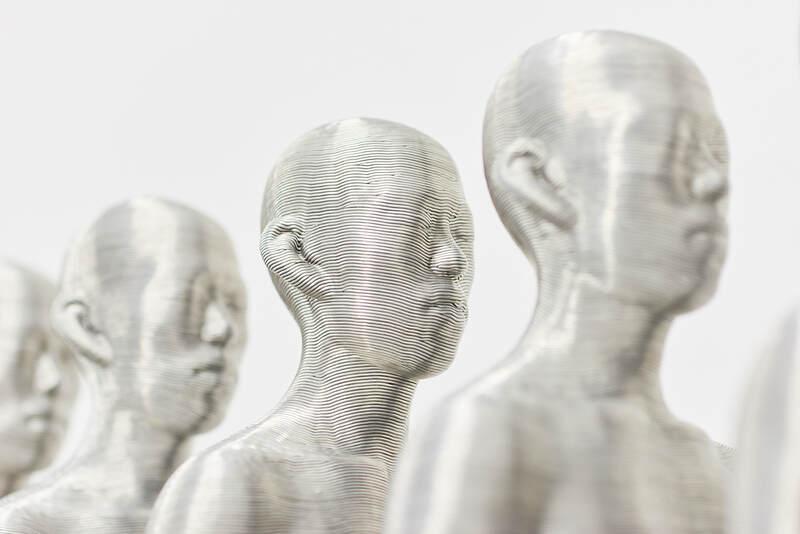 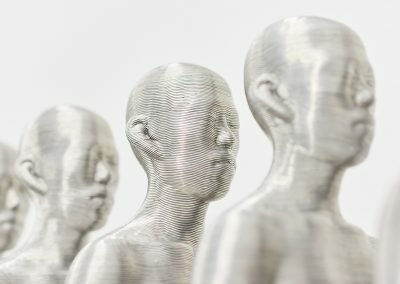 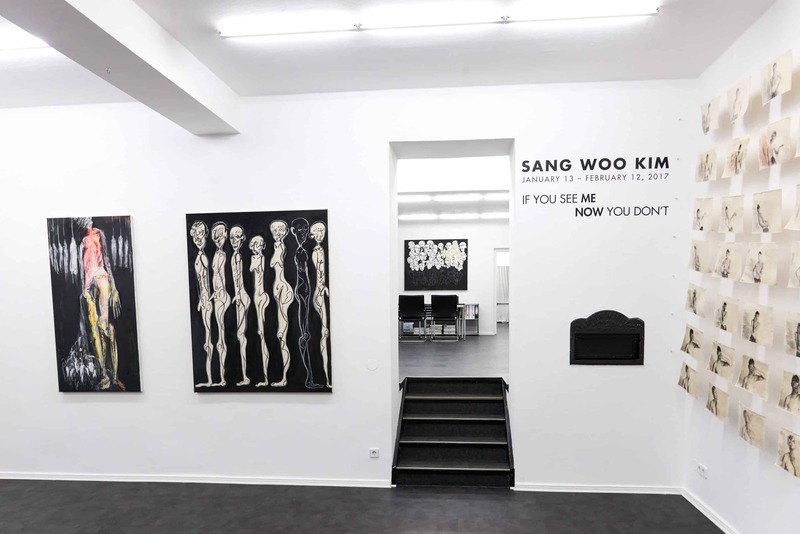 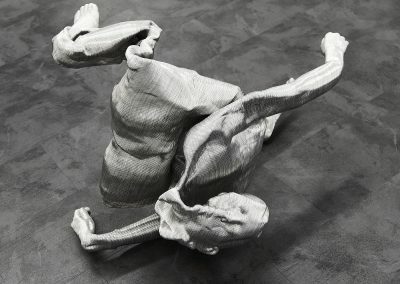 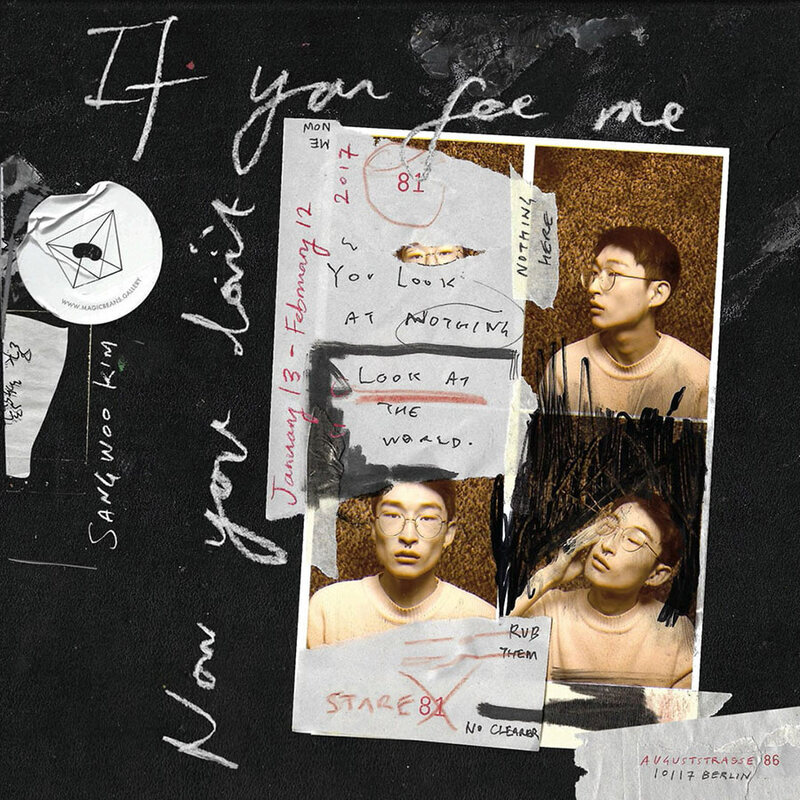 Magic Beans is pleased to announce Sang Woo Kim’s first solo exhibition, IF YOU SEE ME NOW YOU DON’T. 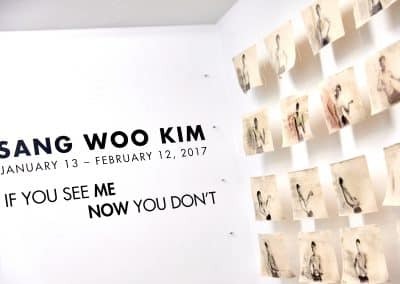 This exhibition comprises a body of new paintings, photography and video work that reflect the artist’s layered conception of identity. 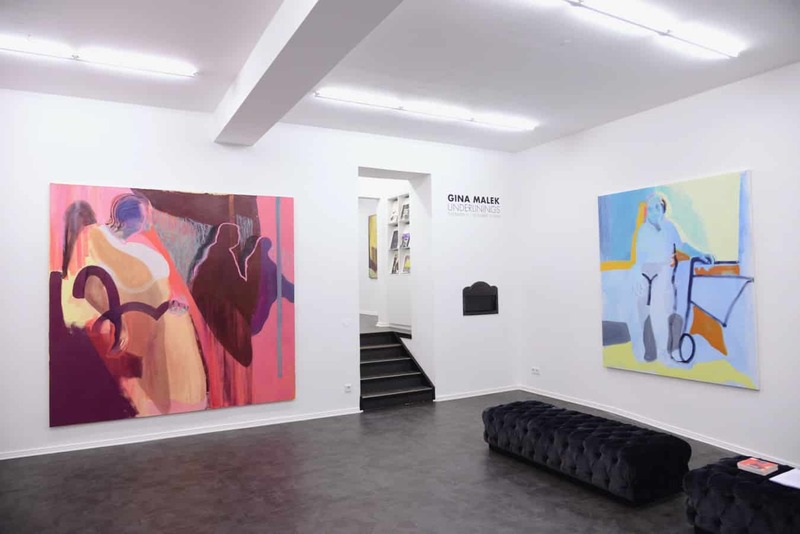 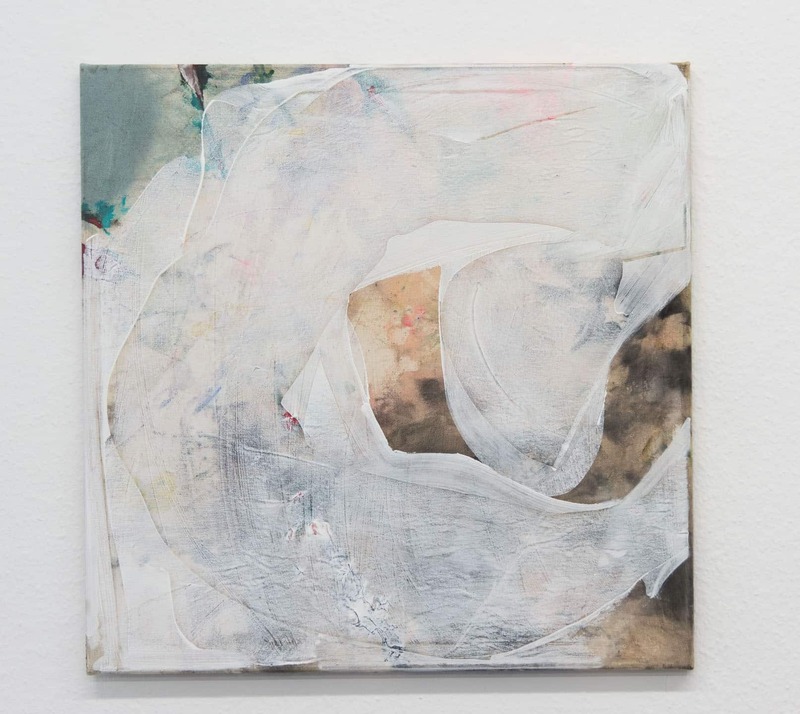 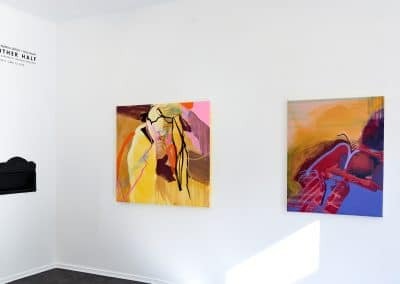 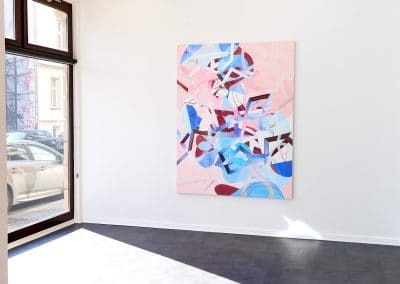 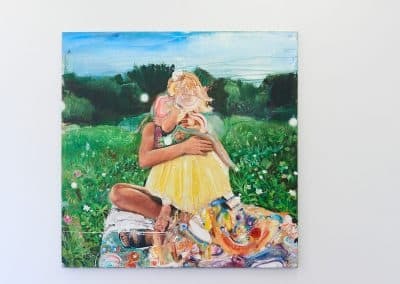 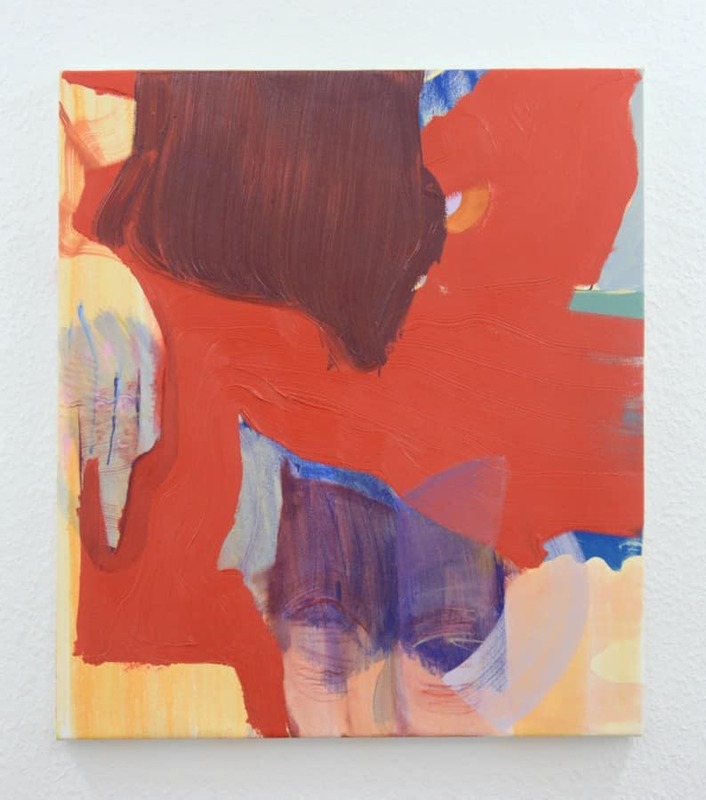 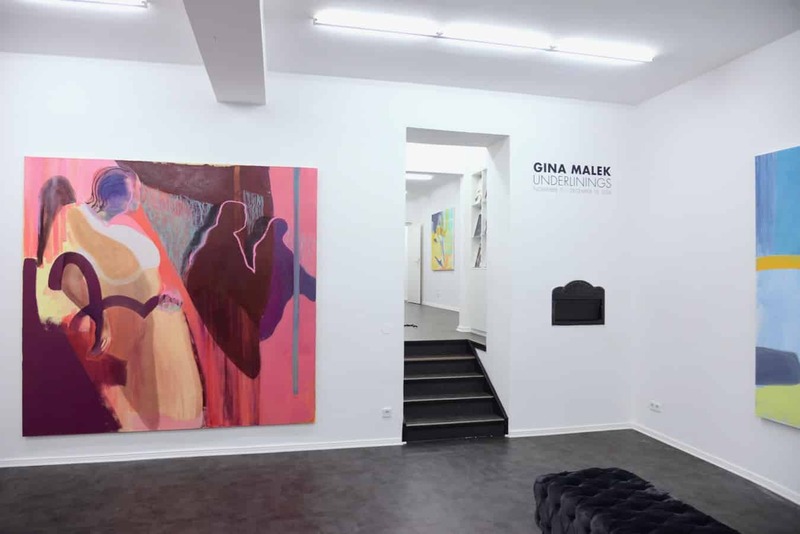 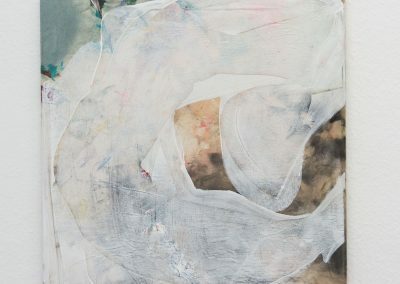 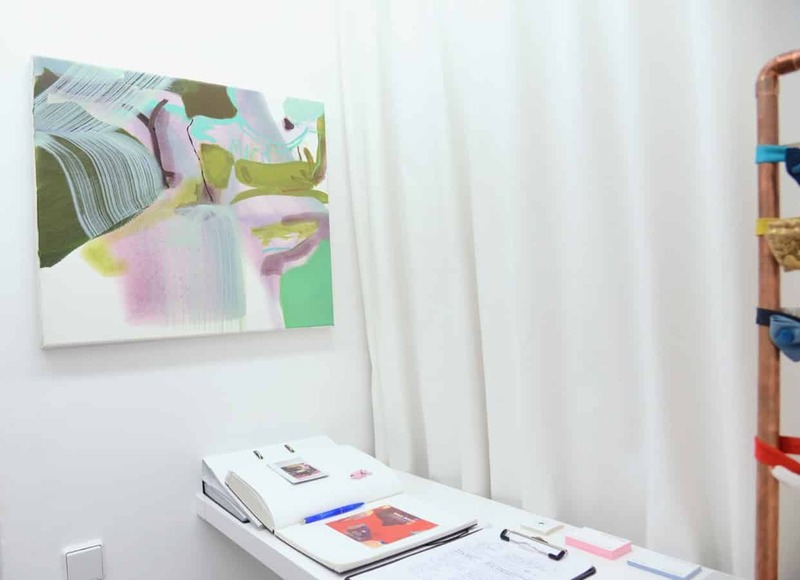 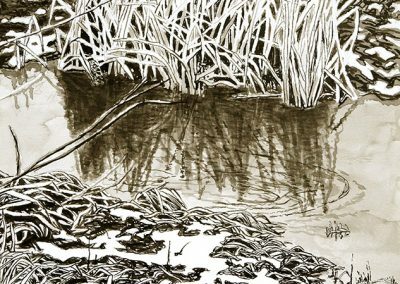 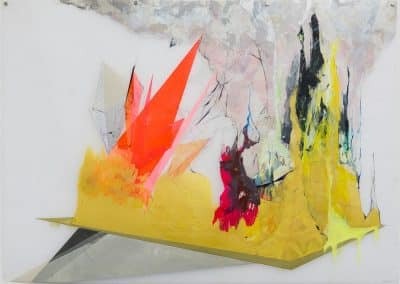 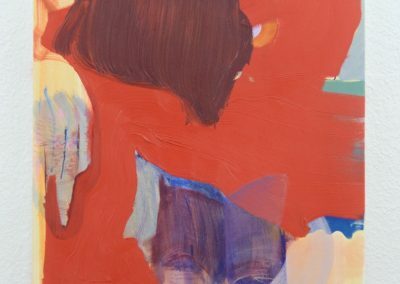 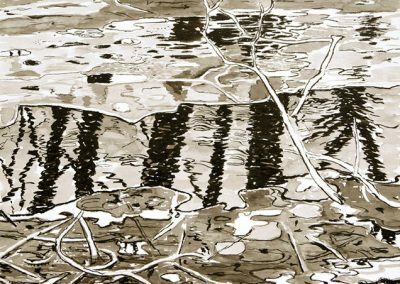 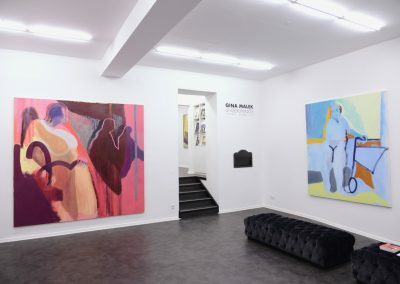 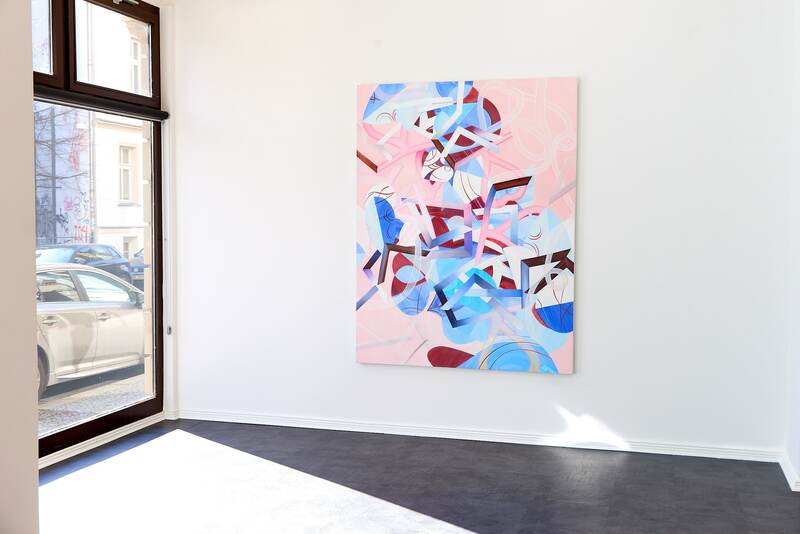 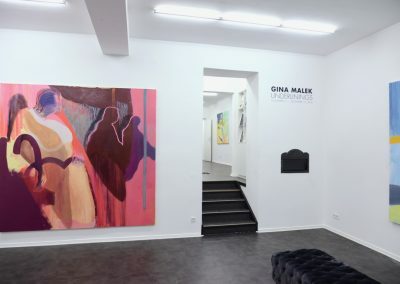 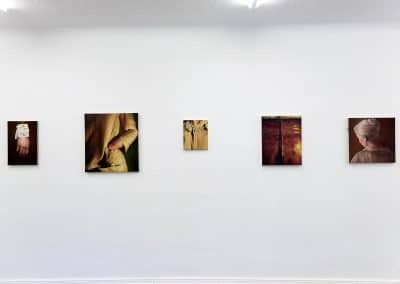 Magic Beans Gallery is pleased to present Underlinings, a solo exhibition of paintings by New York-based artist Gina Malek. 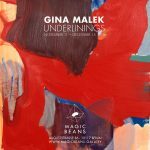 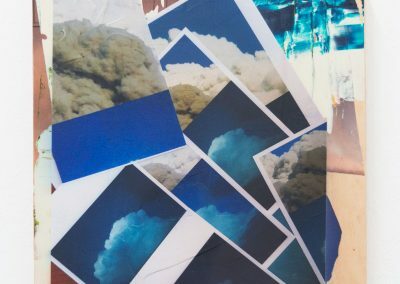 In this new body of work, Malek explores themes of confinement, the mechanics of the remembered self, and the impermanence of memory. 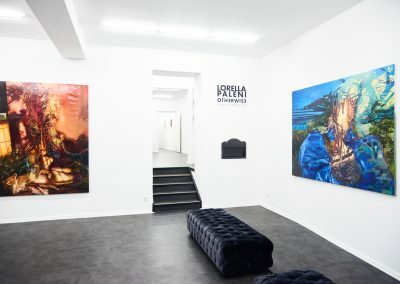 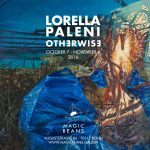 Magic Beans is pleased to announce Lorella Paleni’s first solo exhibition with the gallery. 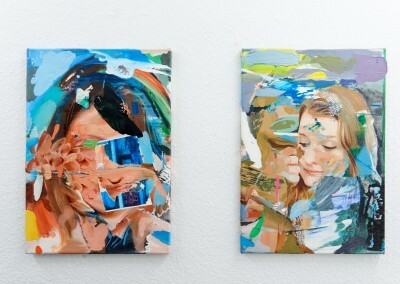 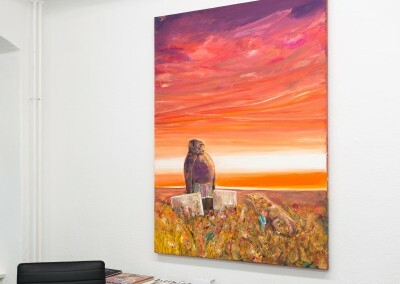 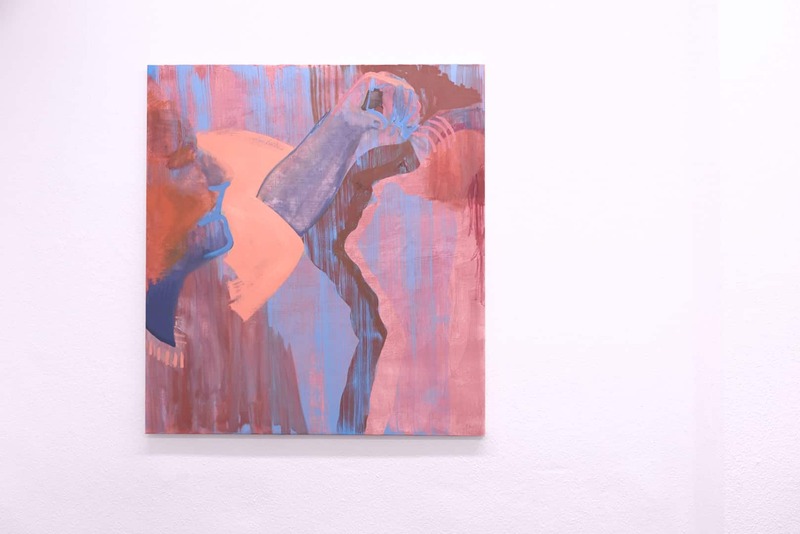 “OTHƎRWISƎ” is a cohesive body of new paintings investigating animal and human relationships. 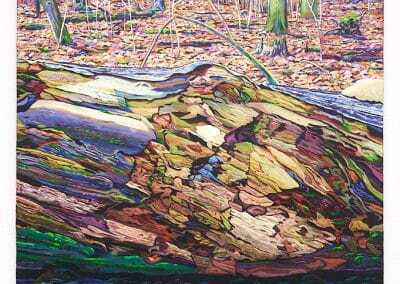 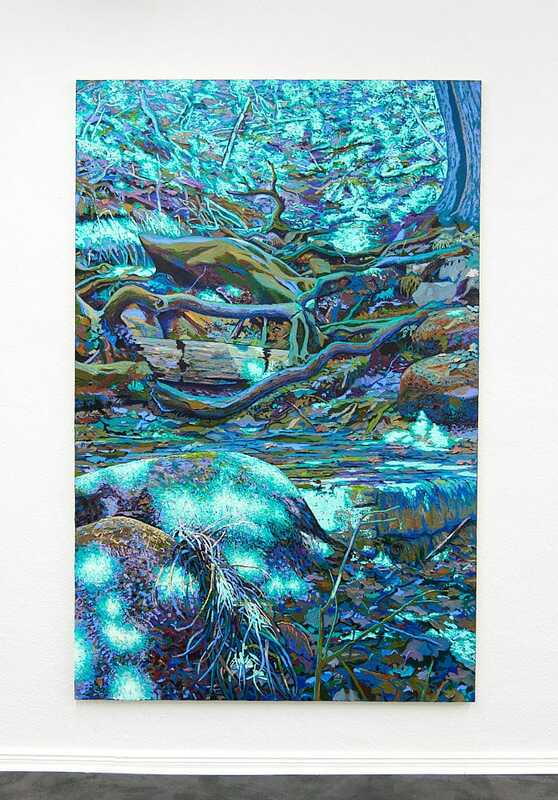 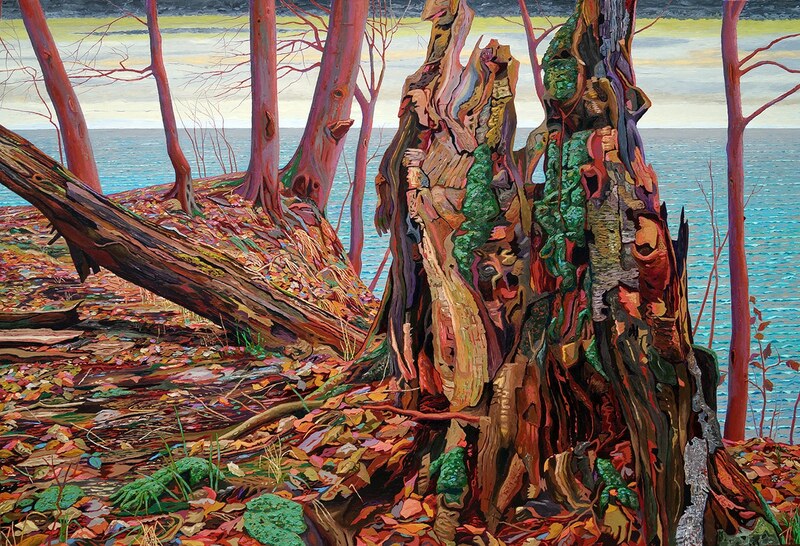 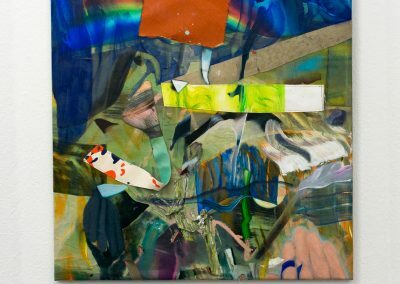 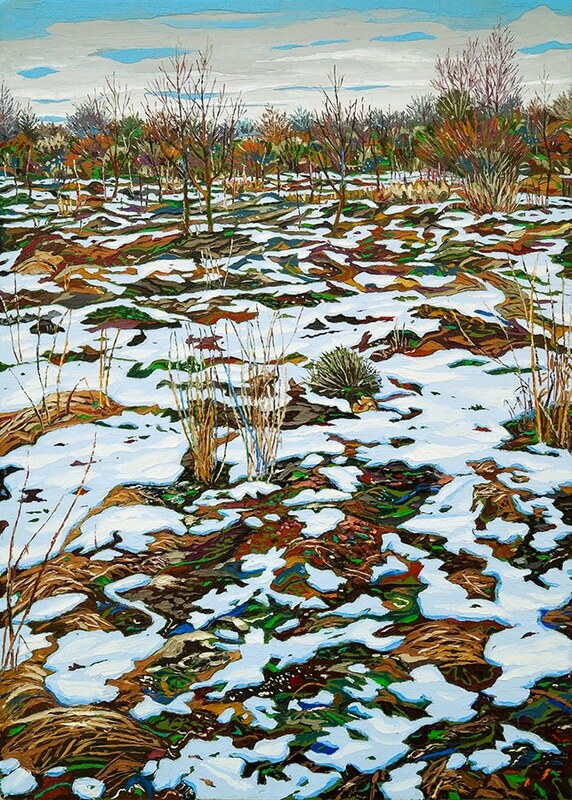 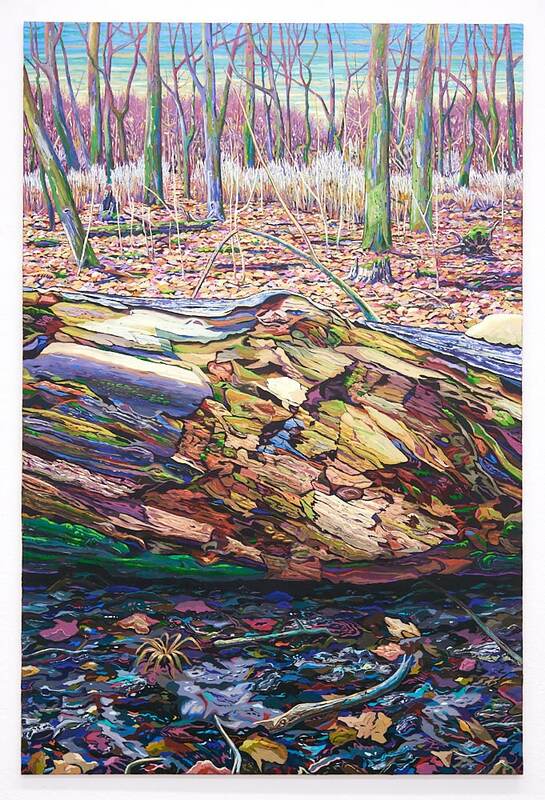 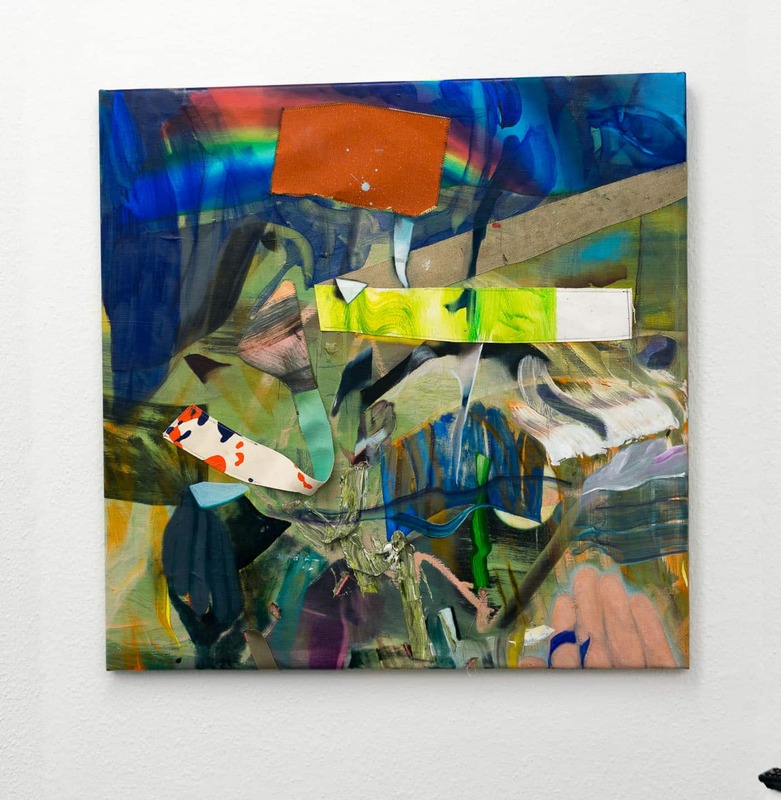 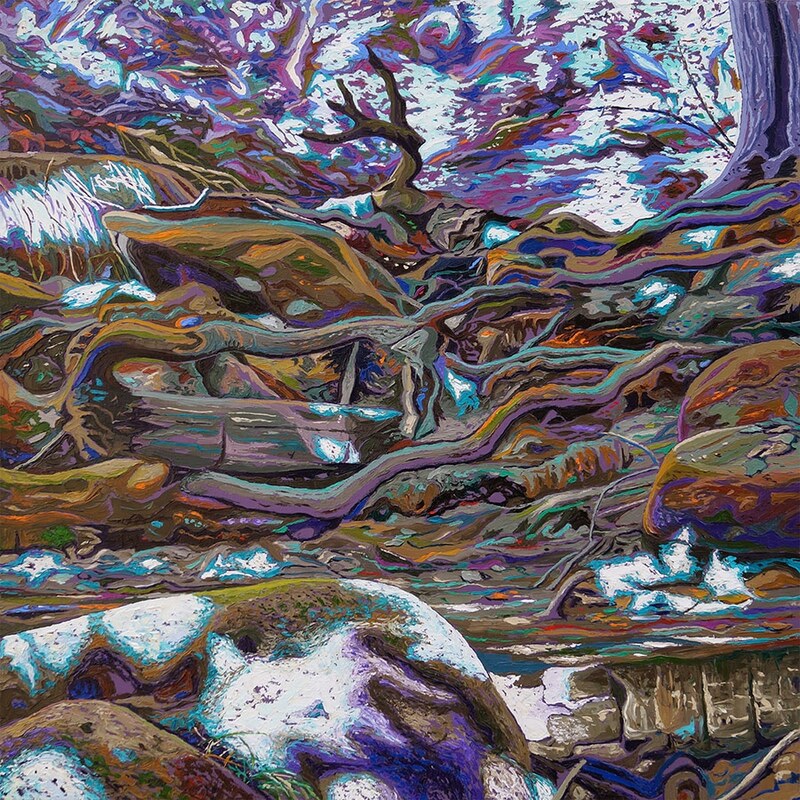 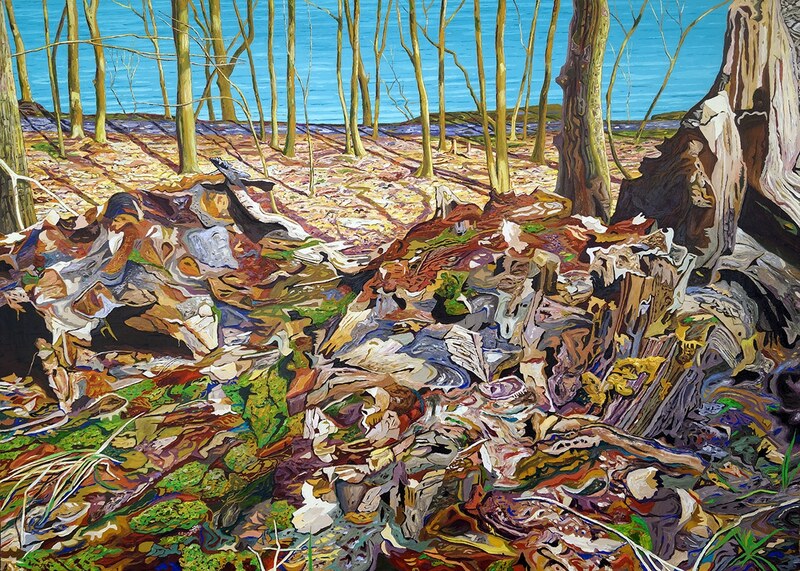 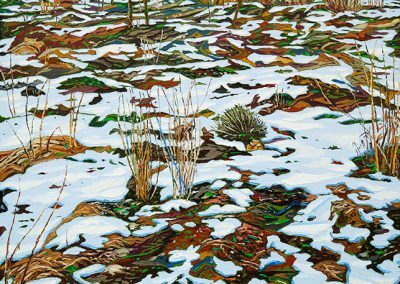 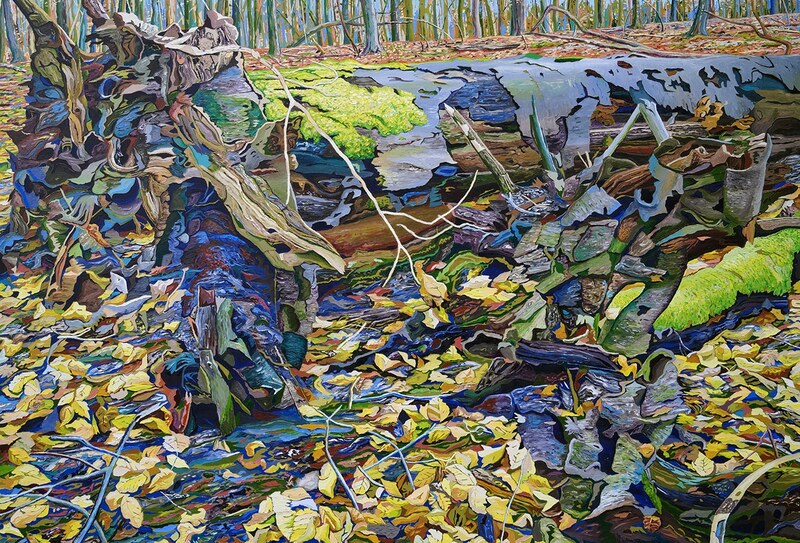 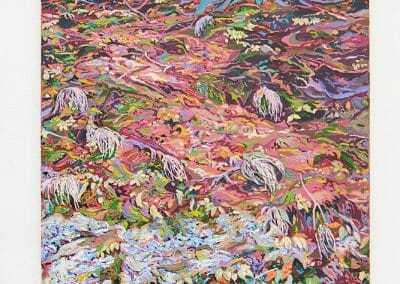 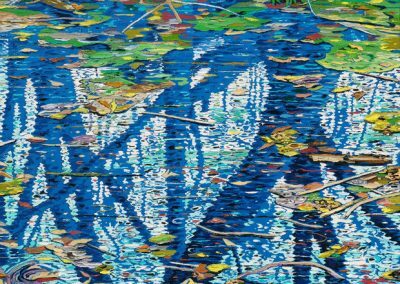 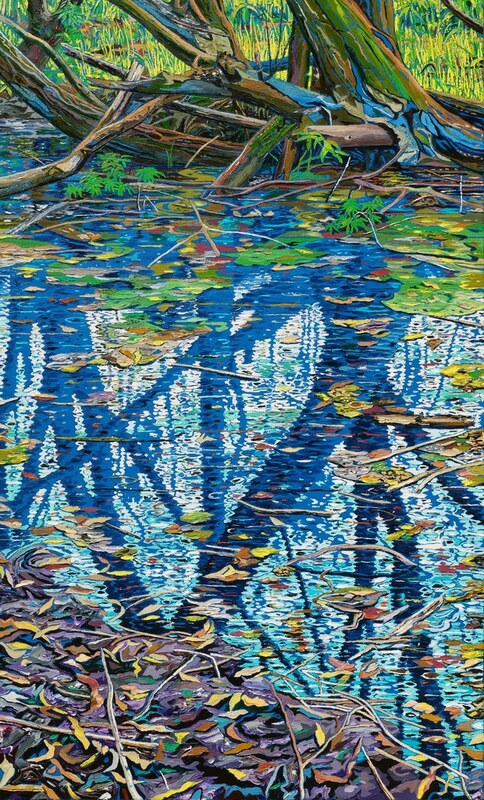 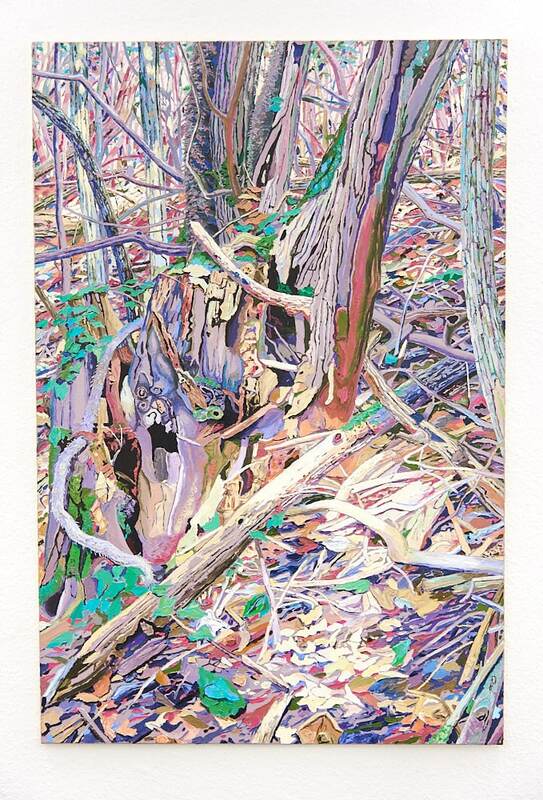 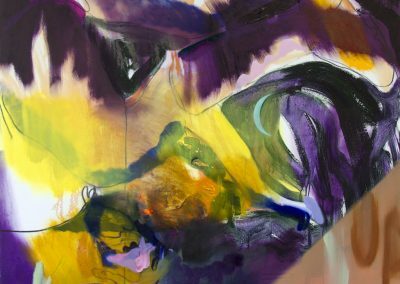 With colorful and contrasting hues, the paintings are built on layers and transparencies. 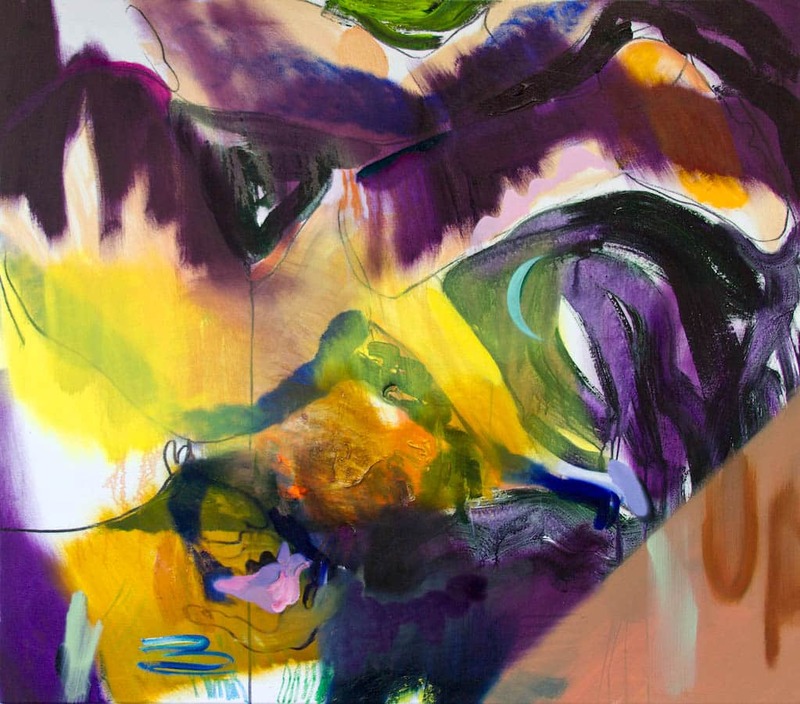 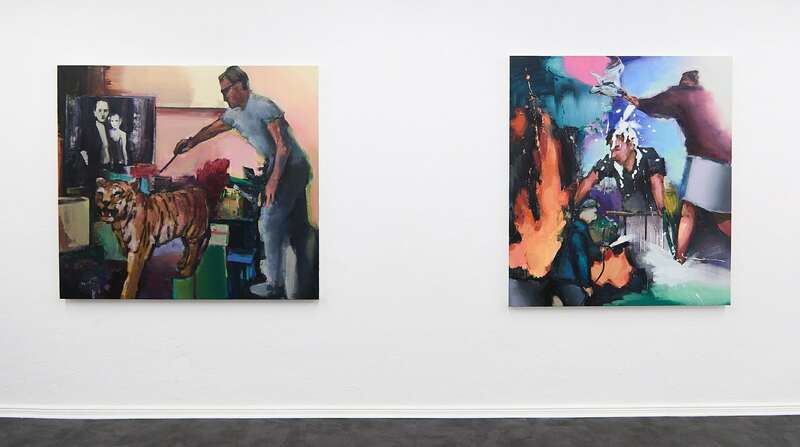 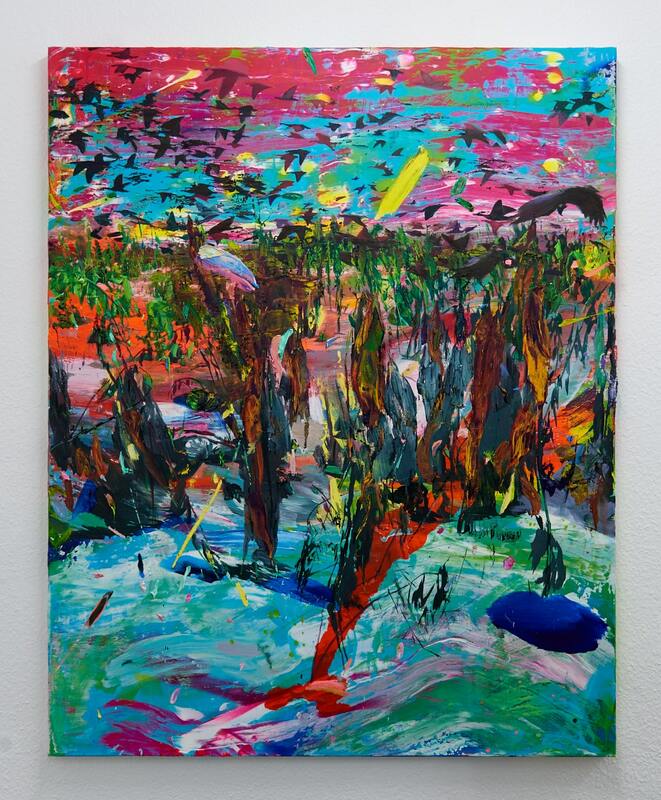 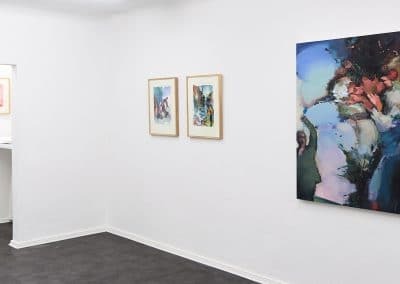 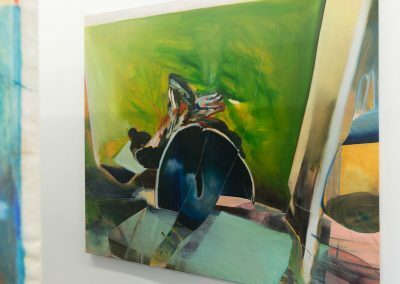 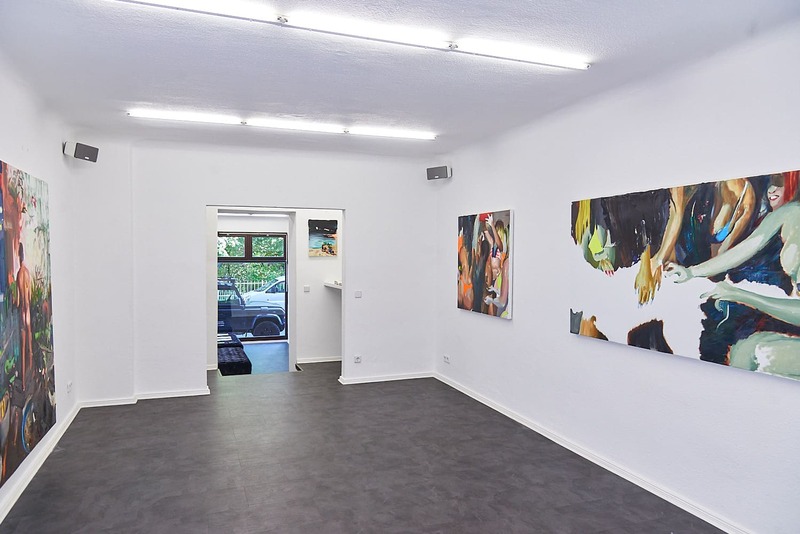 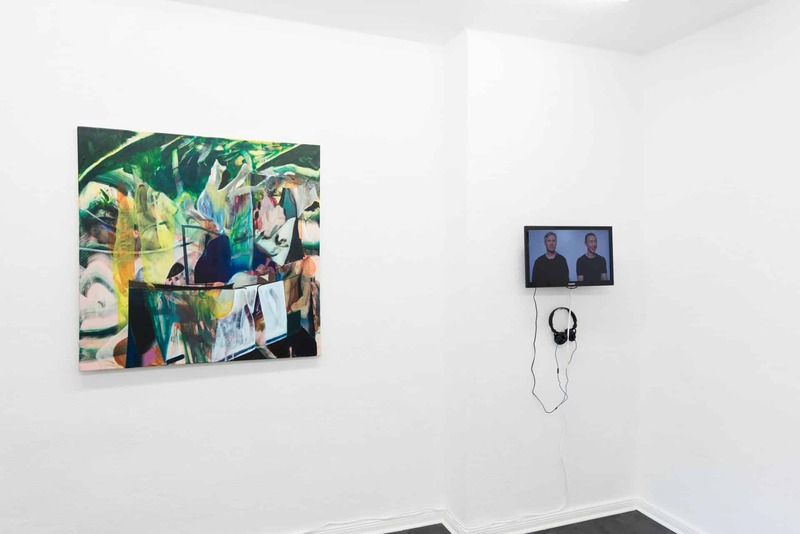 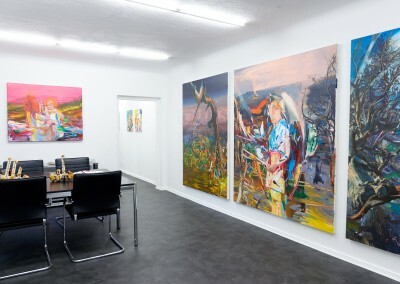 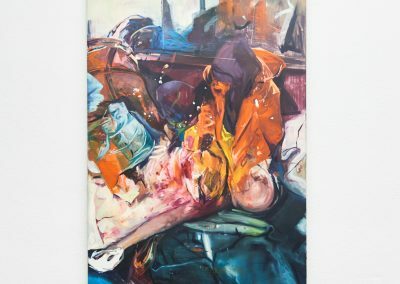 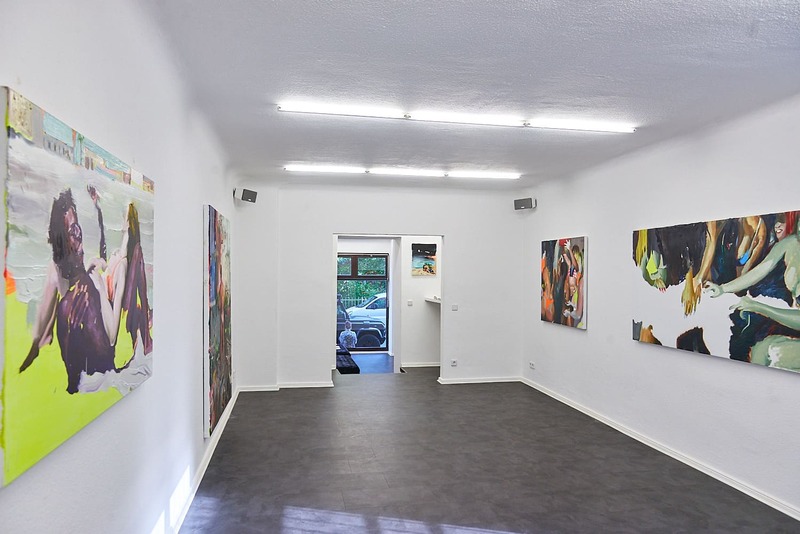 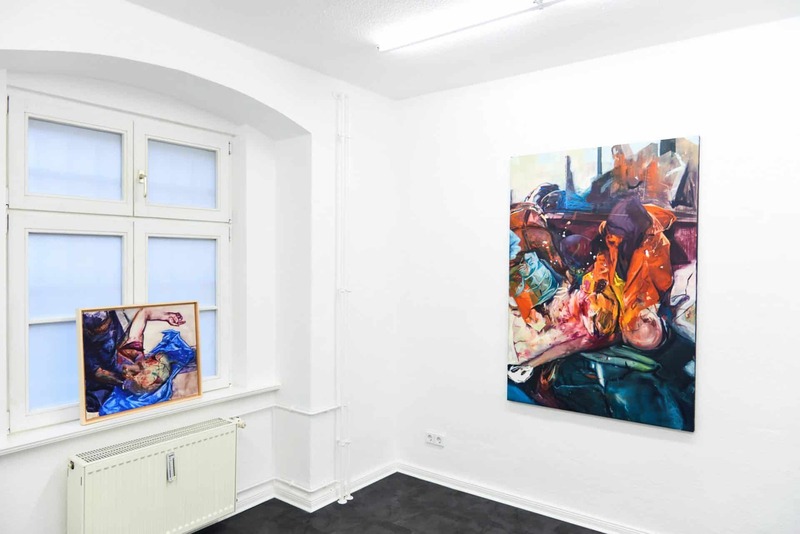 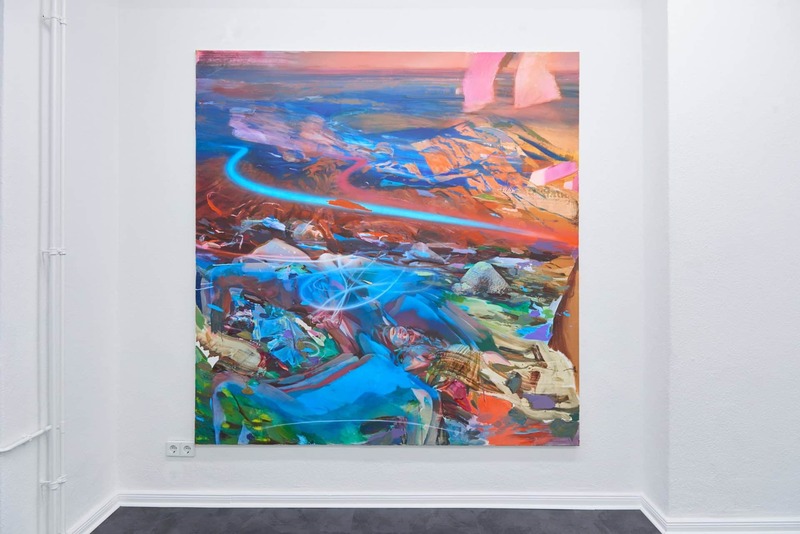 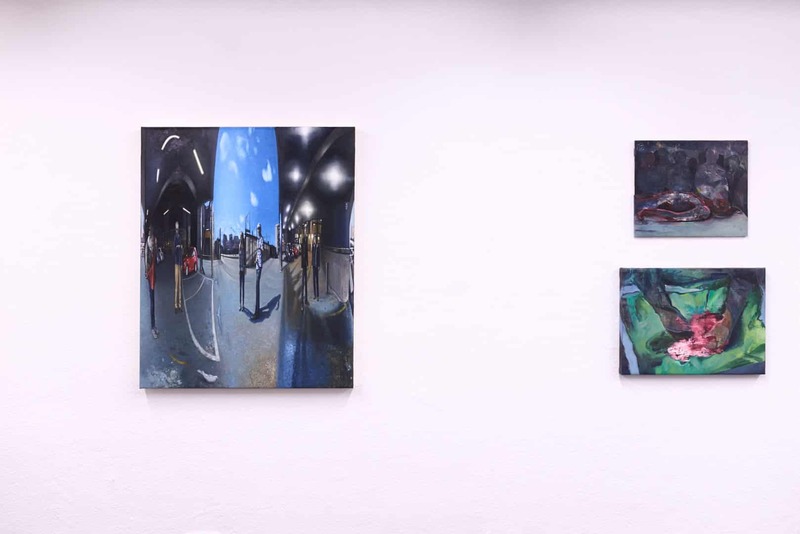 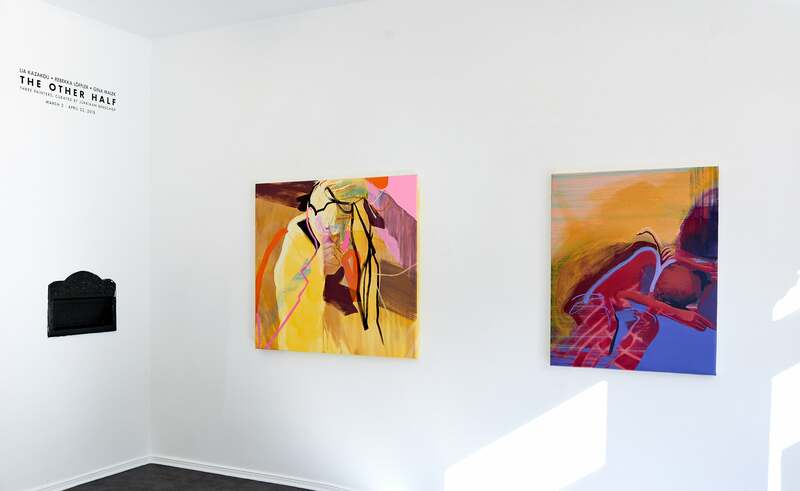 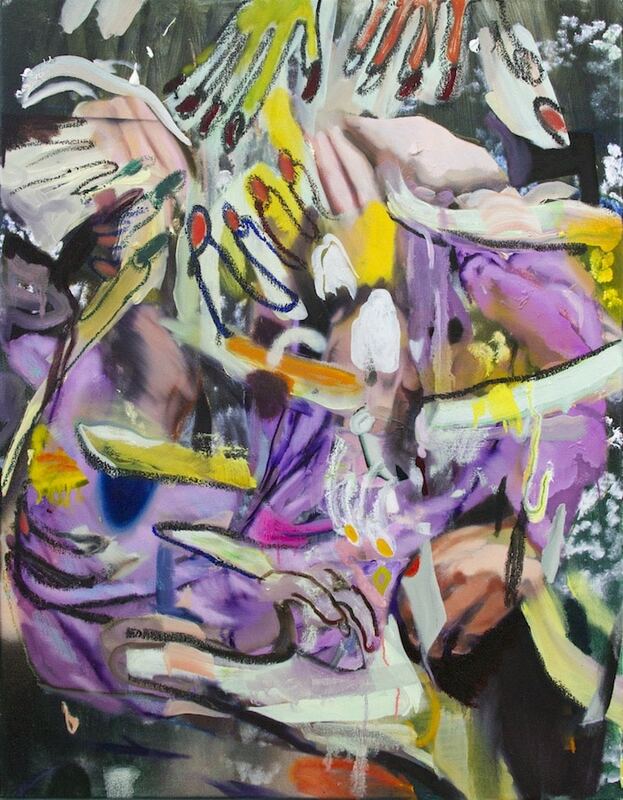 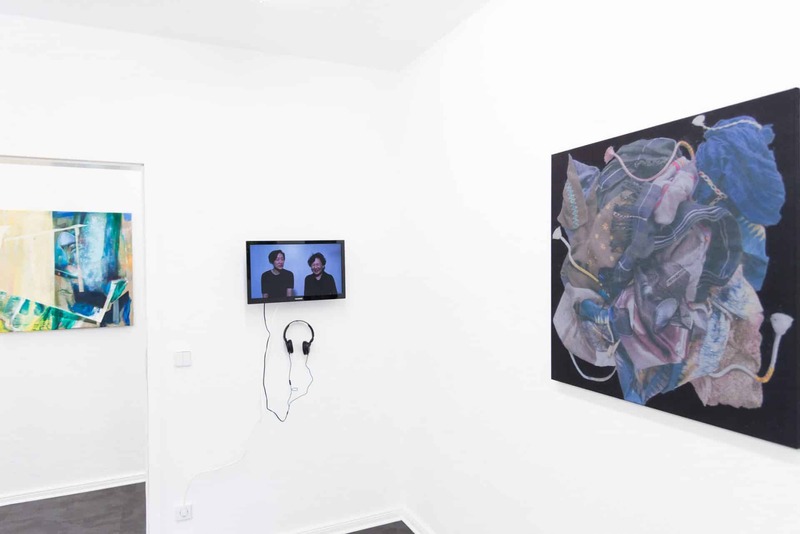 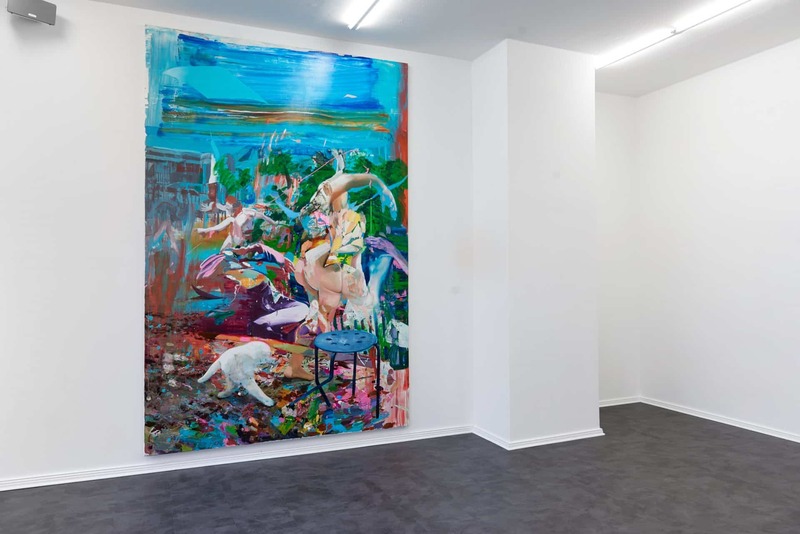 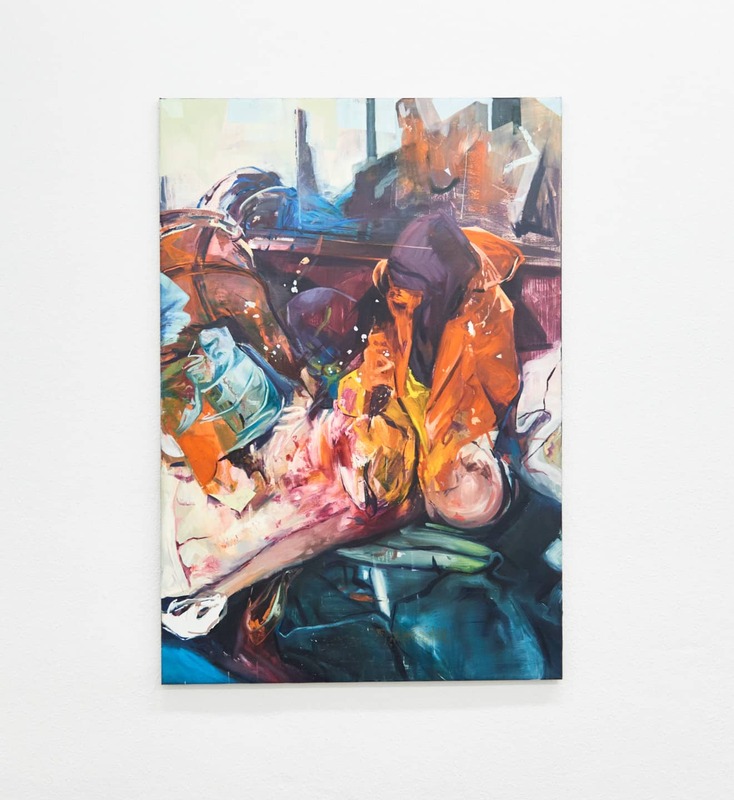 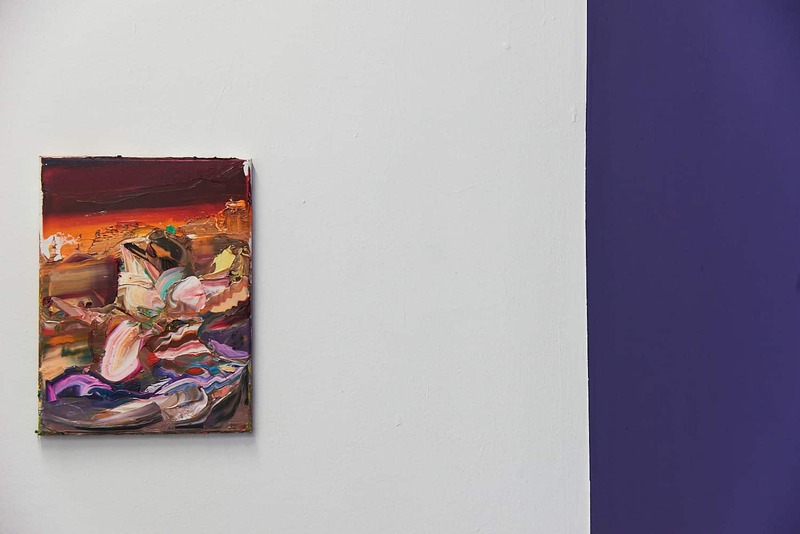 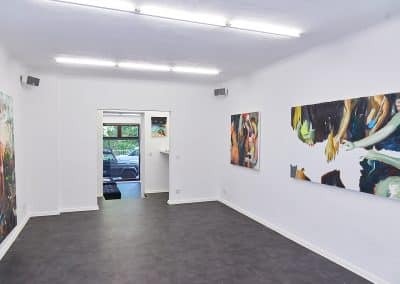 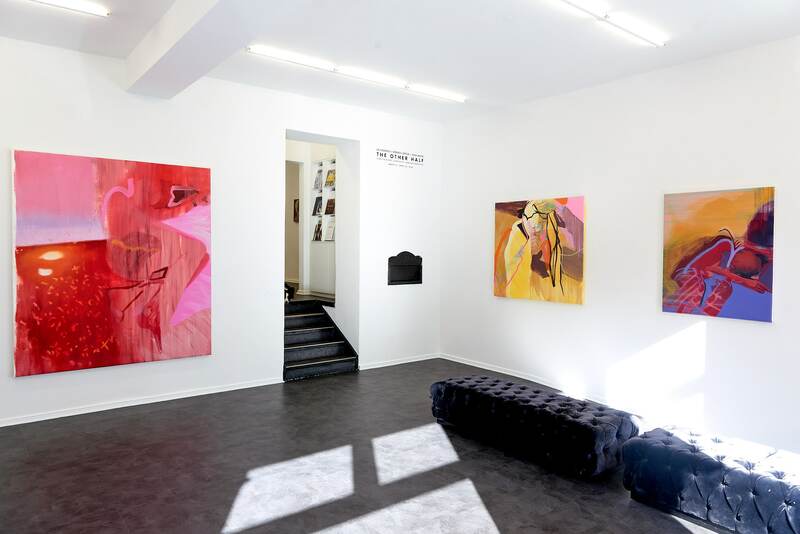 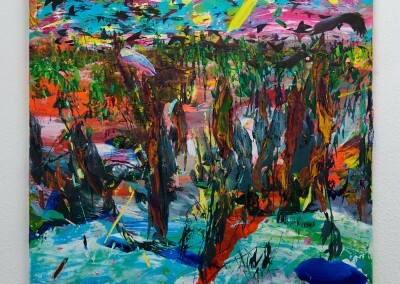 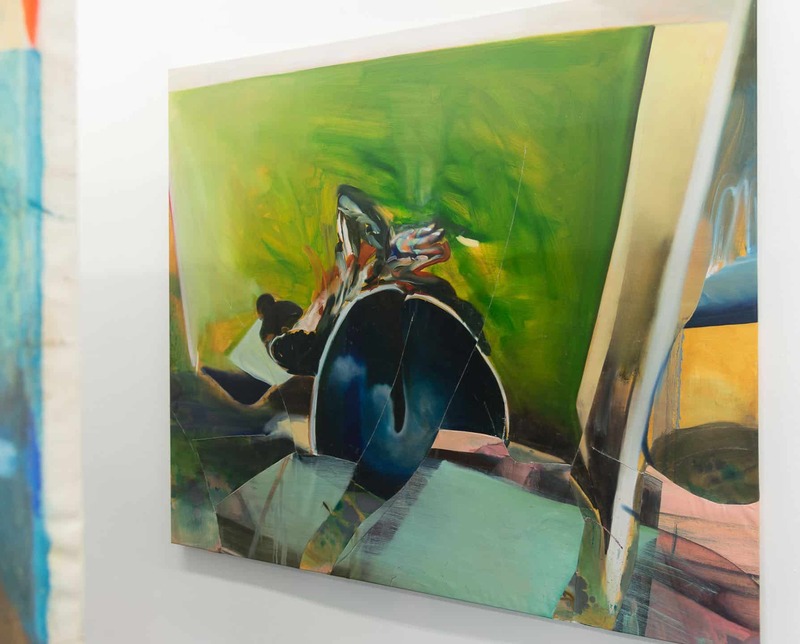 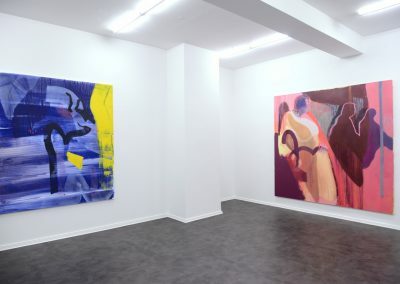 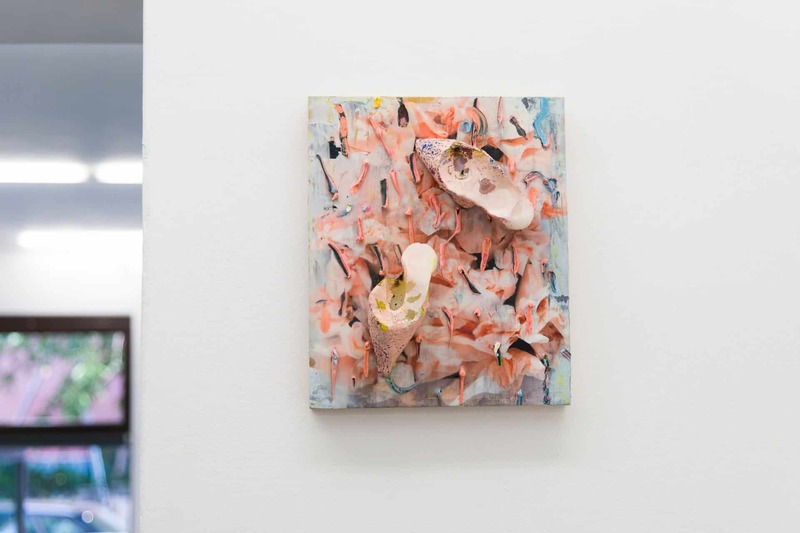 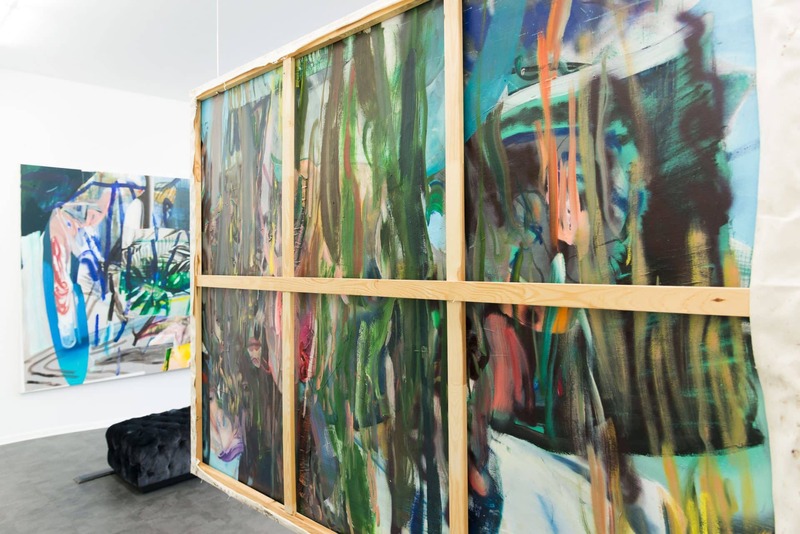 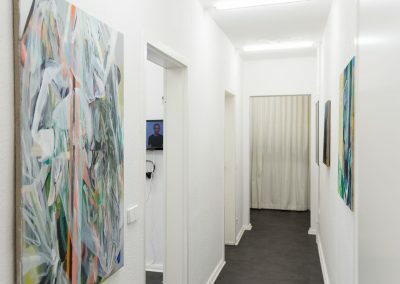 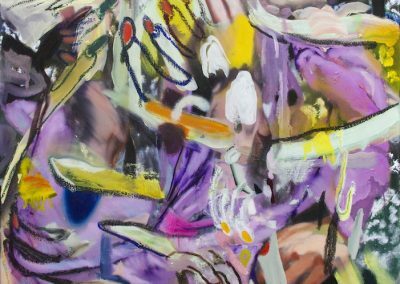 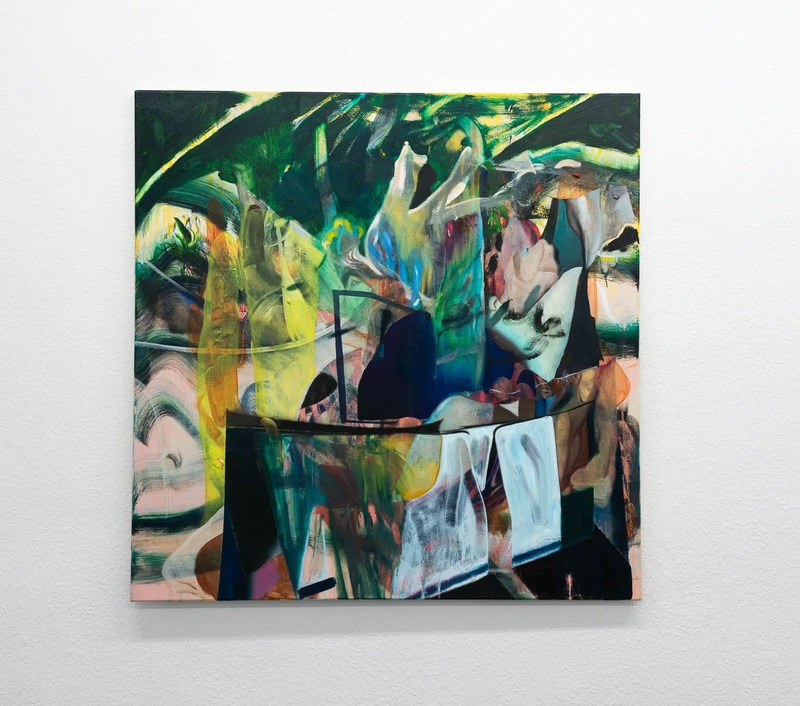 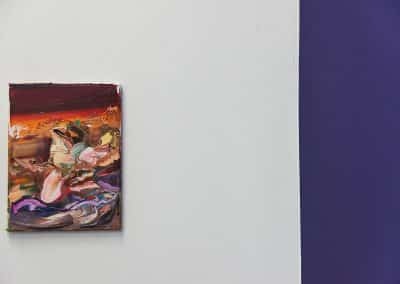 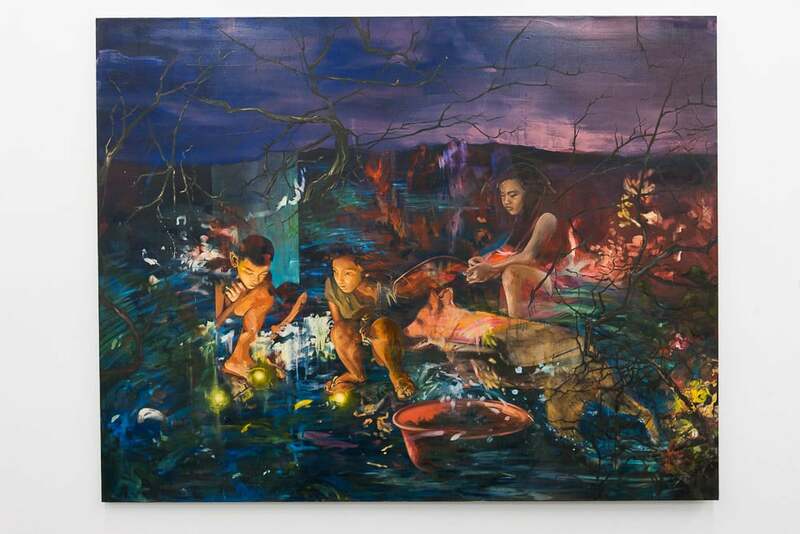 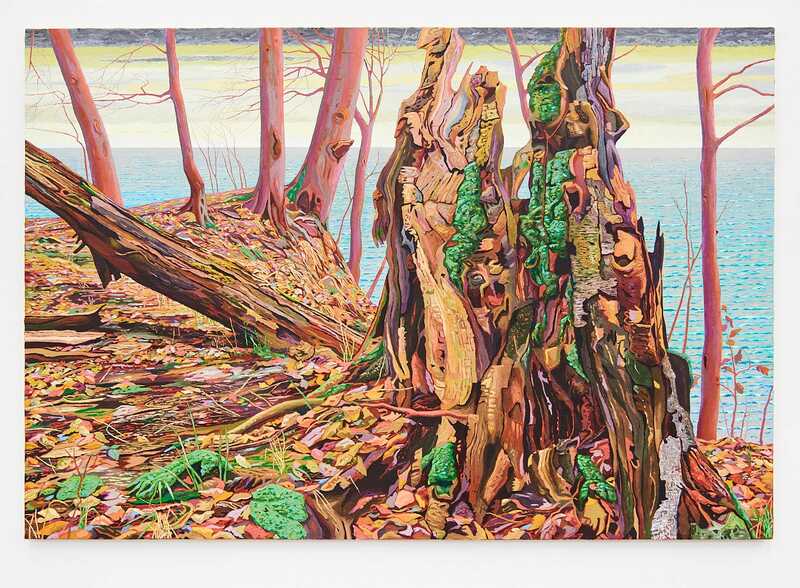 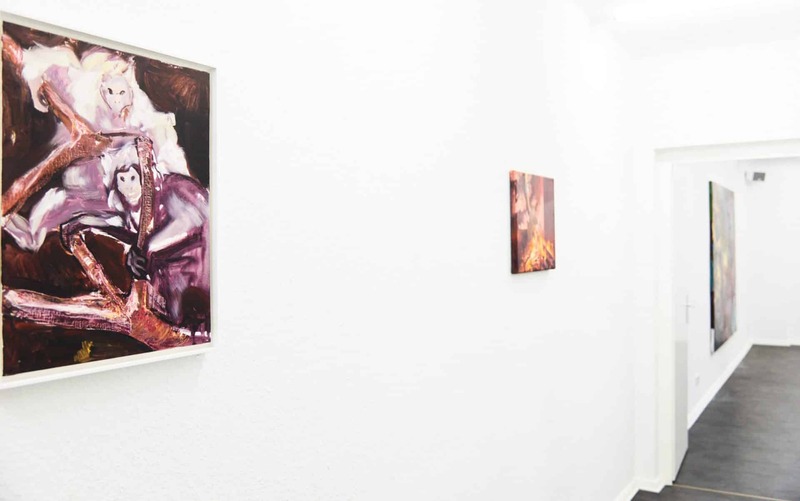 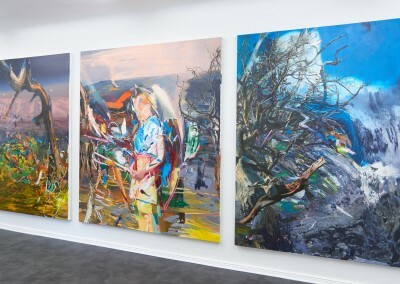 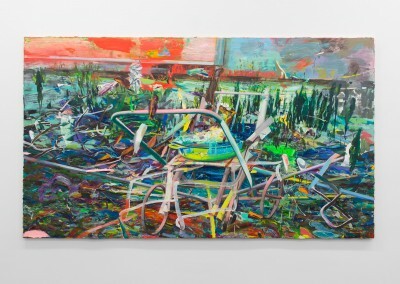 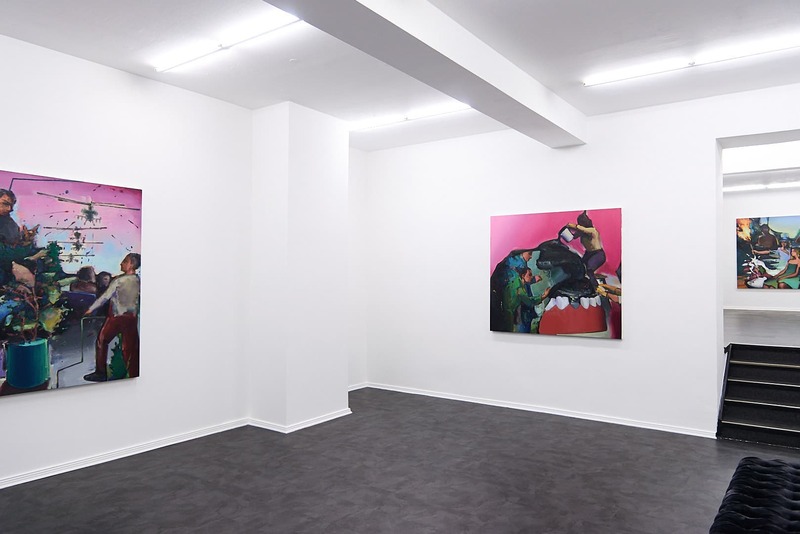 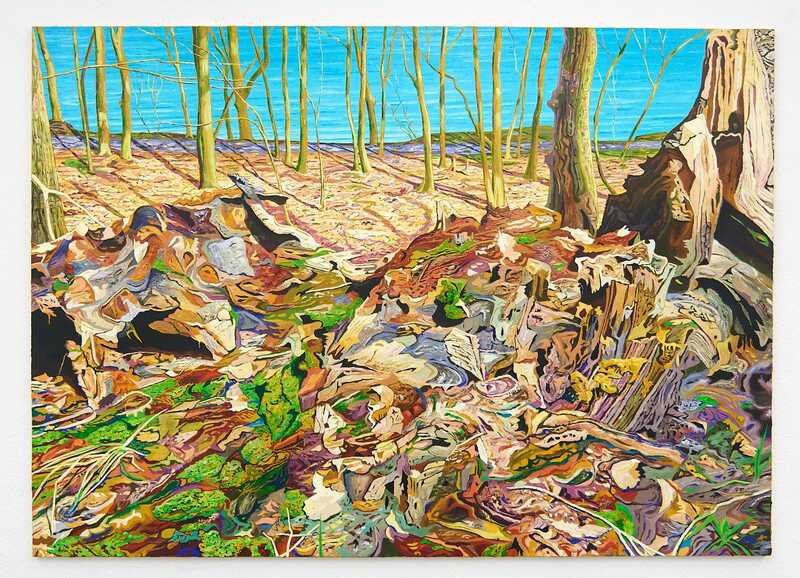 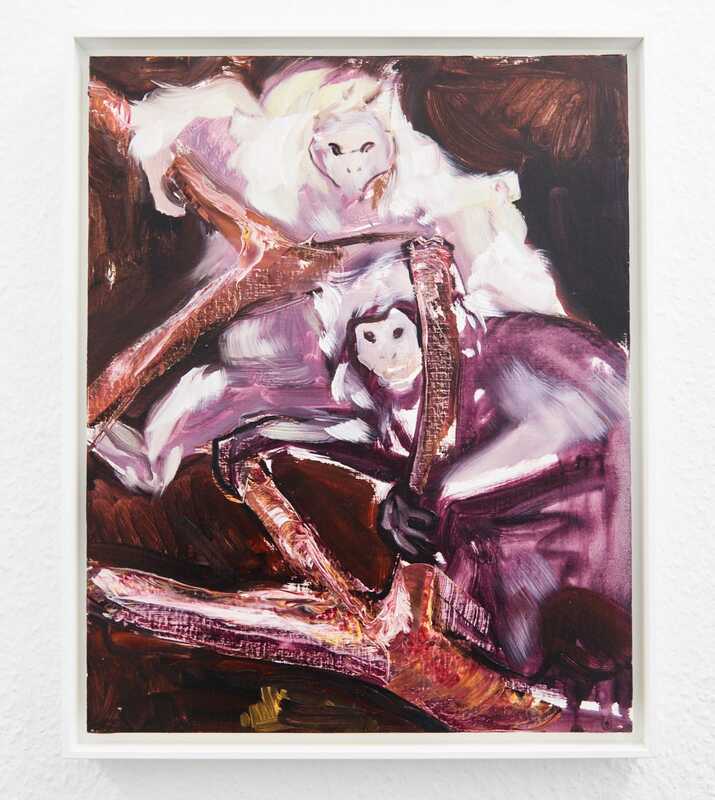 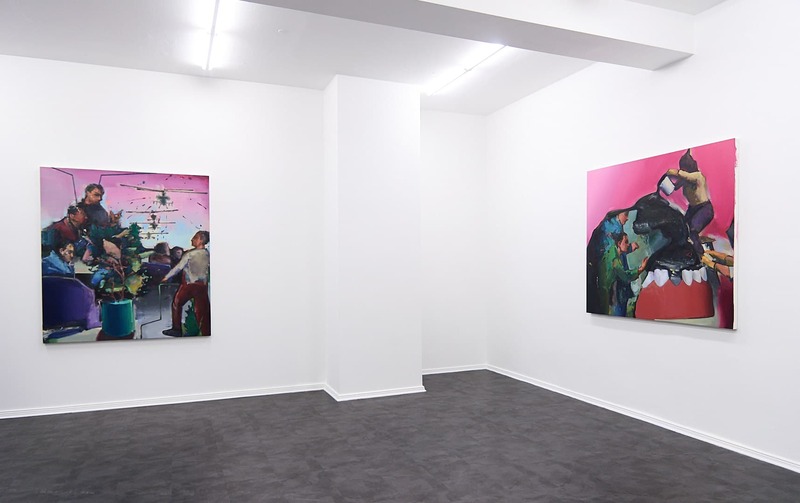 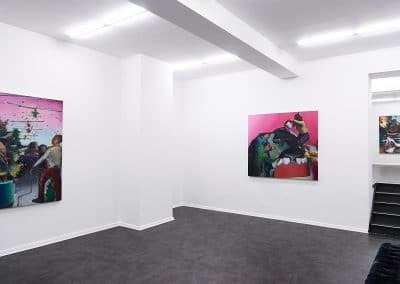 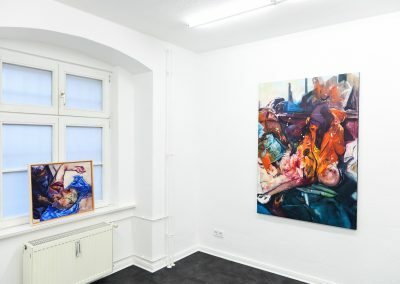 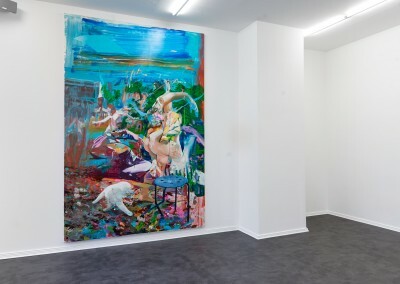 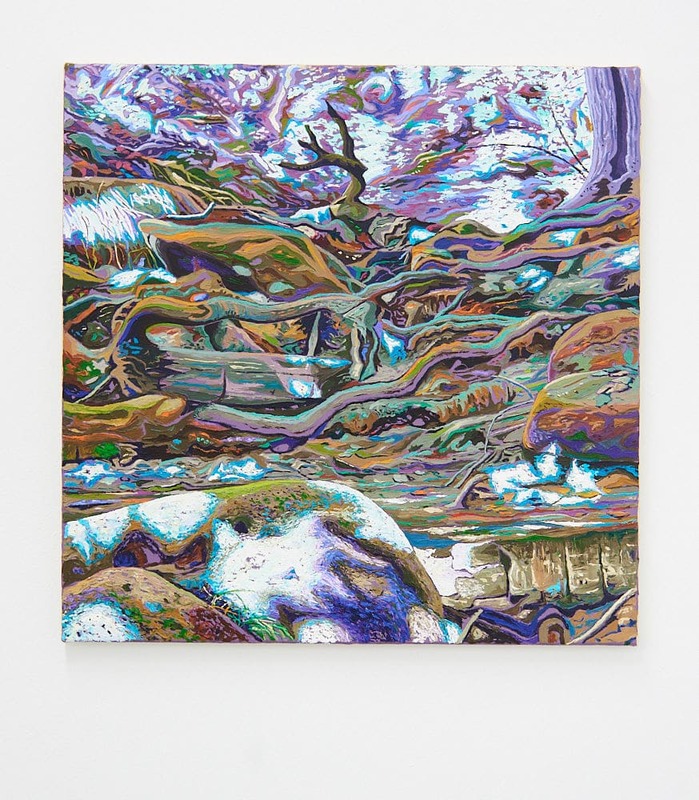 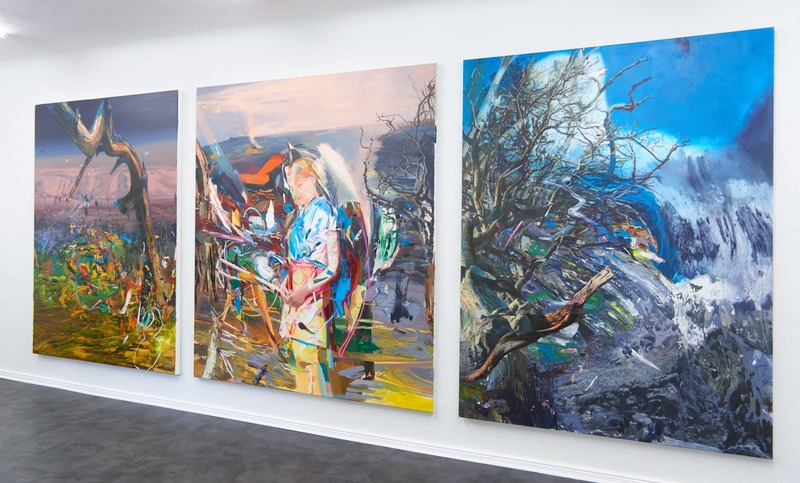 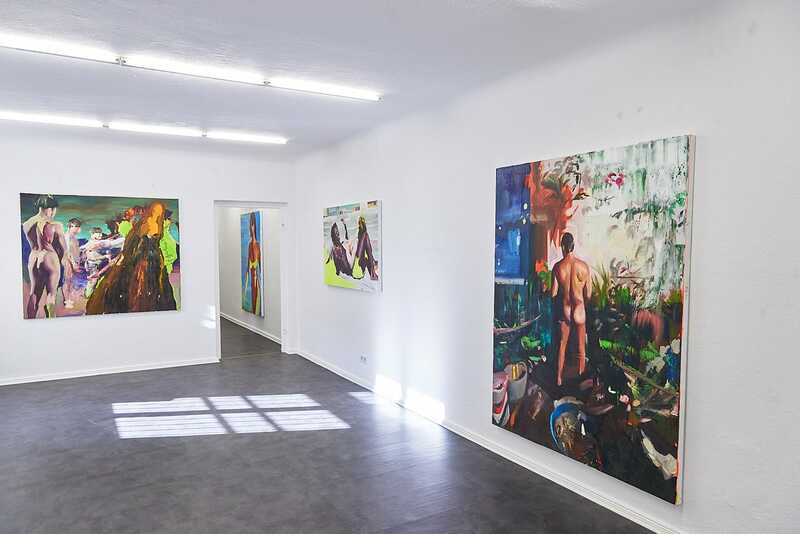 Magic Beans is pleased to present Winston Chmielinski’s first solo exhibition with the gallery. 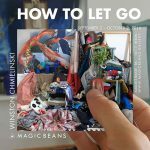 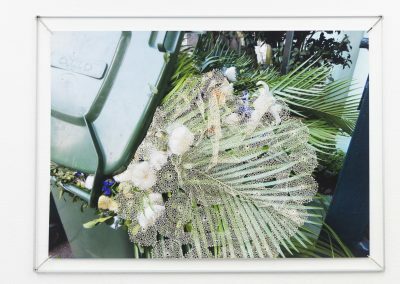 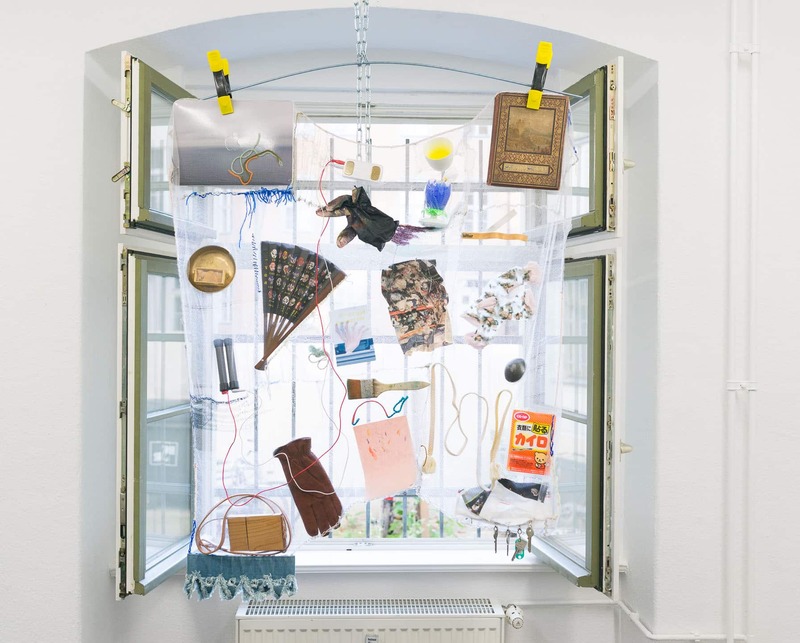 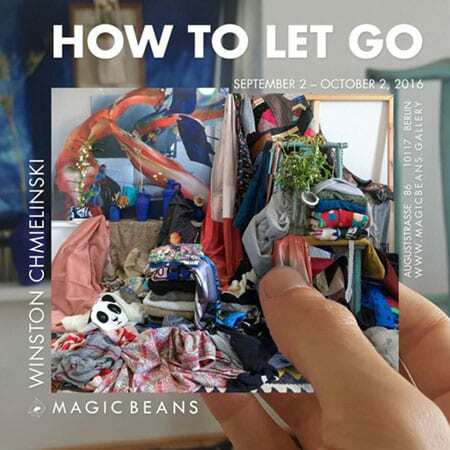 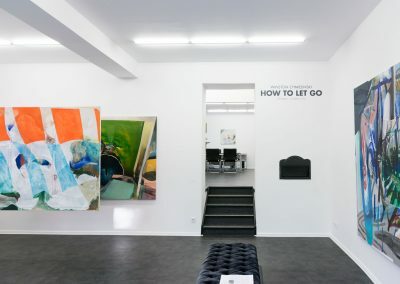 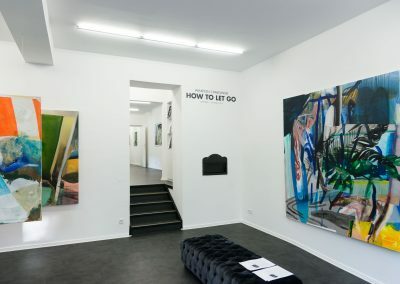 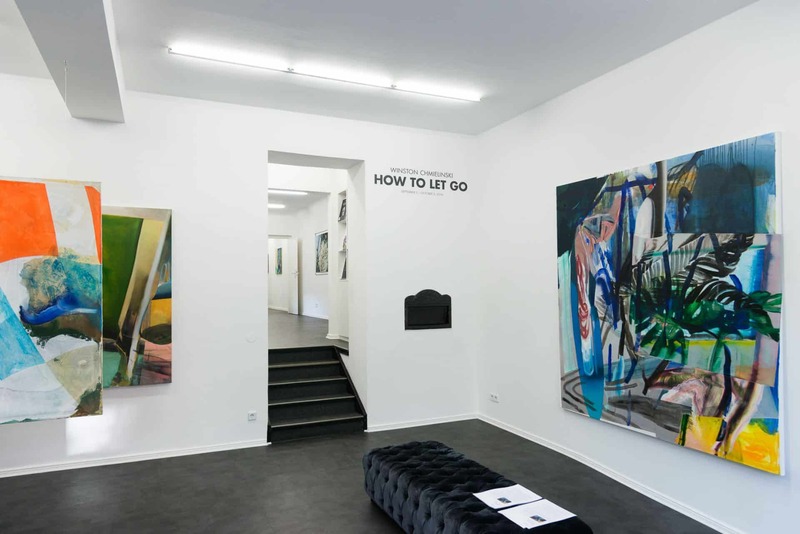 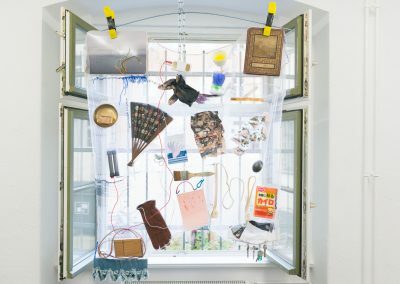 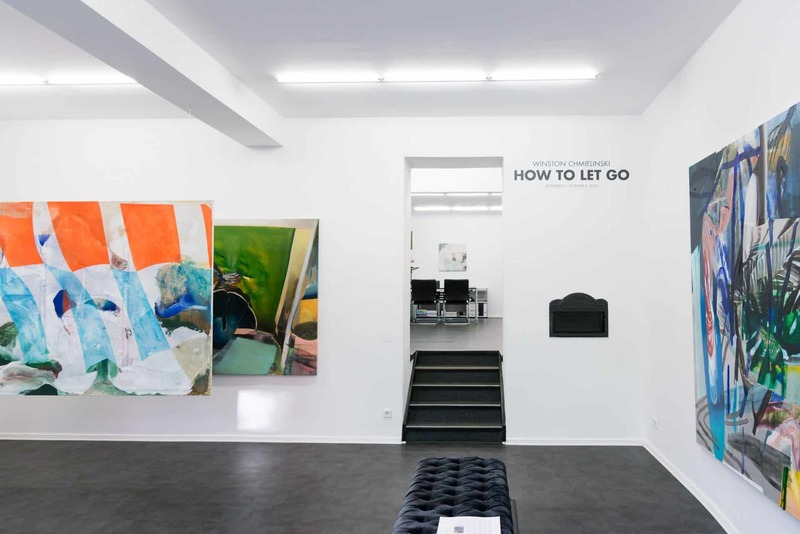 “How to Let Go” comprises paintings, objects, videos, and photographs, which borrow from each other in material, method, and modality. 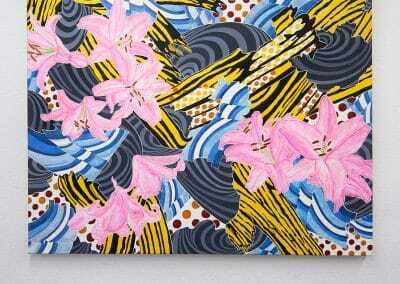 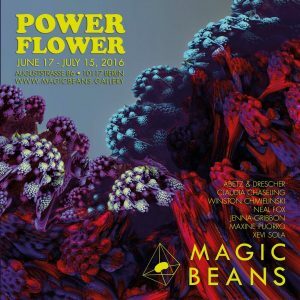 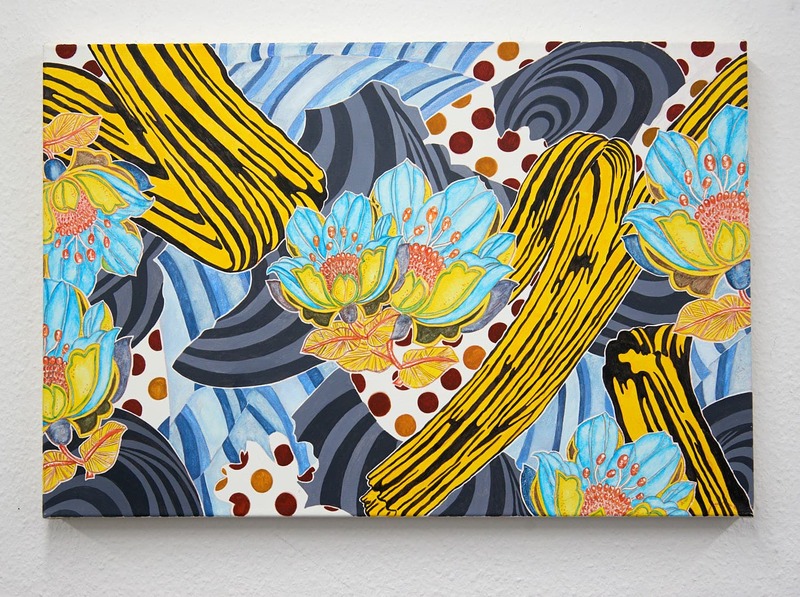 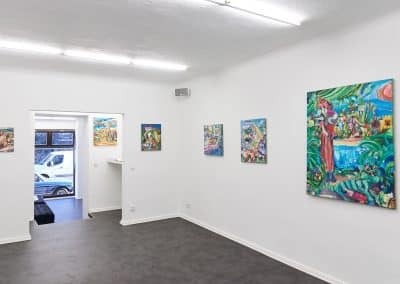 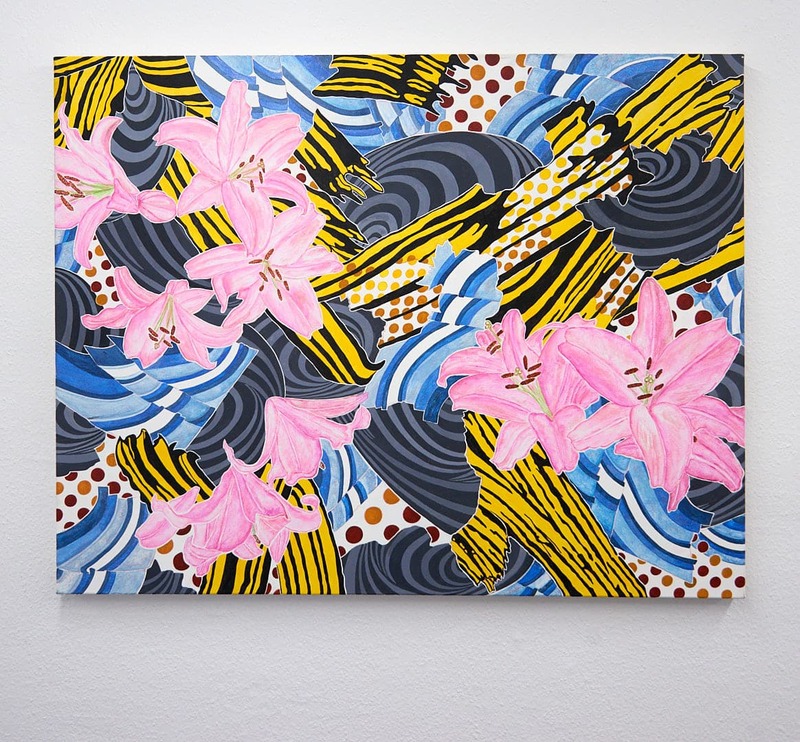 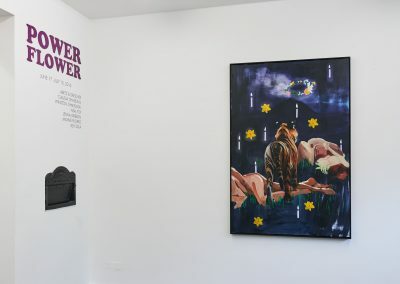 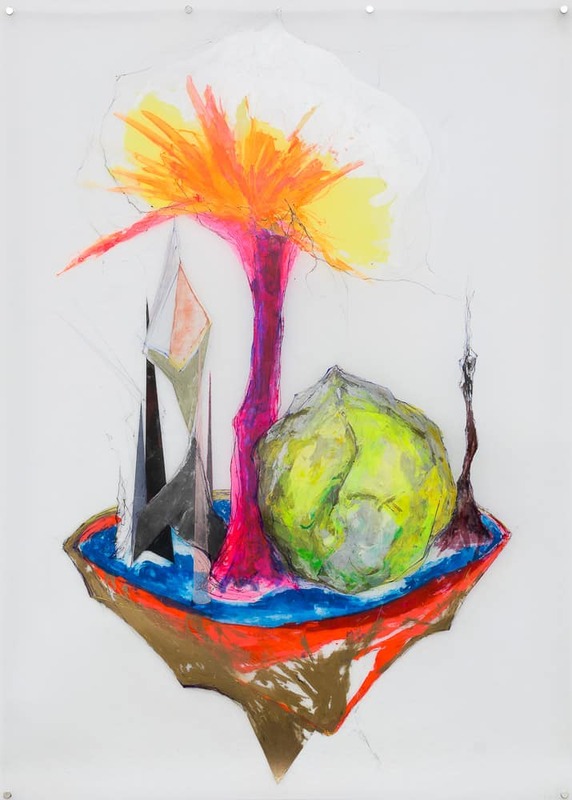 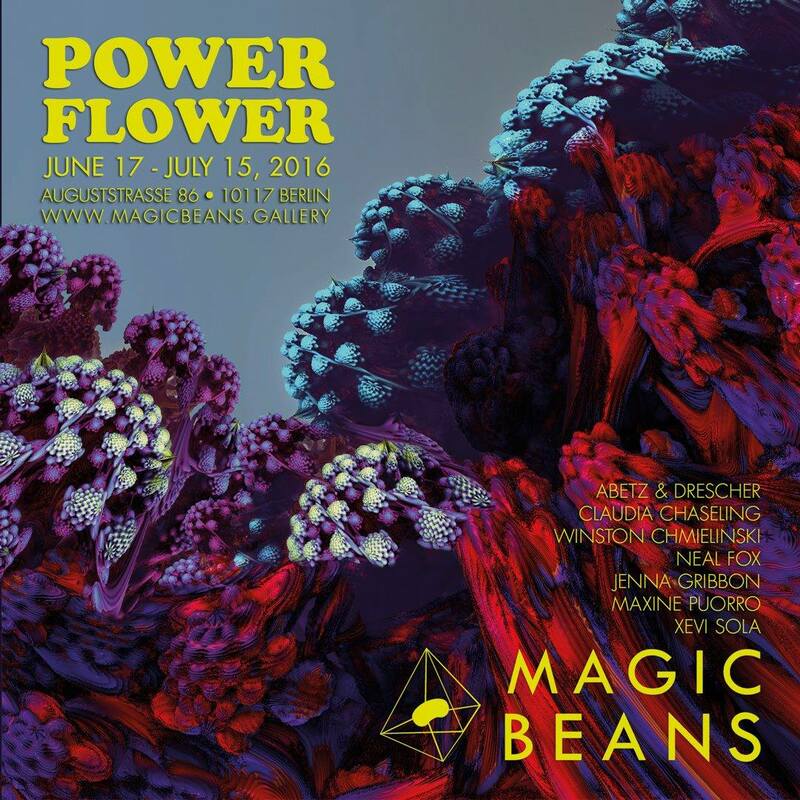 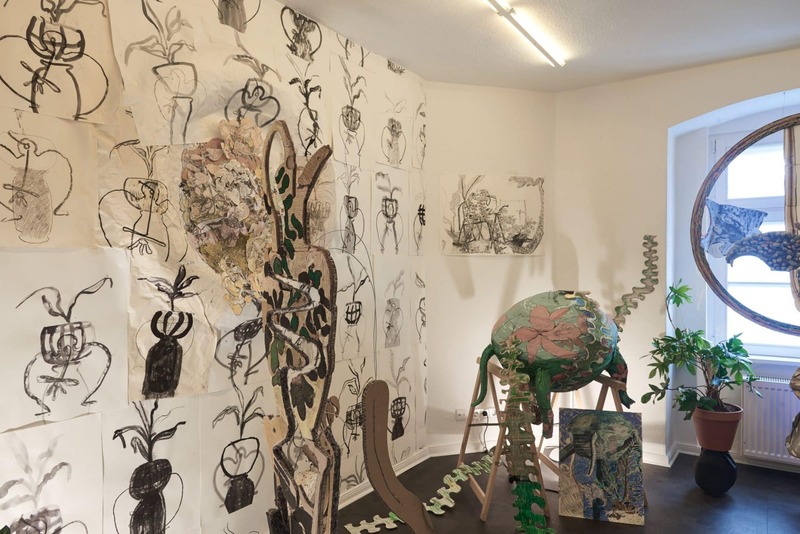 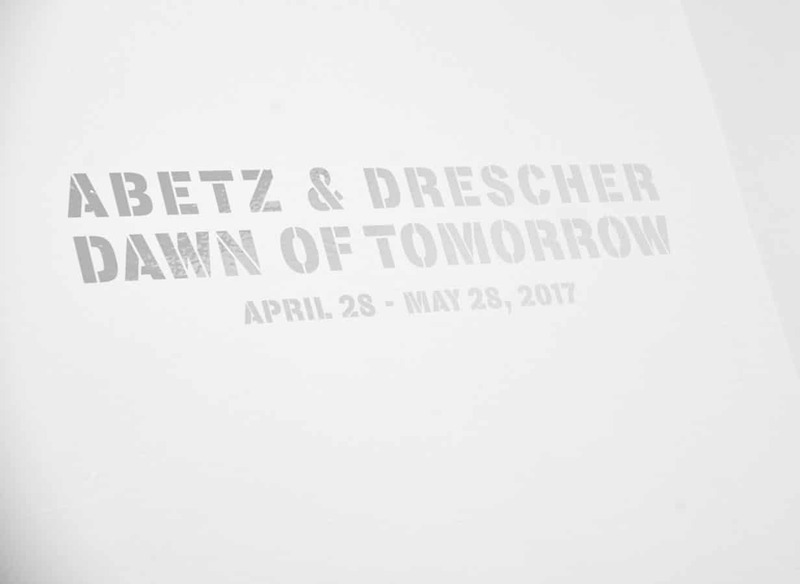 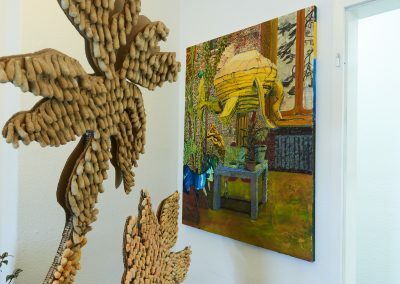 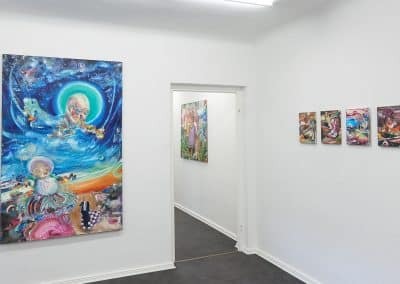 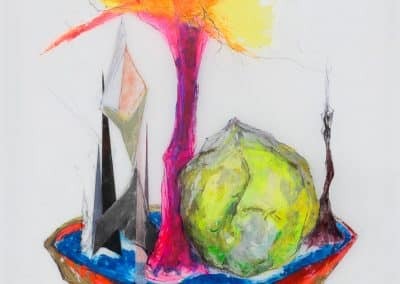 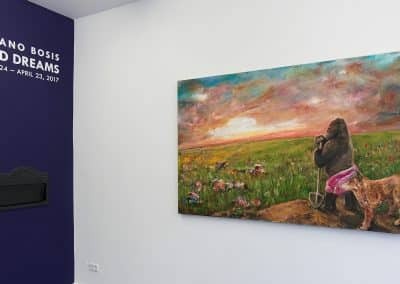 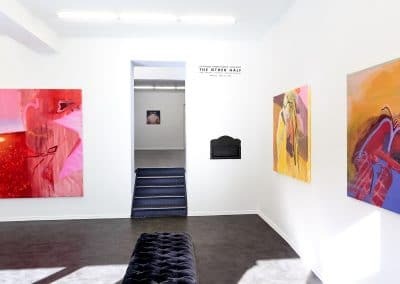 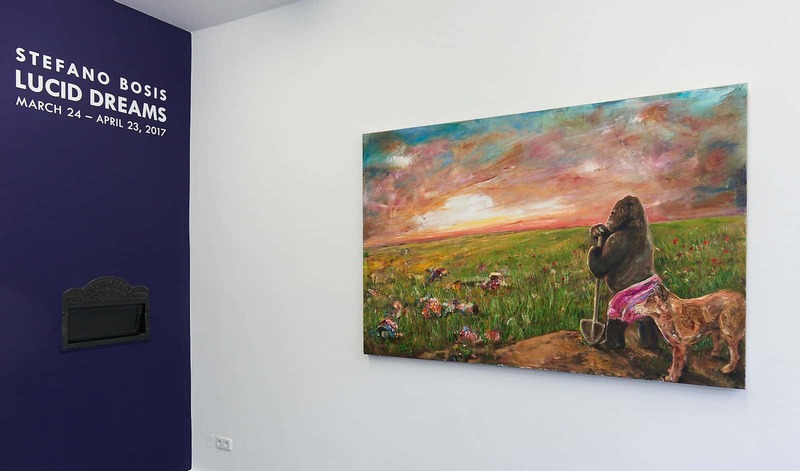 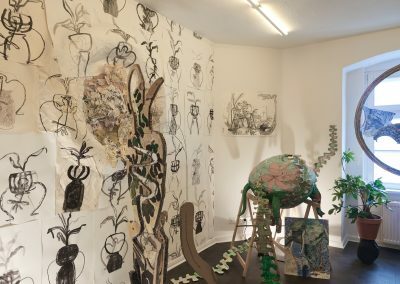 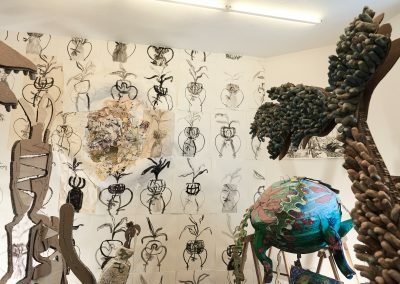 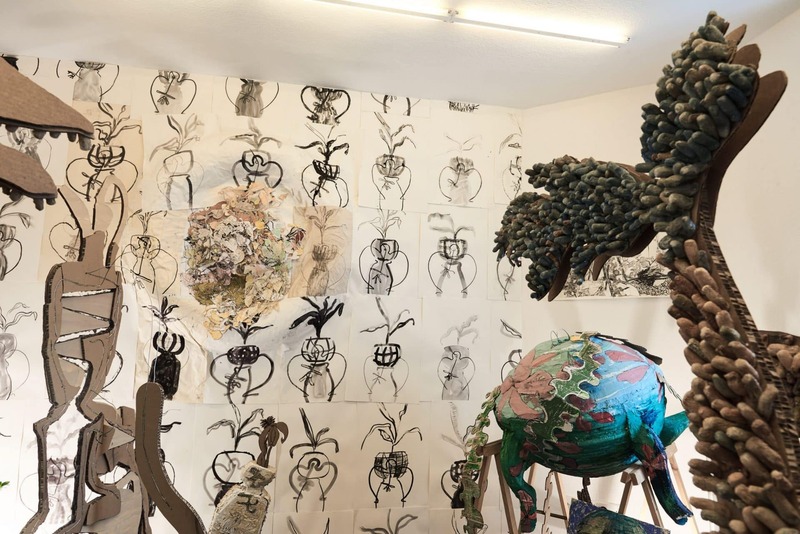 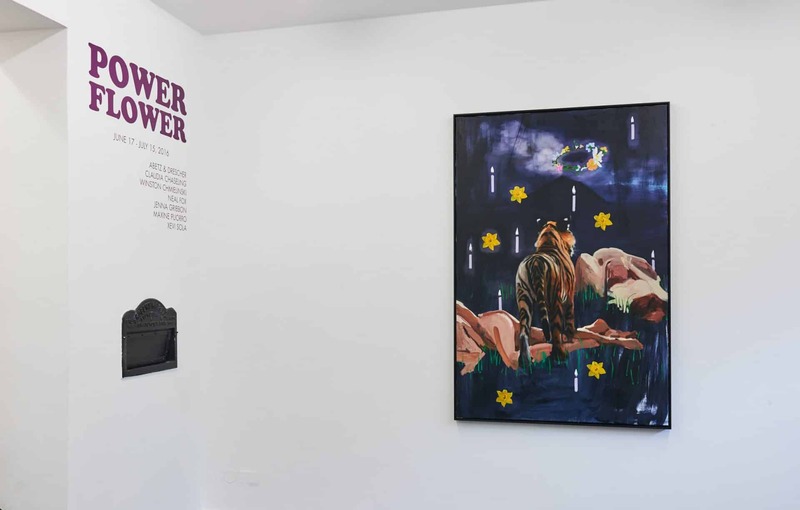 Magic Beans is pleased to present Power Flower, a group show featuring Abetz & Drescher, Claudia Chaseling, Winston Chmielinski, Neal Fox, Jenna Gribbon, Maxine Puorro, and Xevi Sola. 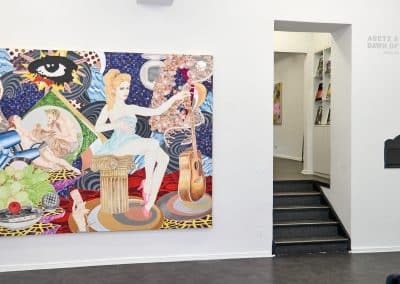 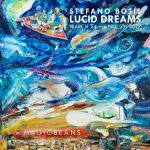 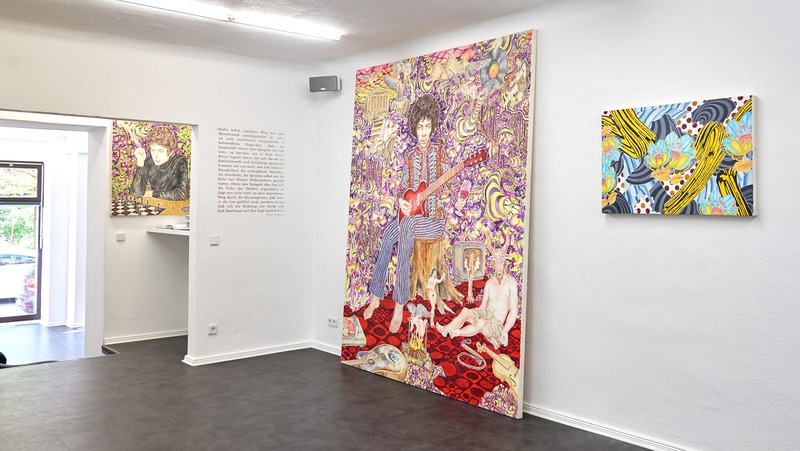 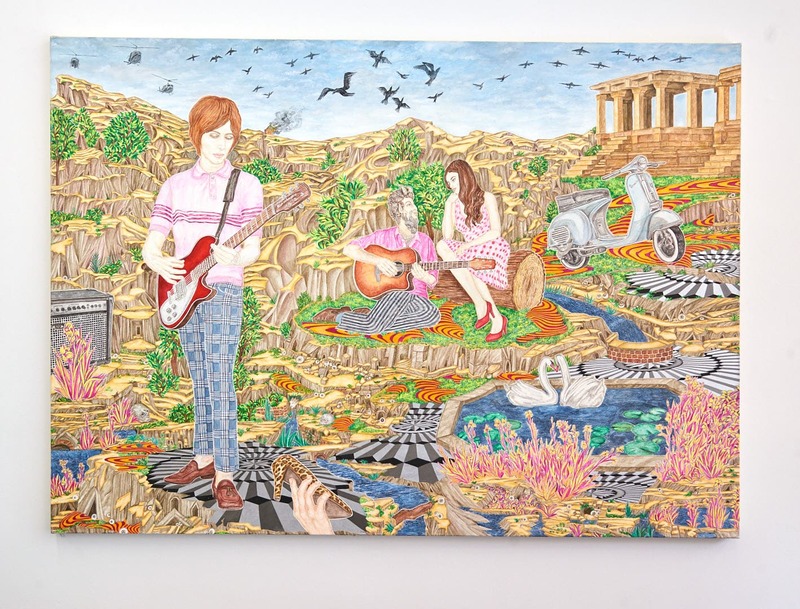 Composed of vivid drawings, paintings and sculptures, these seven artists’ works reflect the multitude of colors and sentiment that emanates from the psychedelic realm. 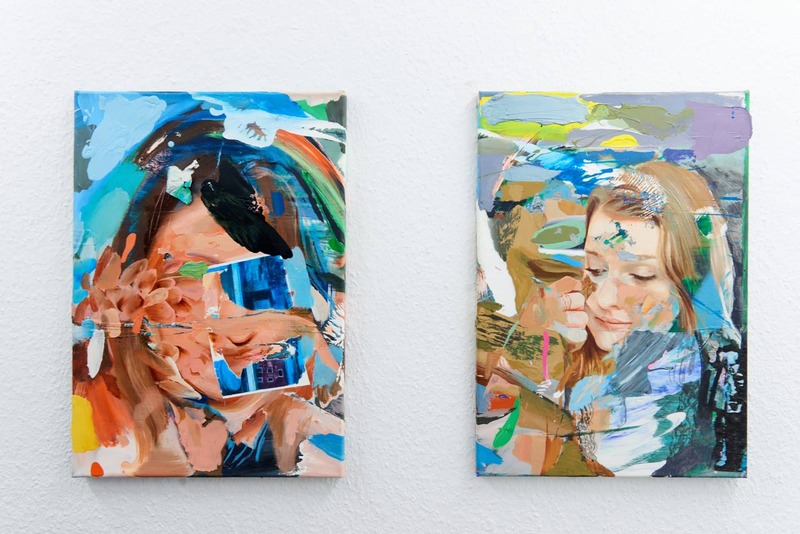 All of the artists question expectations of illusion and representation. 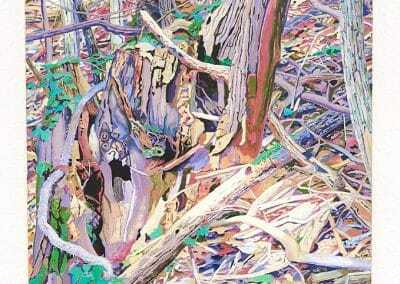 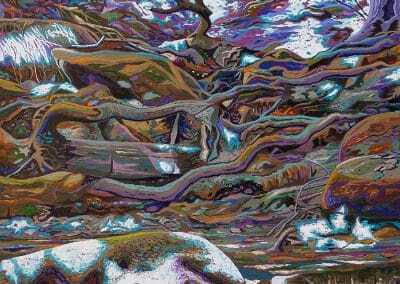 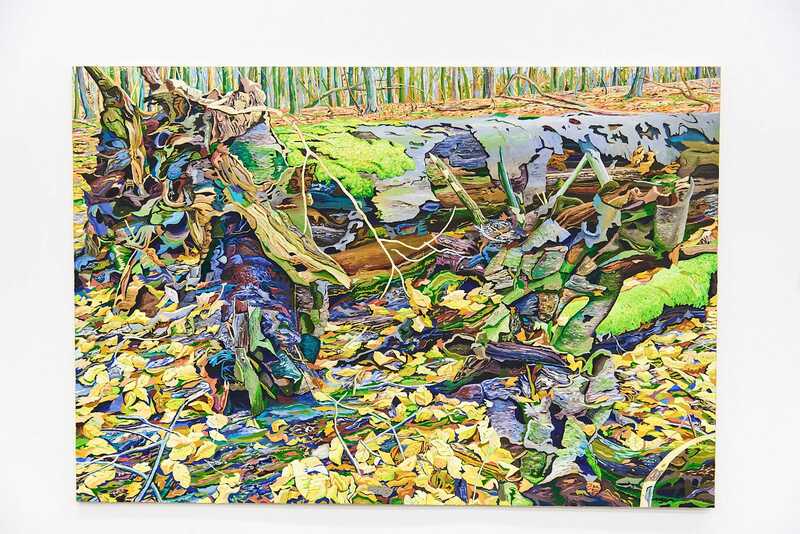 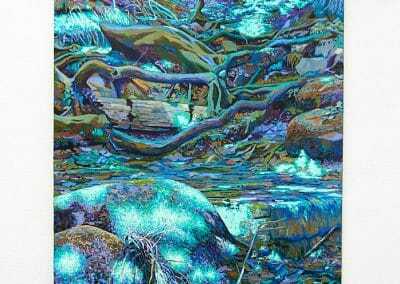 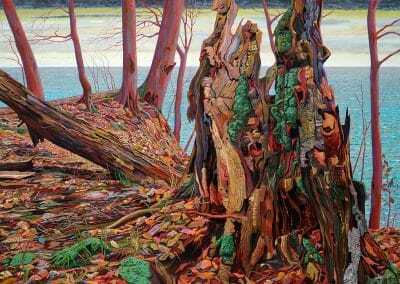 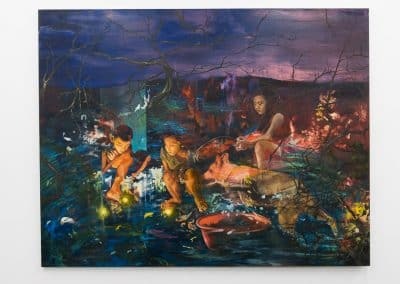 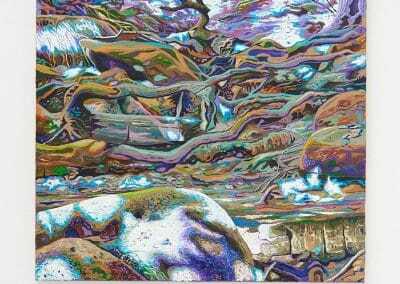 They use varying kinds of imagery appropriated from popular culture and abstract interpretations of nature, used as a symbolic vocabulary to express a mystical, ephemeral and kaleidoscopic viewpoint. 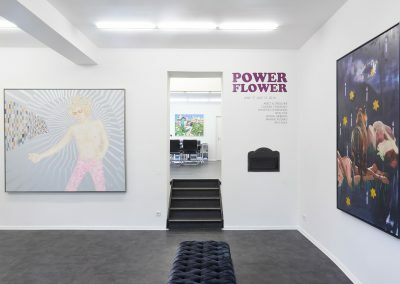 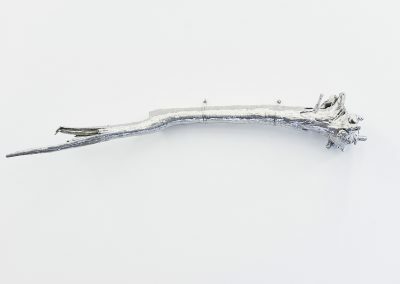 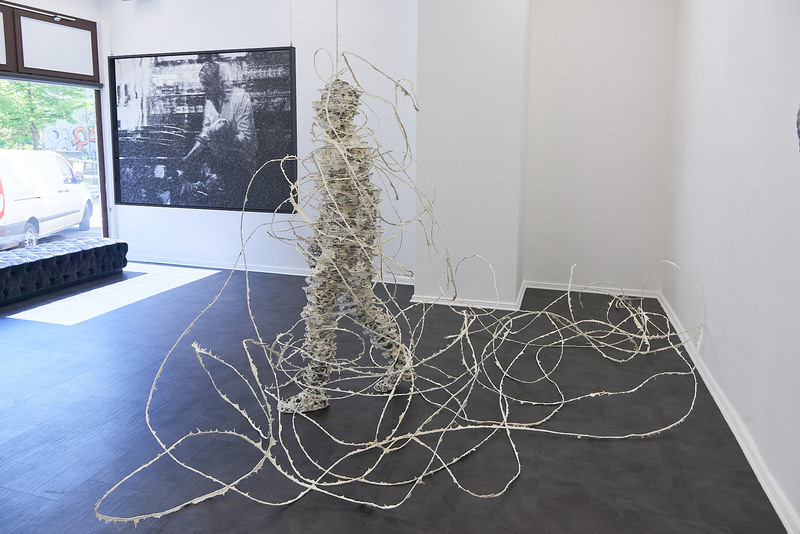 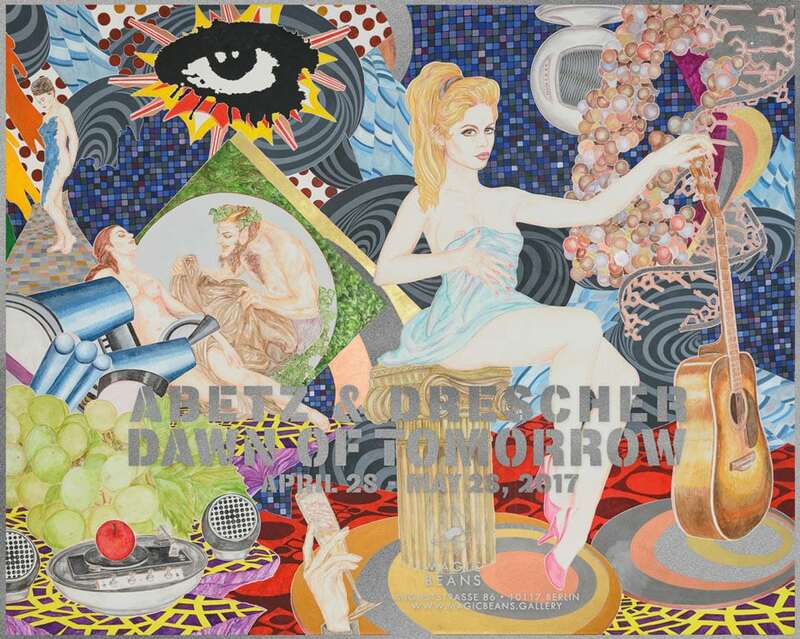 Taking its name from “Flower Power”, a slogan used in the 1960’s and 1970’s as a symbol of passive resistance, this exhibition reverses this term, subverting its meaning. 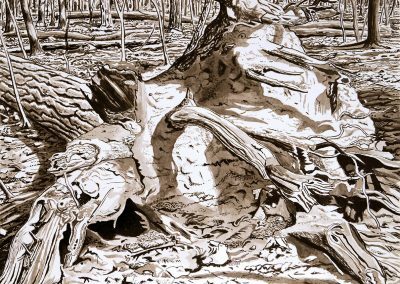 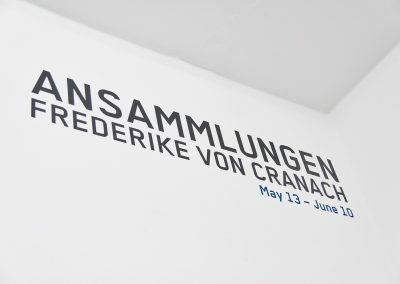 Magic Beans is pleased to present “Ansammlungen”, a solo exhibition by Frederike von Cranach from May 13 to June 10, 2016. 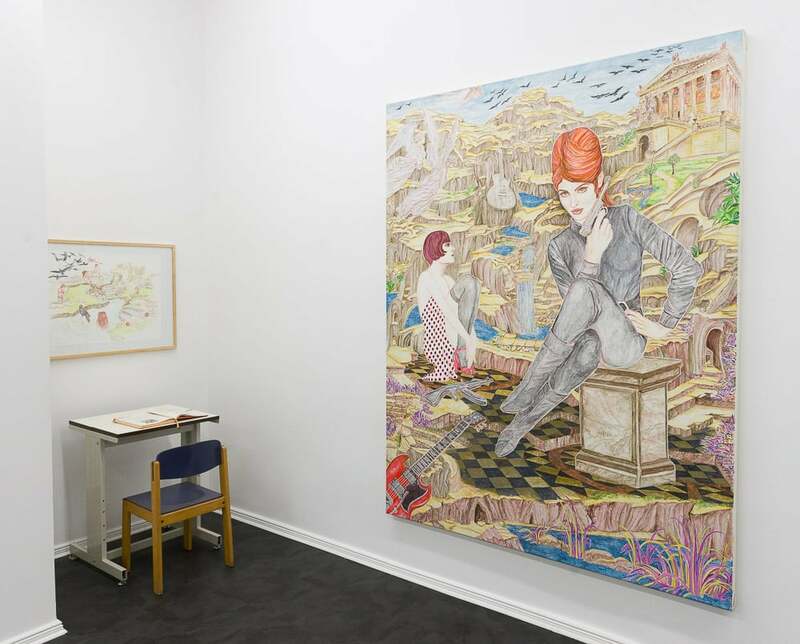 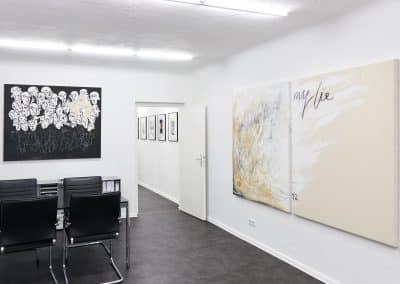 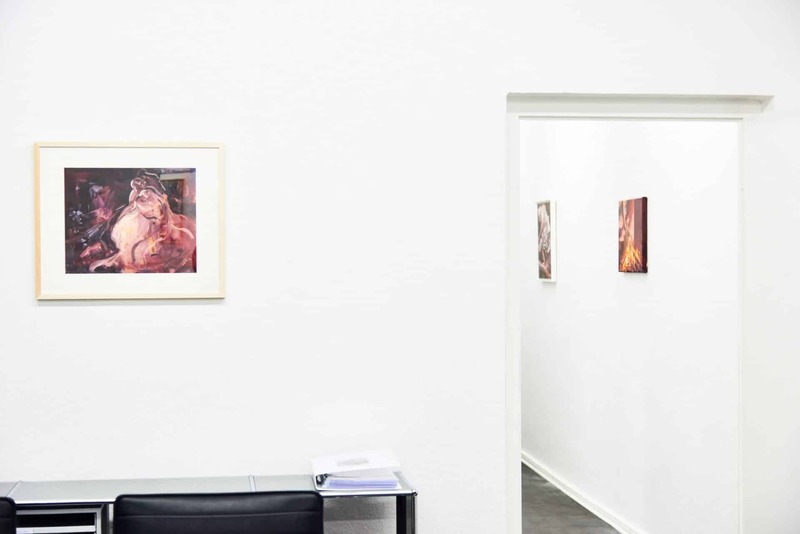 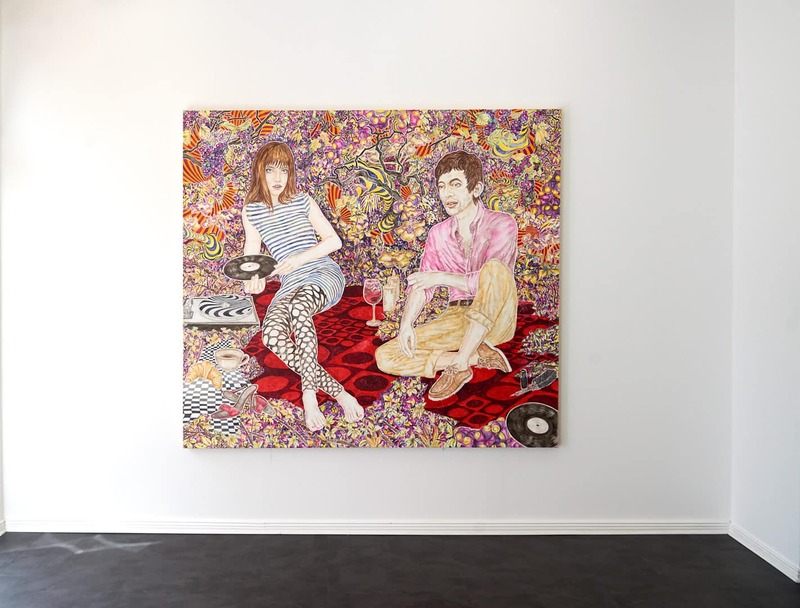 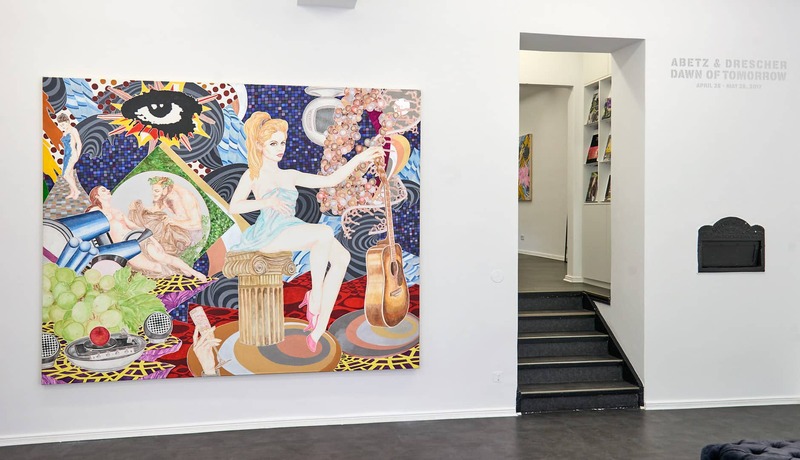 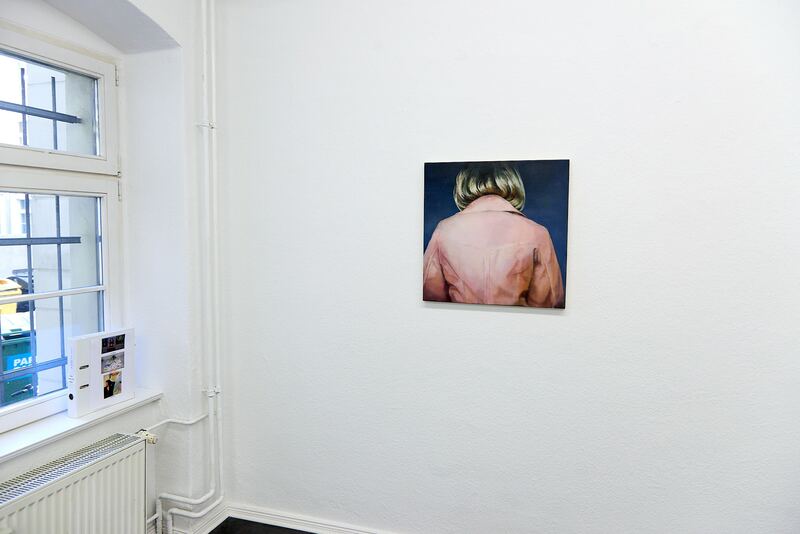 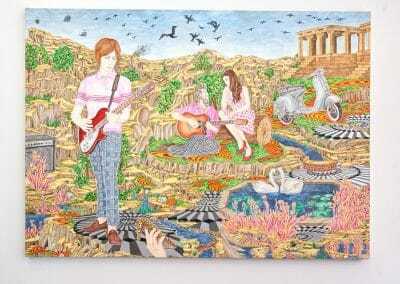 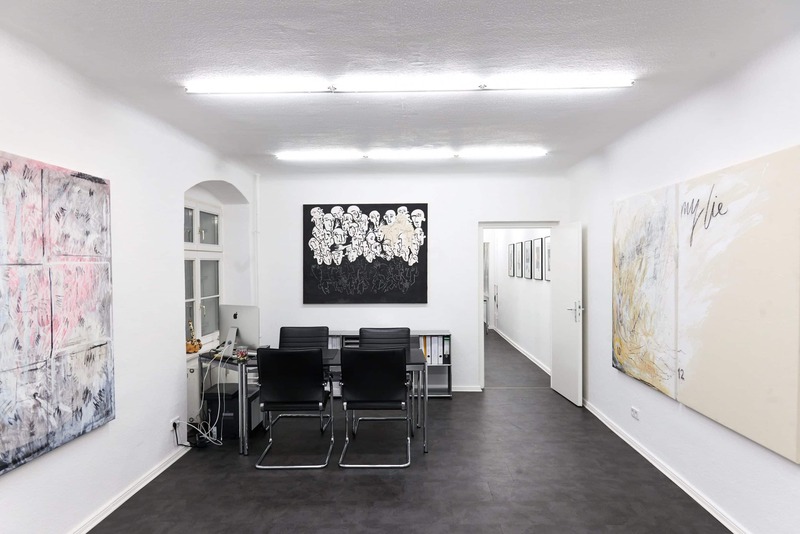 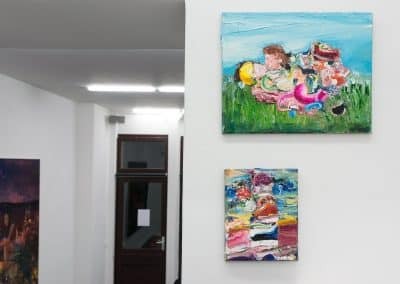 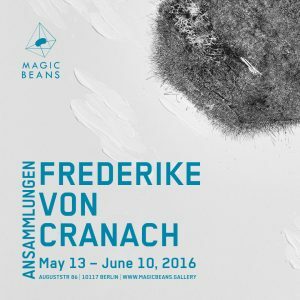 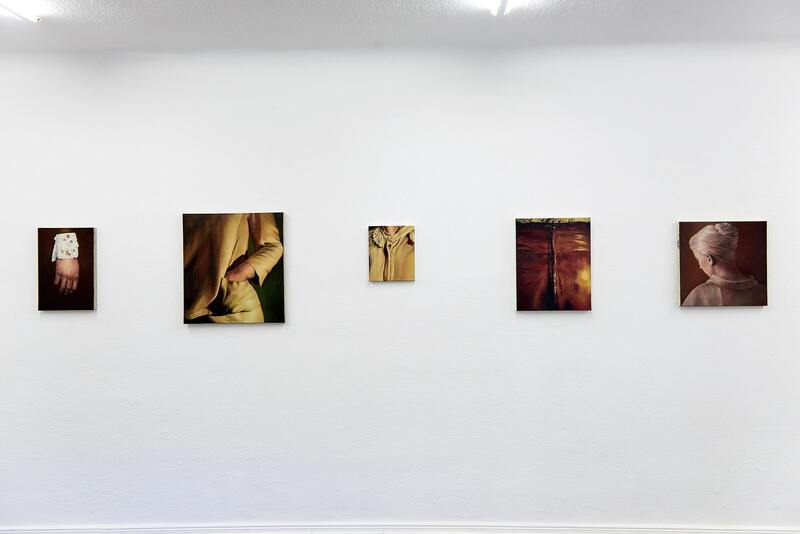 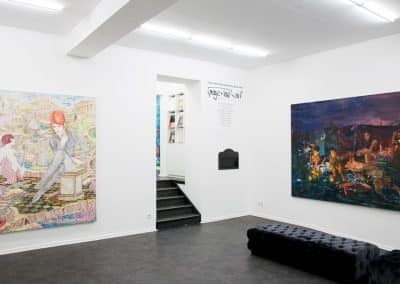 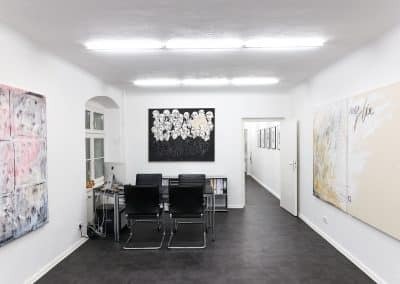 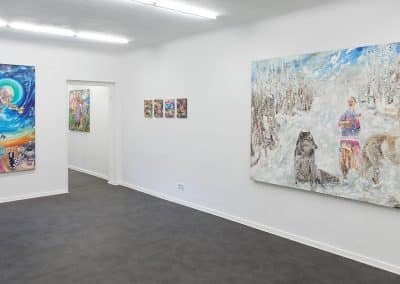 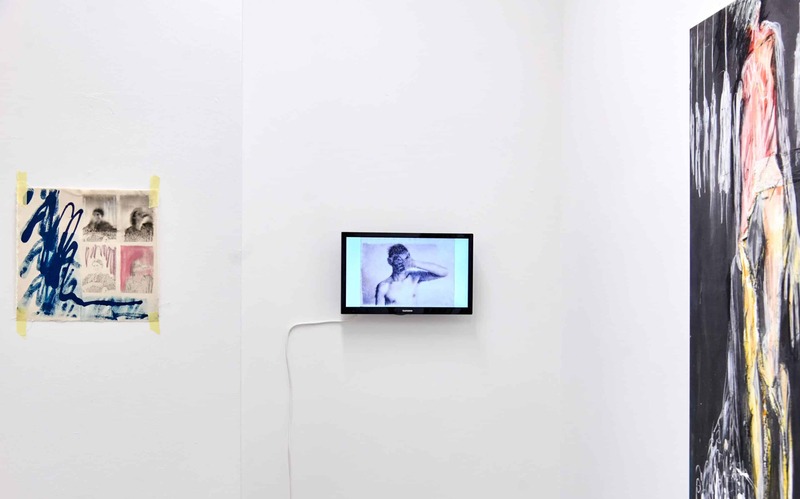 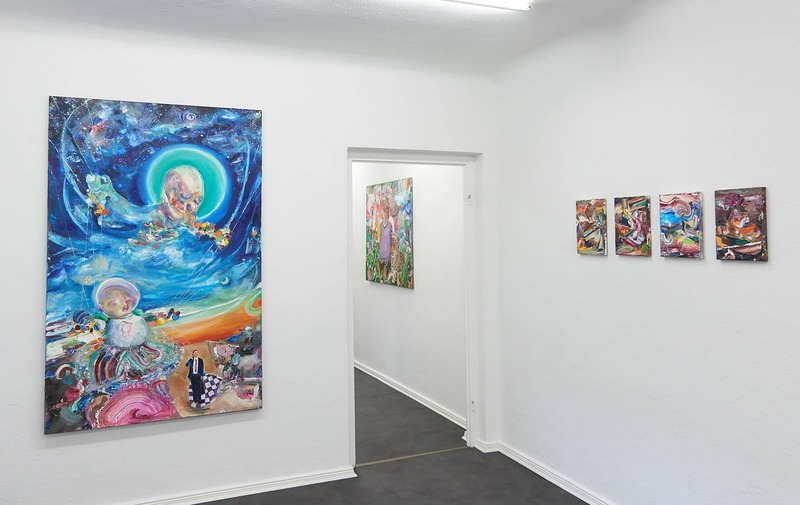 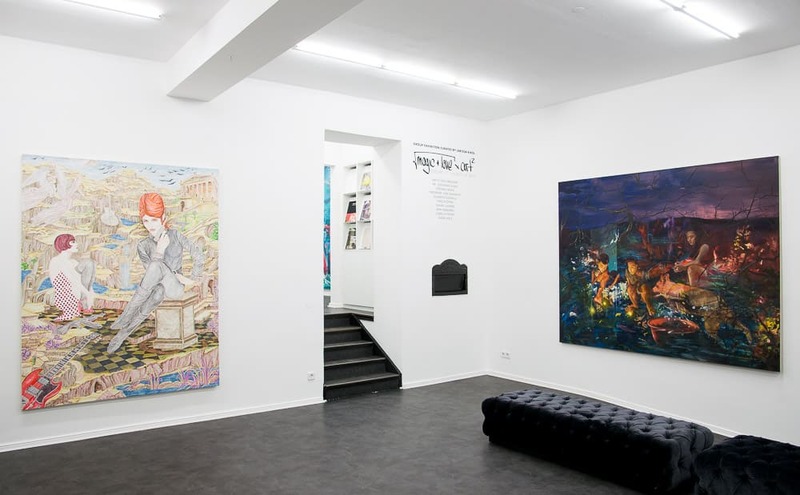 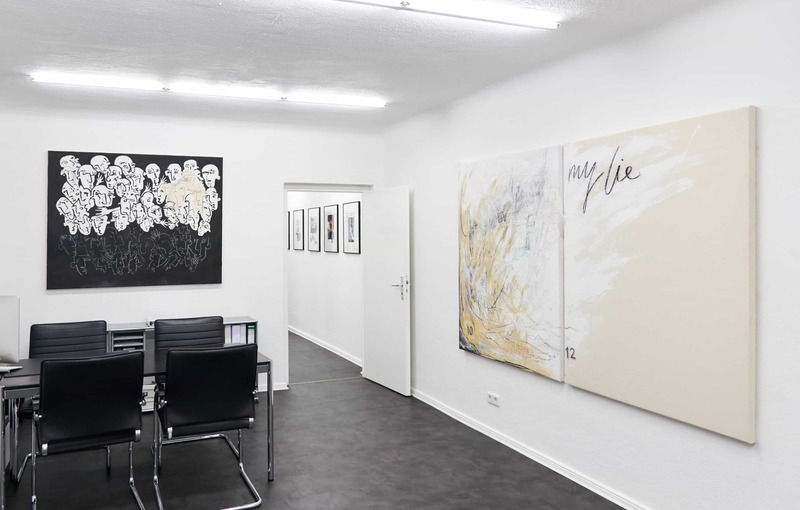 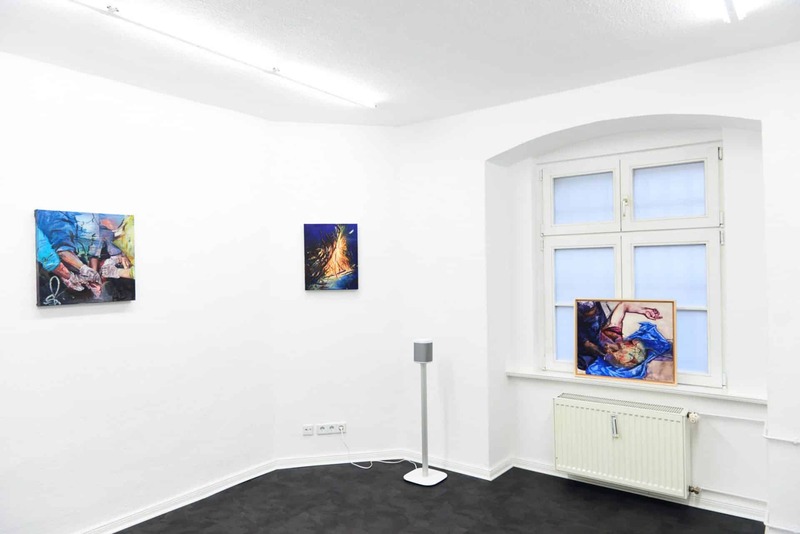 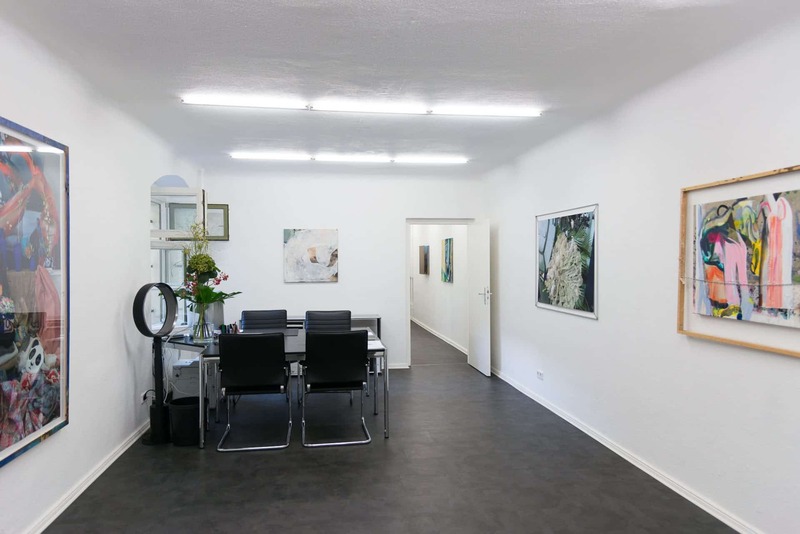 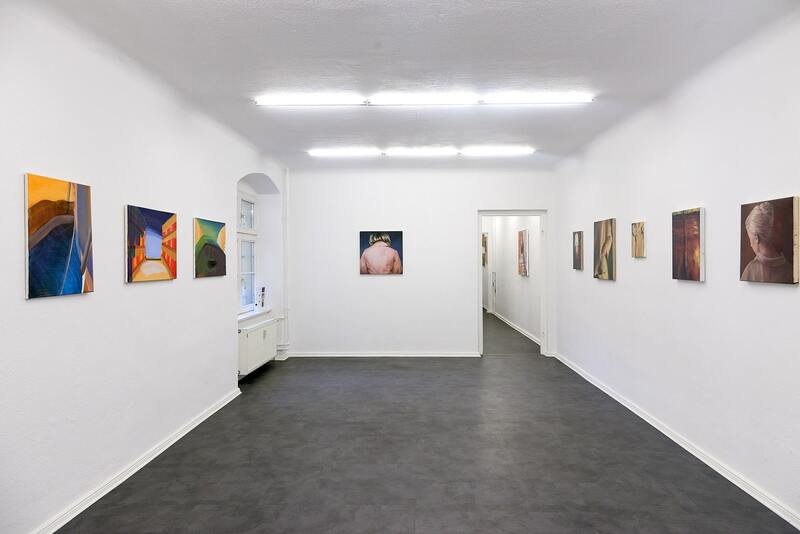 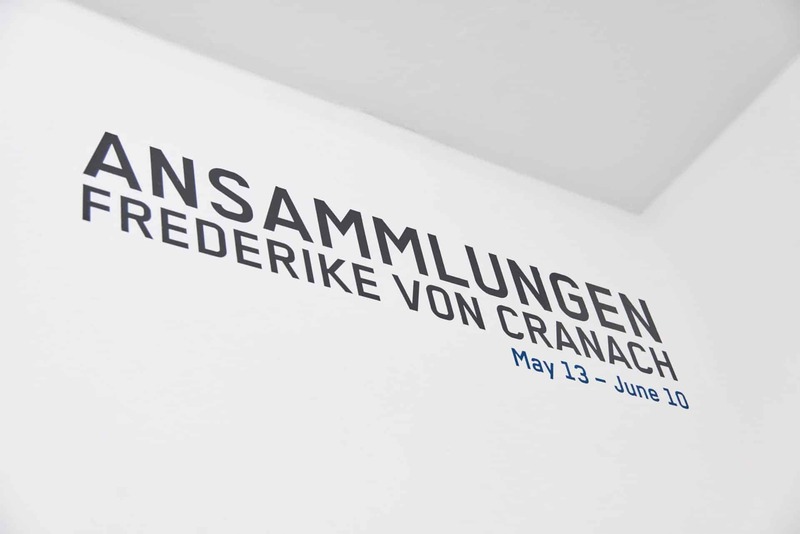 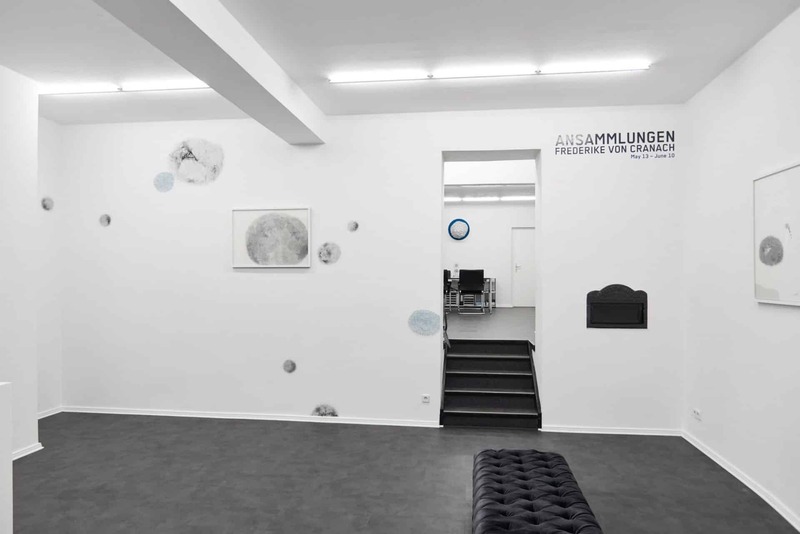 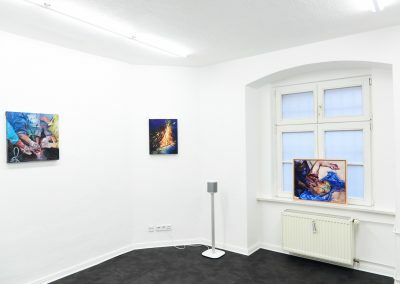 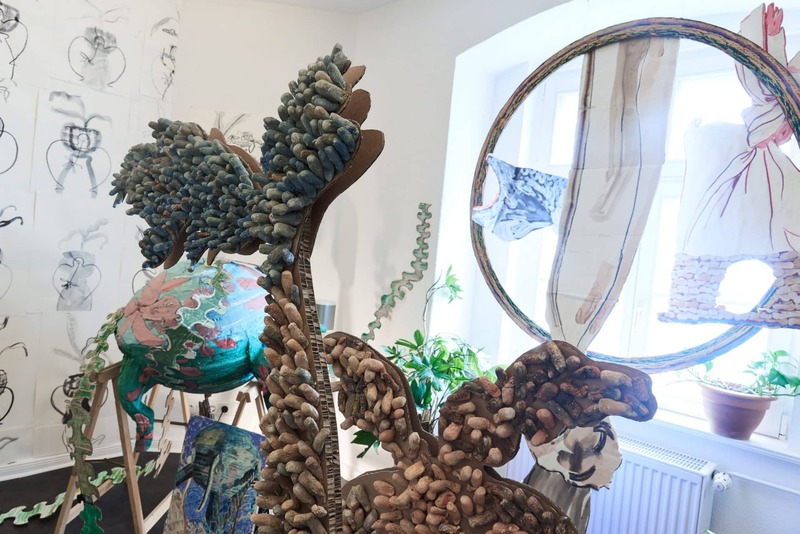 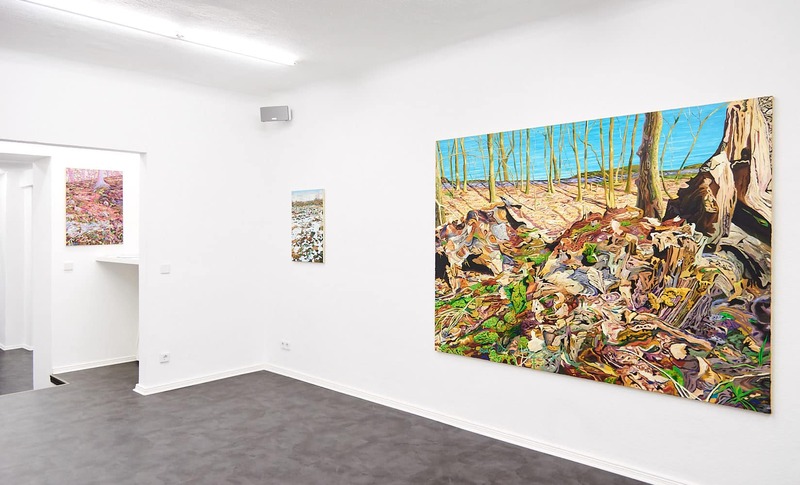 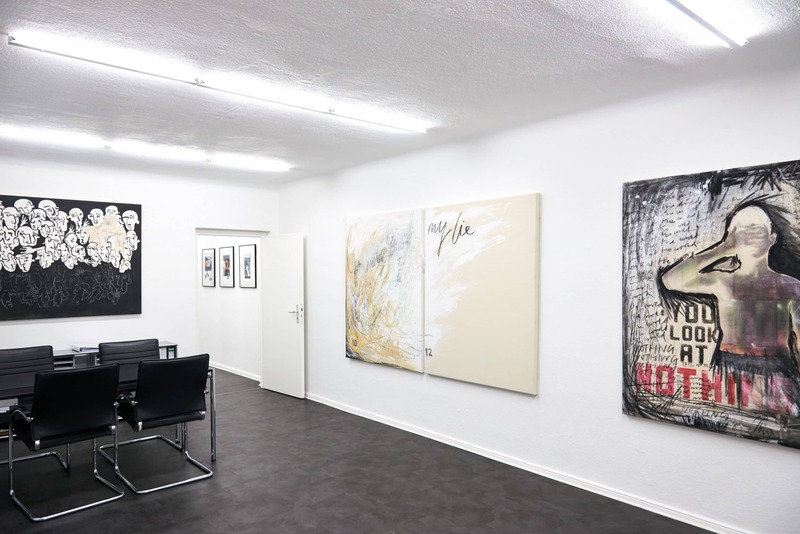 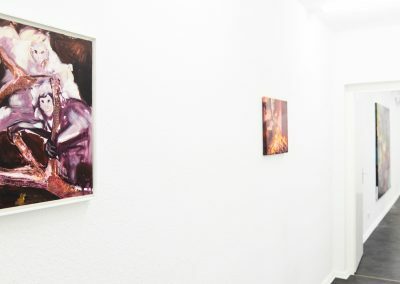 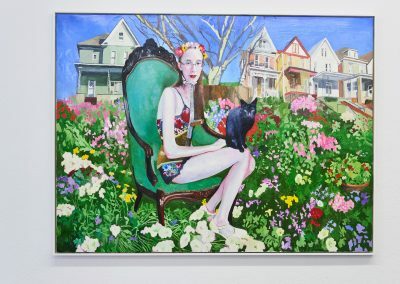 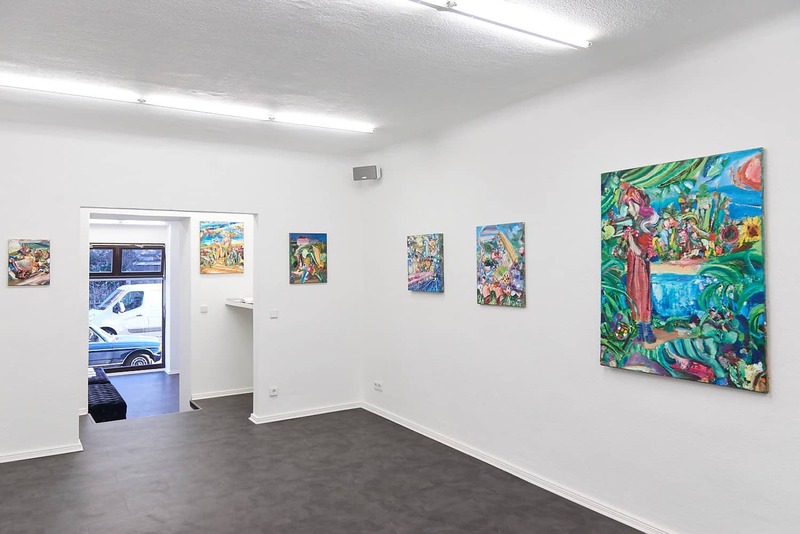 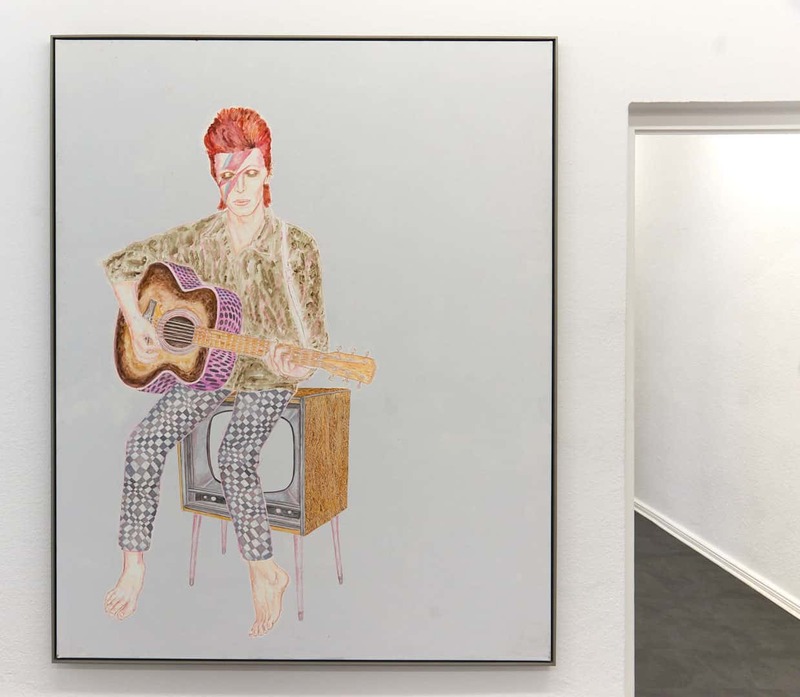 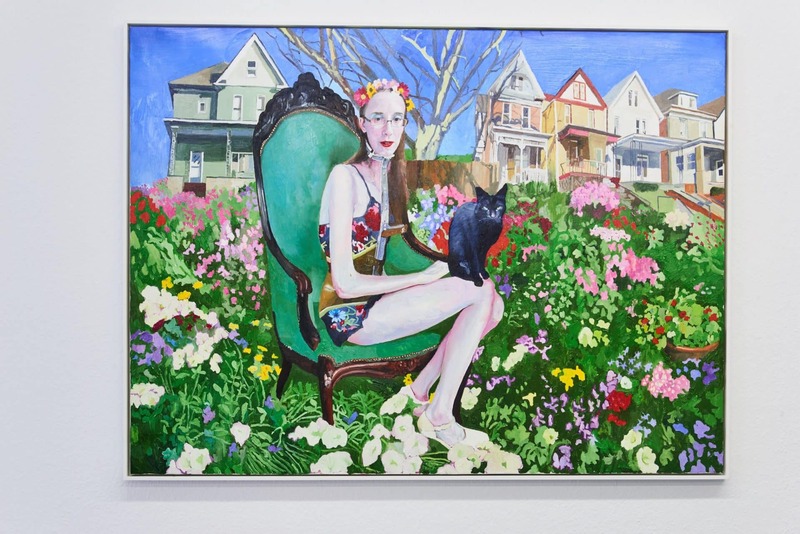 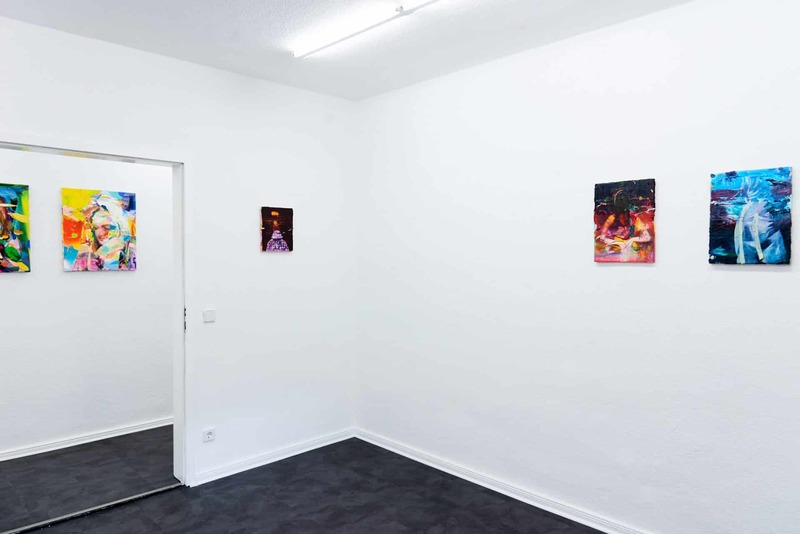 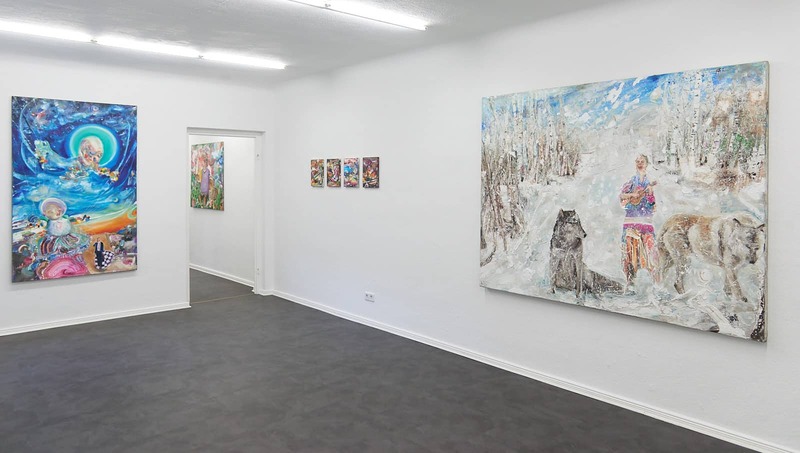 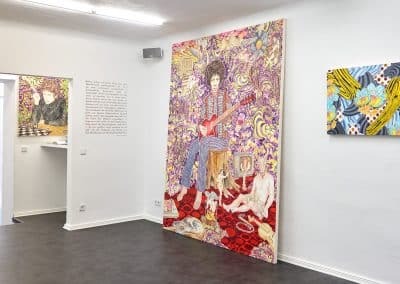 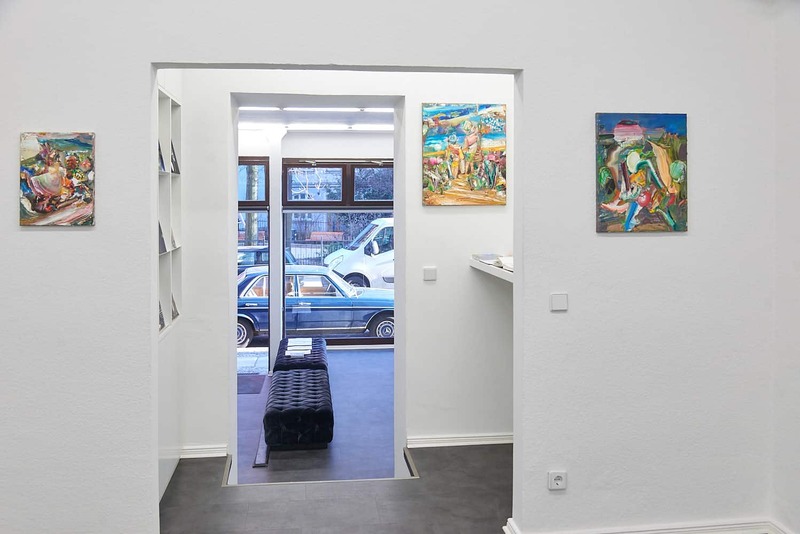 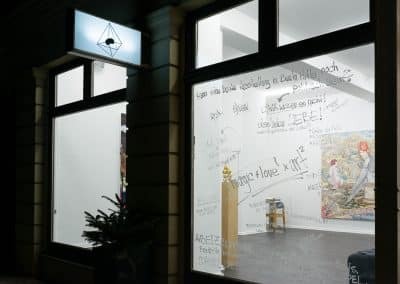 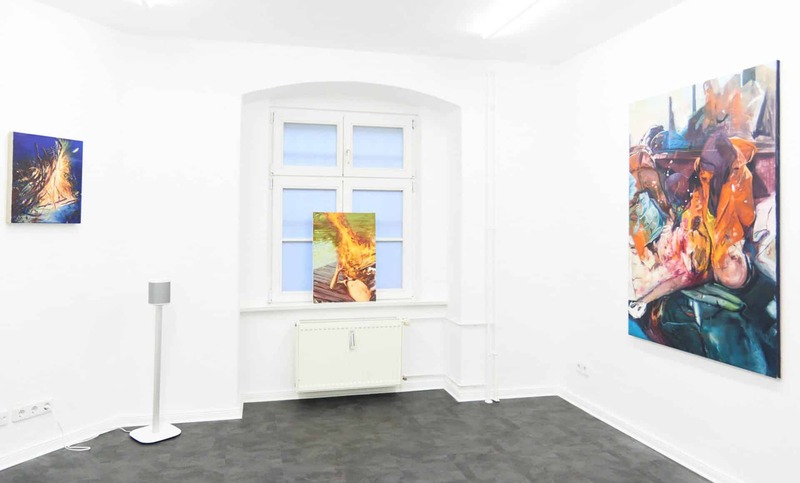 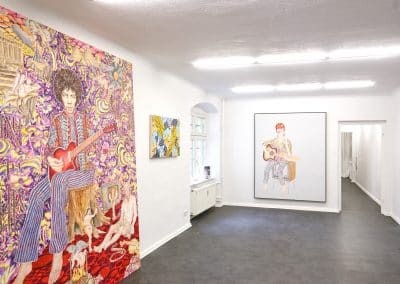 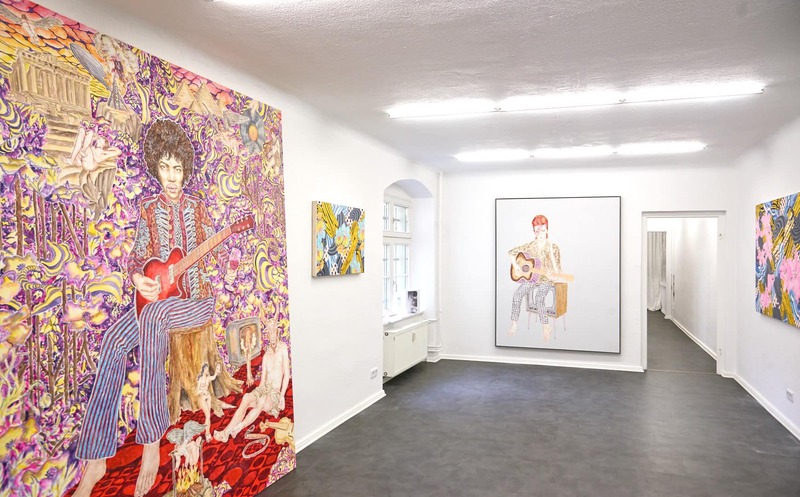 “Ansammlungen” is Frederike von Cranach’s first solo exhibition at Magic Beans. 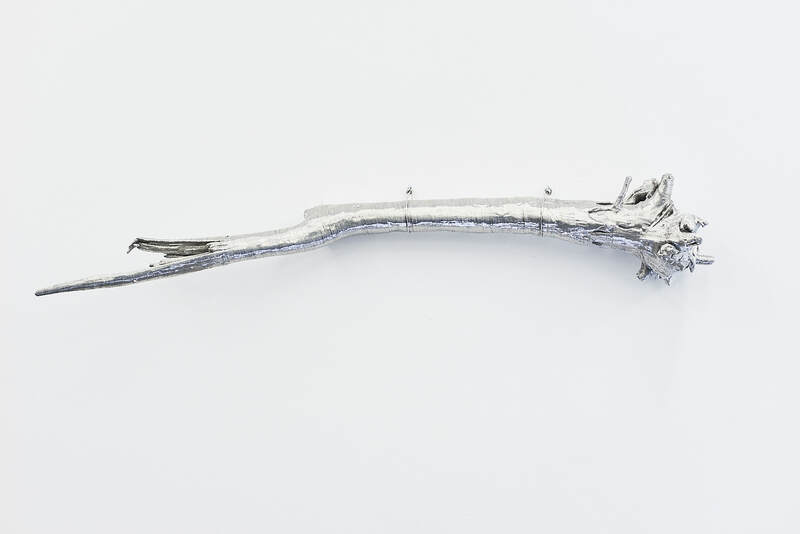 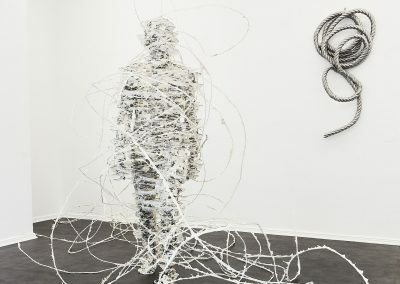 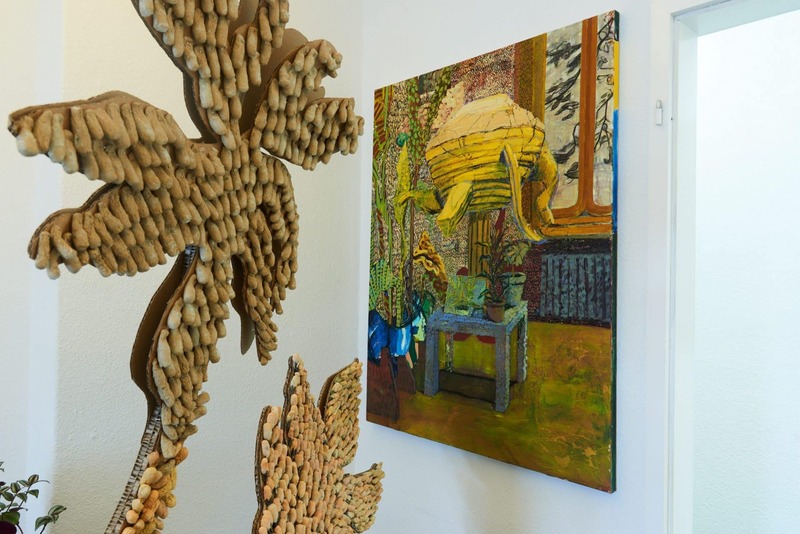 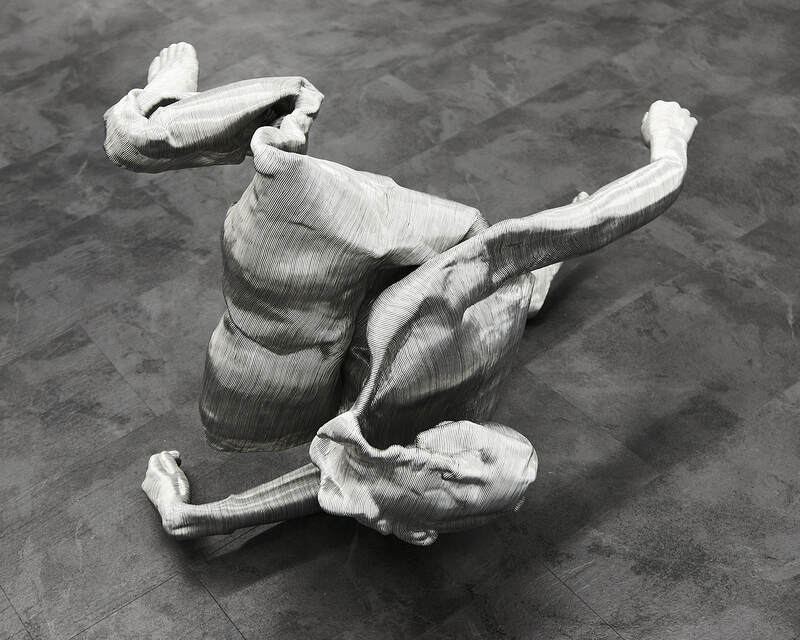 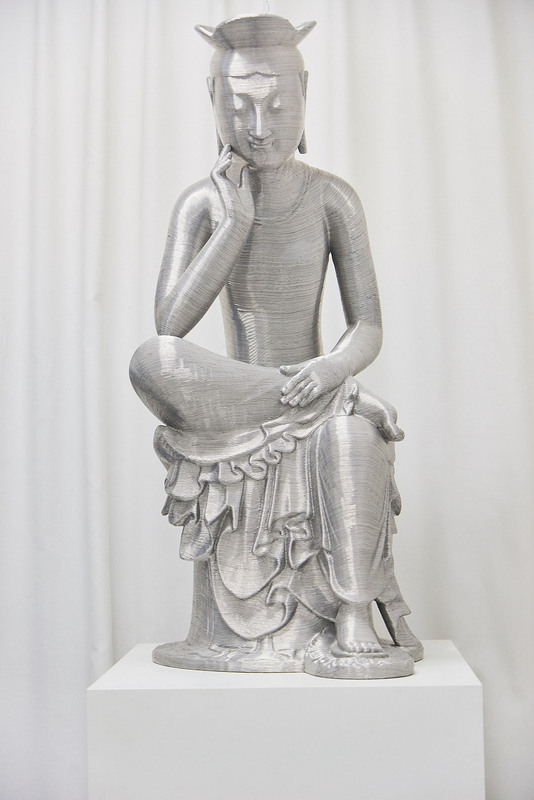 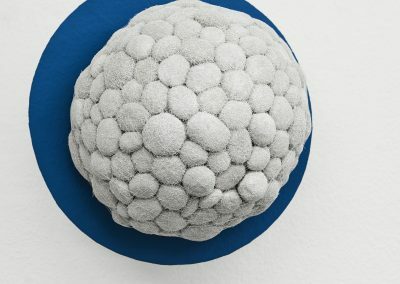 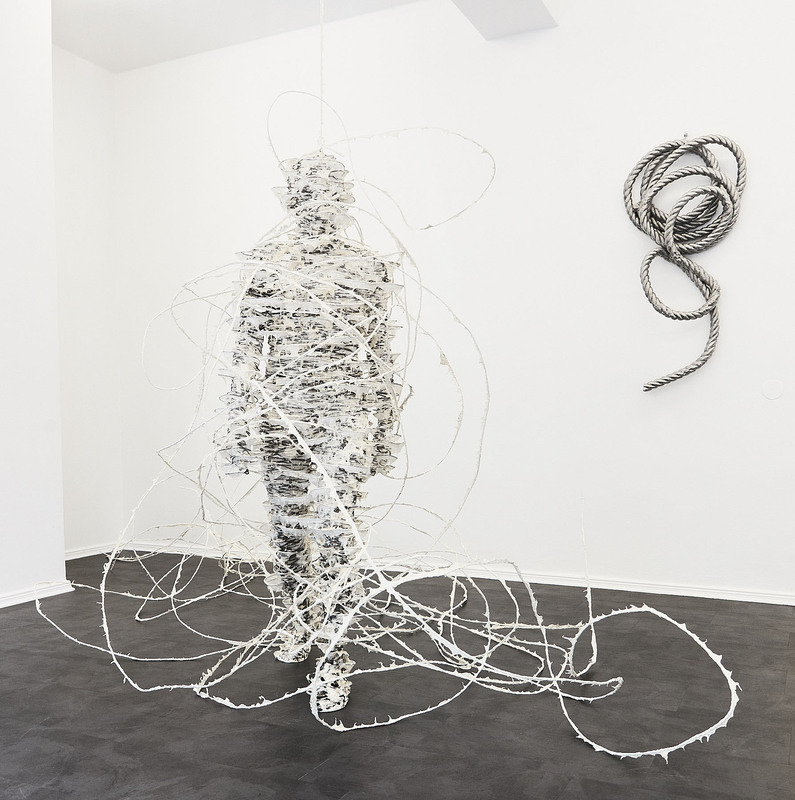 This exhibition will feature new sculptures, works on paper and mixed media collages. 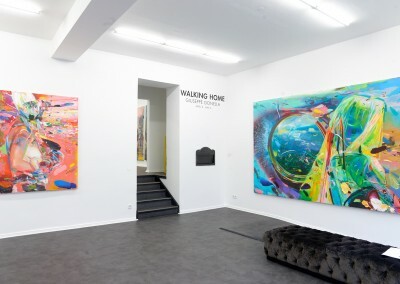 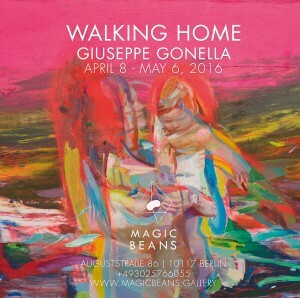 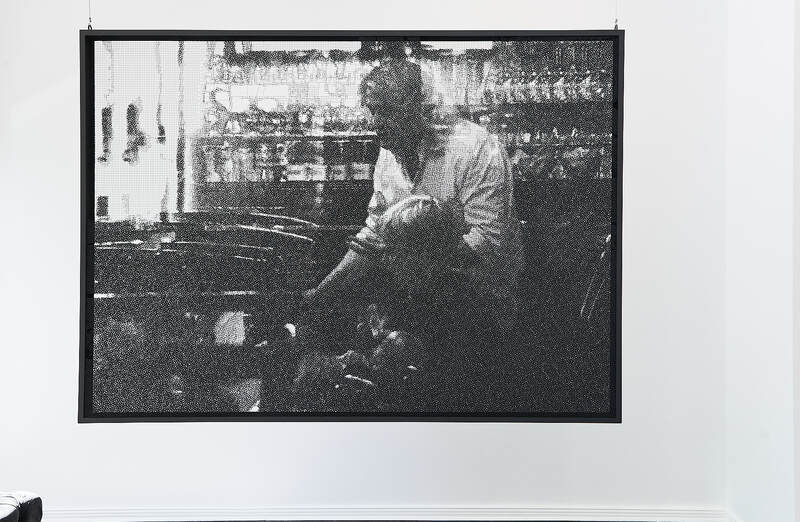 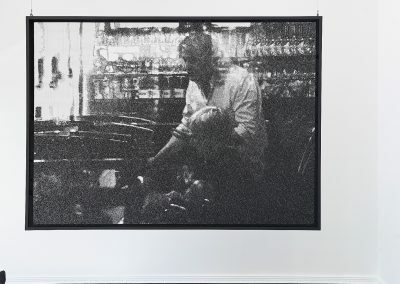 Magic Beans is pleased to present Giuseppe Gonella: Walking Home, the artist’s first solo exhibition at the gallery. 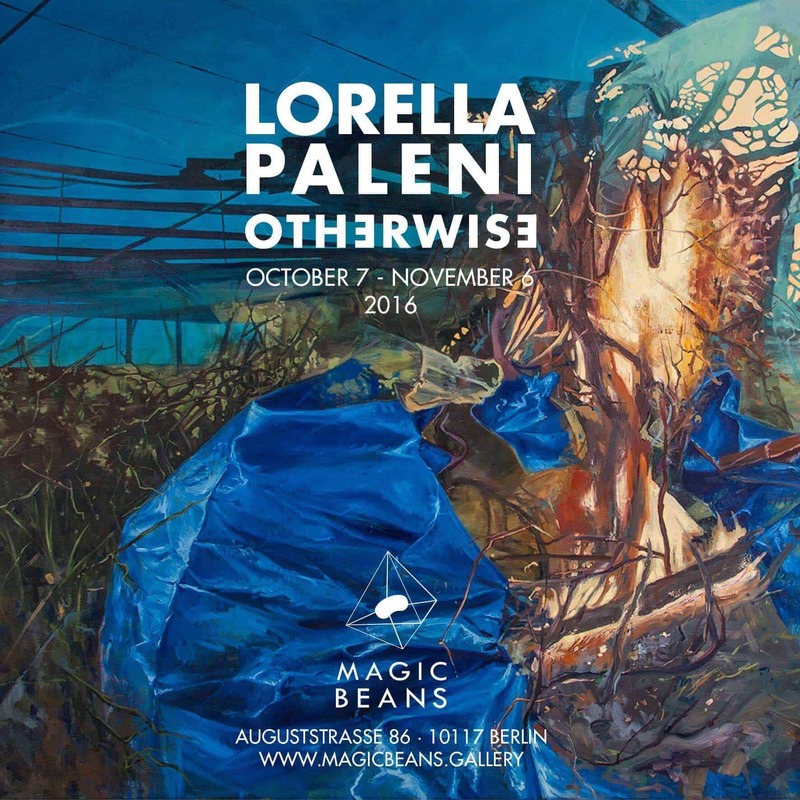 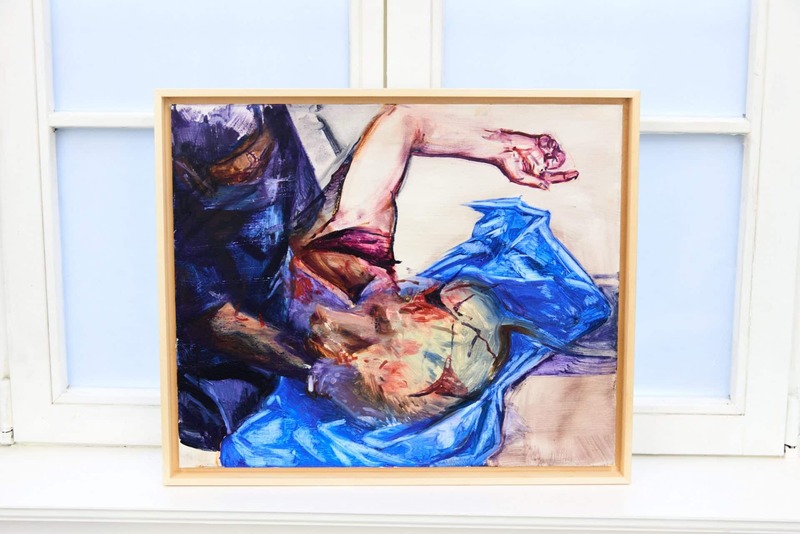 This exhibition includes recent paintings that explore the predicaments, dreams and fears that challenge contemporary humanity. 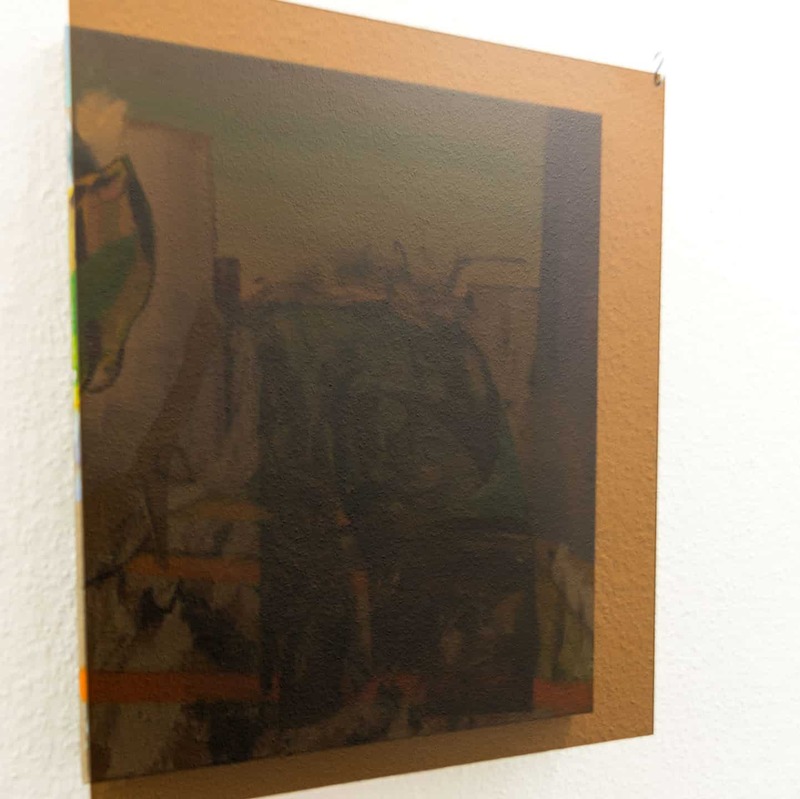 In many of Gonella’s paintings in this exhibition we see a striking pathos. 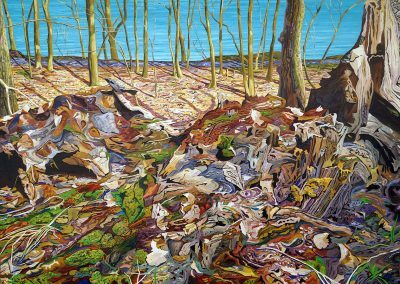 Post-apocalyptic, dystopian and mysterious landscapes where the uncertain horizon appears like a mirage, are fascinating and disquieting at the same time. 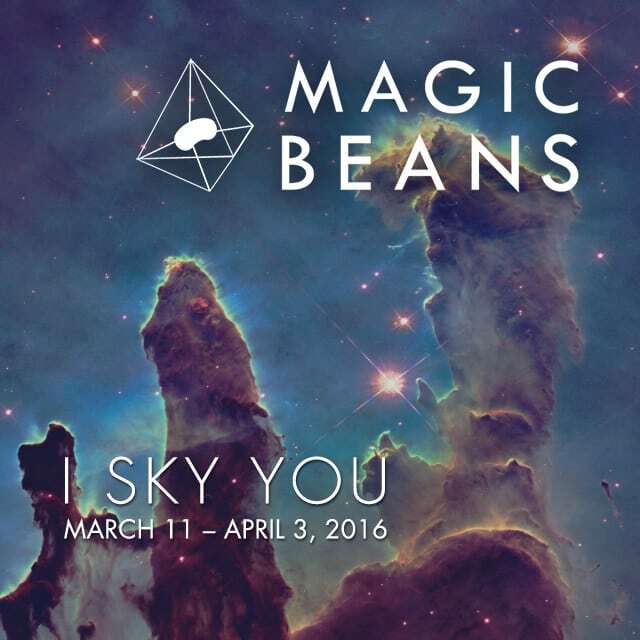 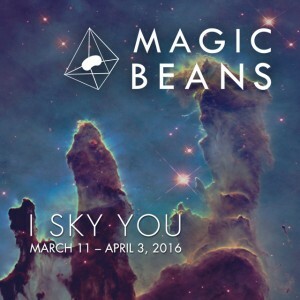 Magic Beans is pleased to present our first exhibition, “I Sky You”, on view March 11 – April 3, 2016. “You rain on me, I sky you” is a quote extracted from Frida Kahlo ́s diary. 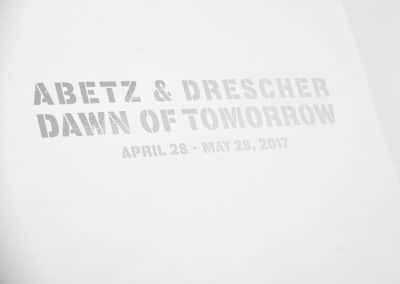 As one of the most fascinating and sensitive artists of the twentieth century, we are honored to bring her spirit into our first exhibition. 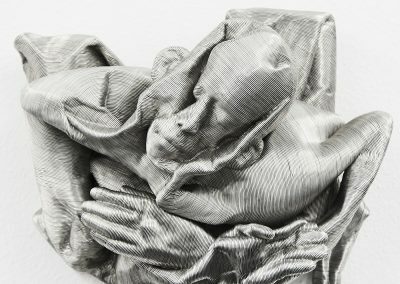 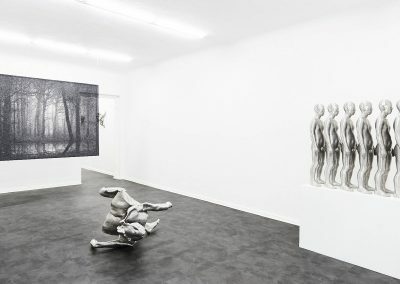 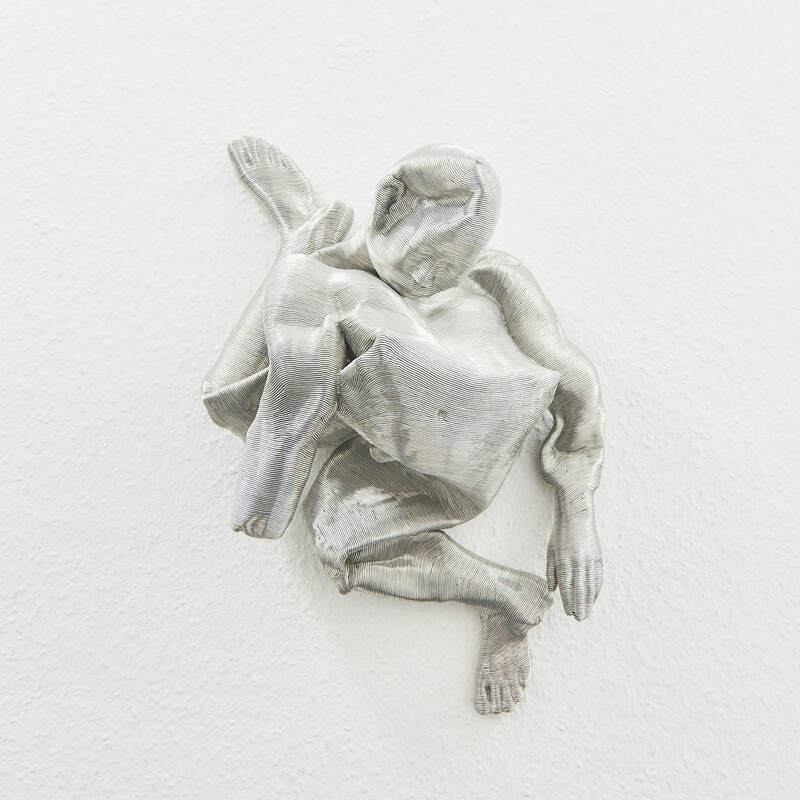 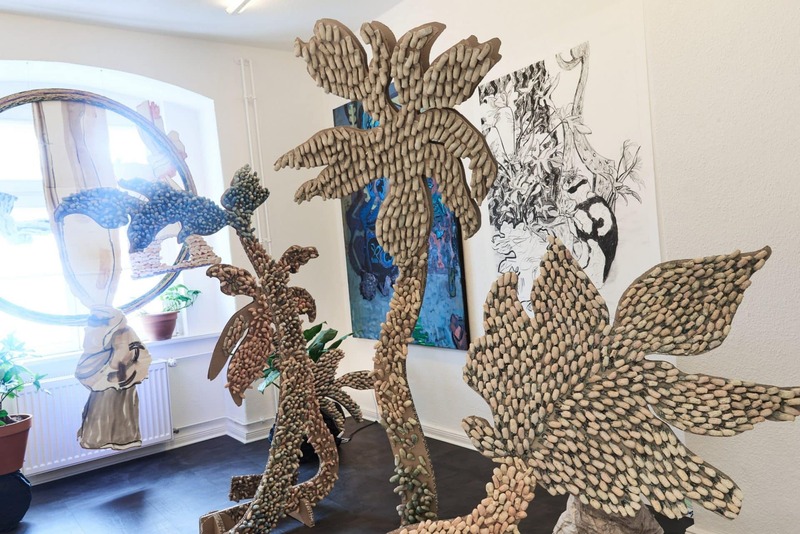 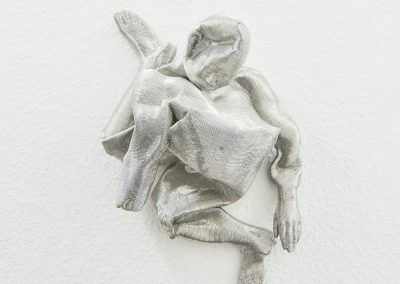 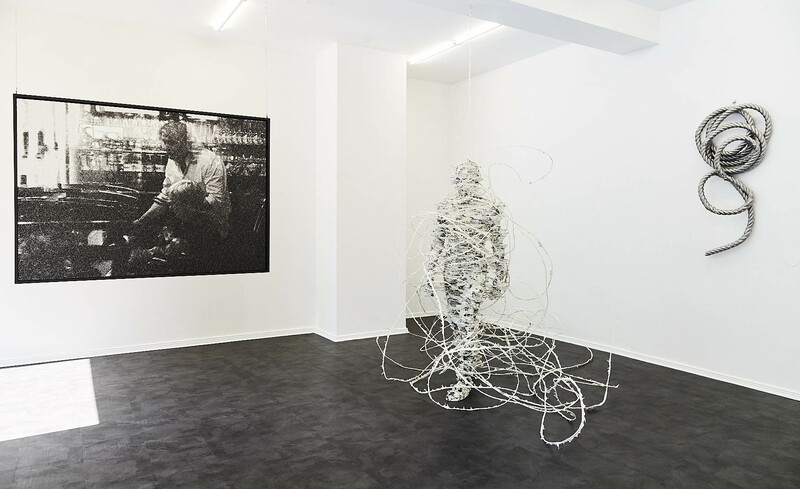 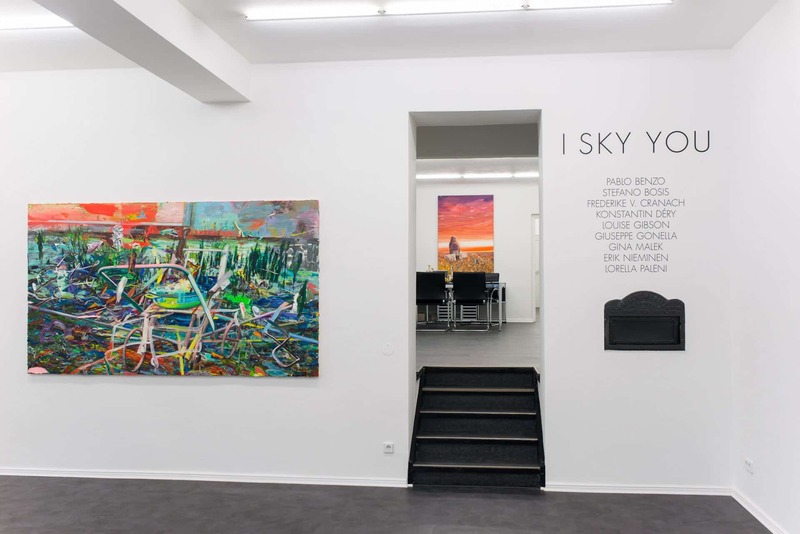 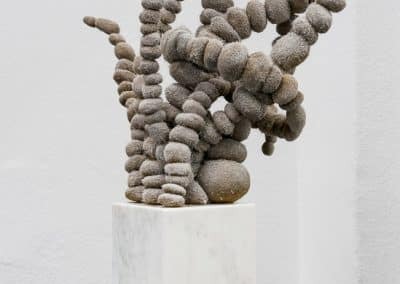 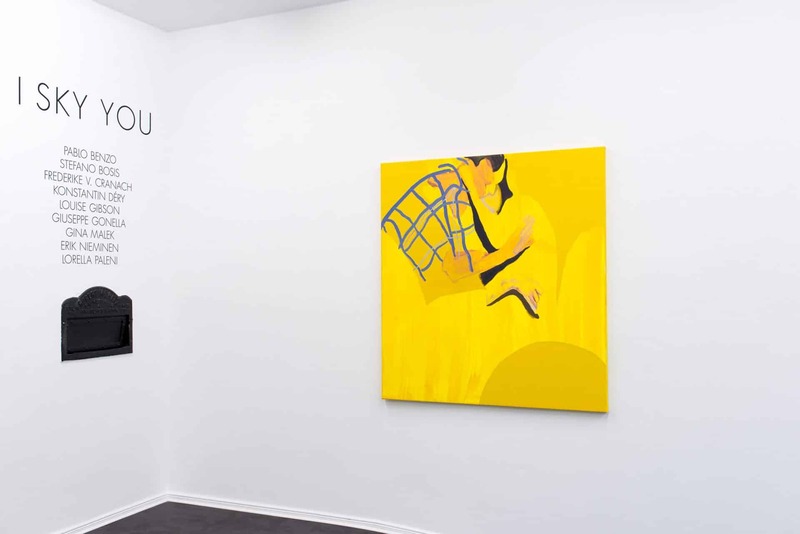 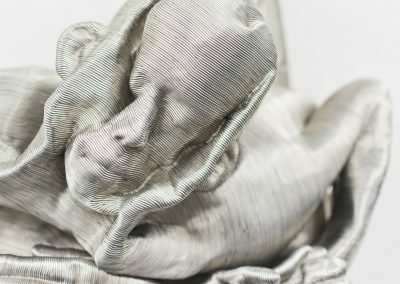 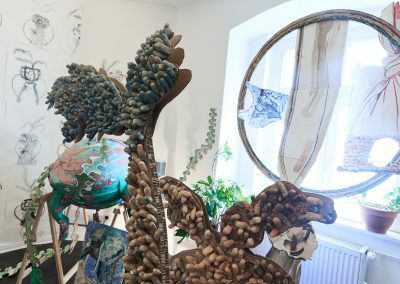 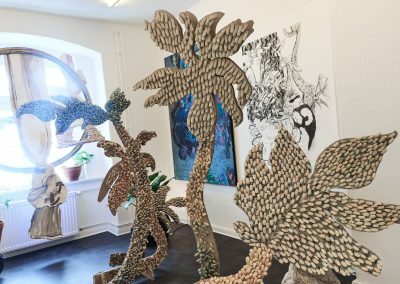 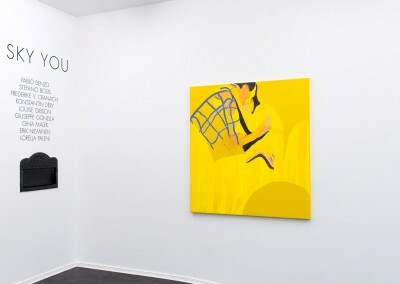 “I Sky You“ represents fragile poetry, the balance and interplay of painting and sculpture – nine international newcomers including Pablo Benzo, Stefano Bosis, Frederike von Cranach, Konstantin Dery, Louise Gibson, Giuseppe Gonella, Gina Malek, Erik Nieminen and Lorella Paleni. 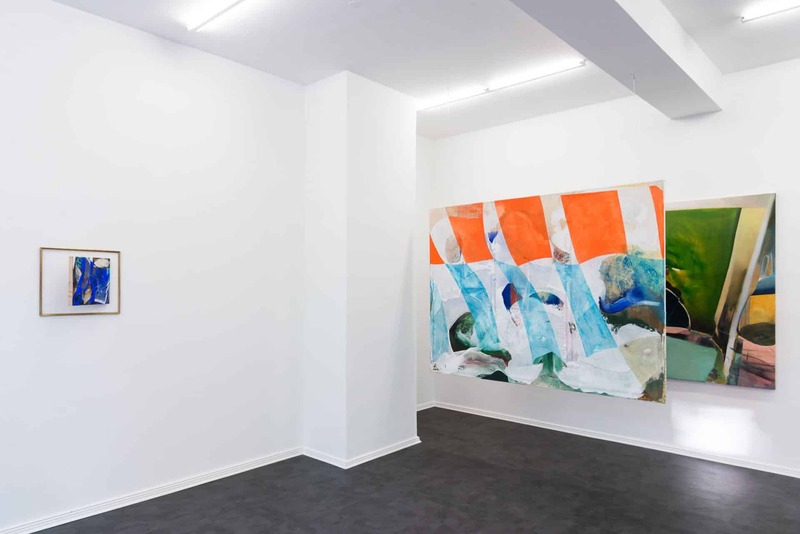 The works combine an abstraction of form and a passion for color, though they could not be more divergent.